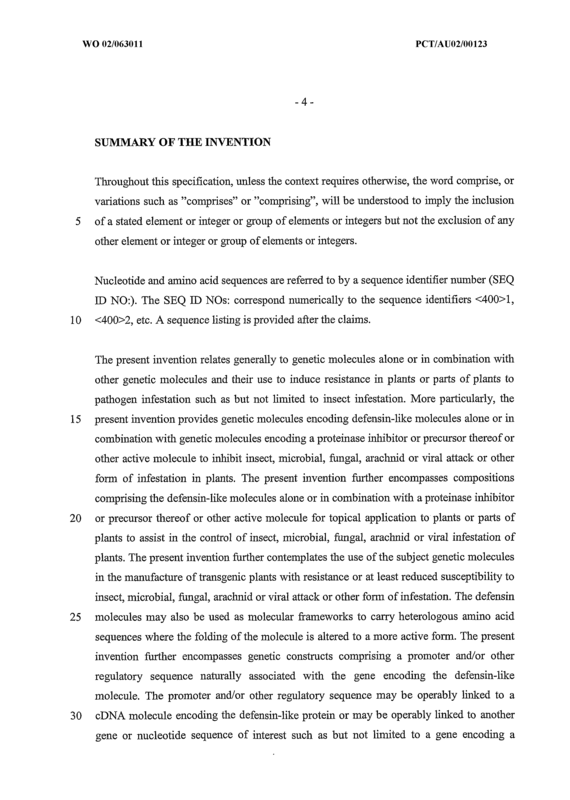 The present invention provides genetic molecules encoding plant floral defensin-like molecules and their use in generating transgenic plants having resistance or at least reduced sensitivity to plant pests including insects, microorganisms, fungi and/or viruses. 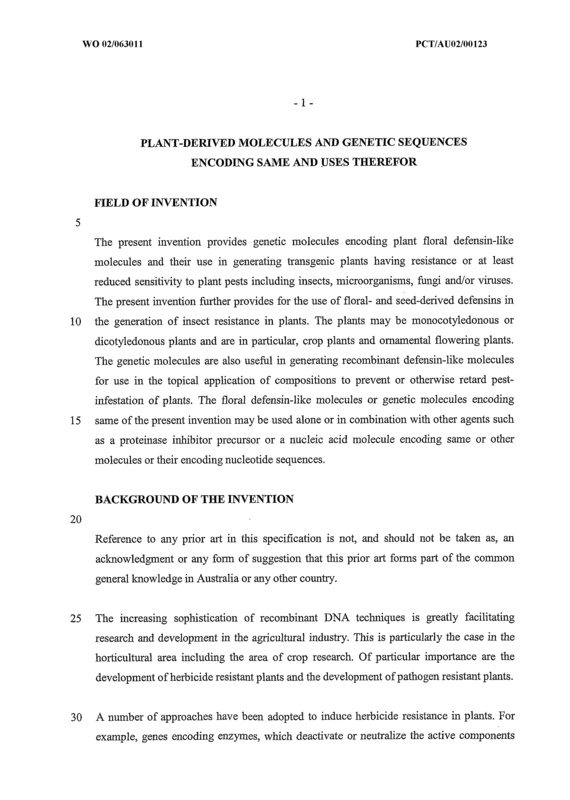 The present invention further provides for the use of floral- and seed-derived defensins in the generation of insect resistance in plants. 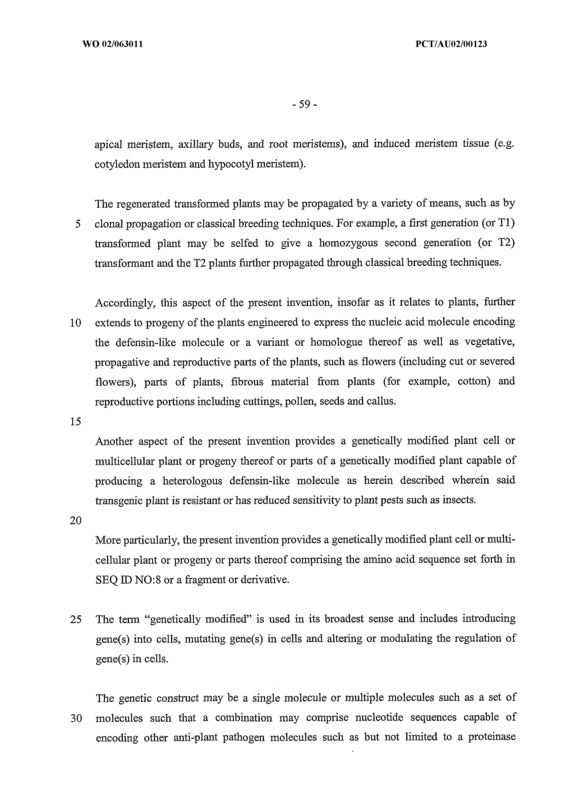 The plants may be monocotyledonous or dicotyledonous plants and are in particular, crop plants and ornamental flowering plants. 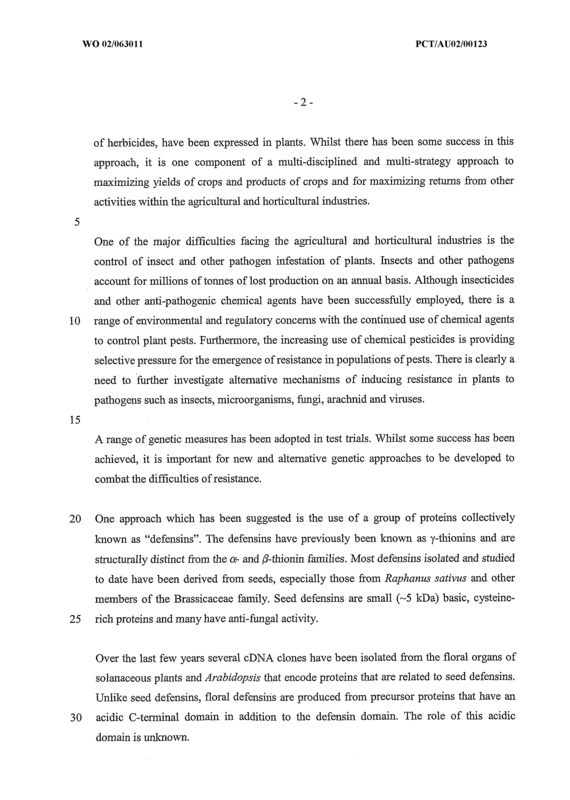 The genetic molecules are also useful in generating recombinant defensin-like molecules for use in the topical application of compositions to prevent or otherwise retard pest-infestation of plants. 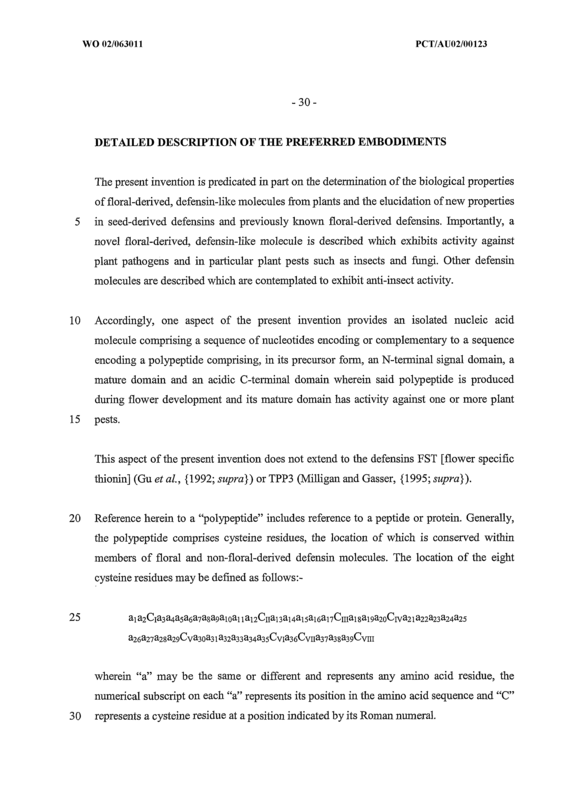 The floral defensin-like molecules or genetic molecules encoding same of the present invention may be used alone or in combination with other agents such as a proteinase inhibitor precursor or a nucleic acid molecule encoding same or other molecules or their encoding nucleotide sequences. 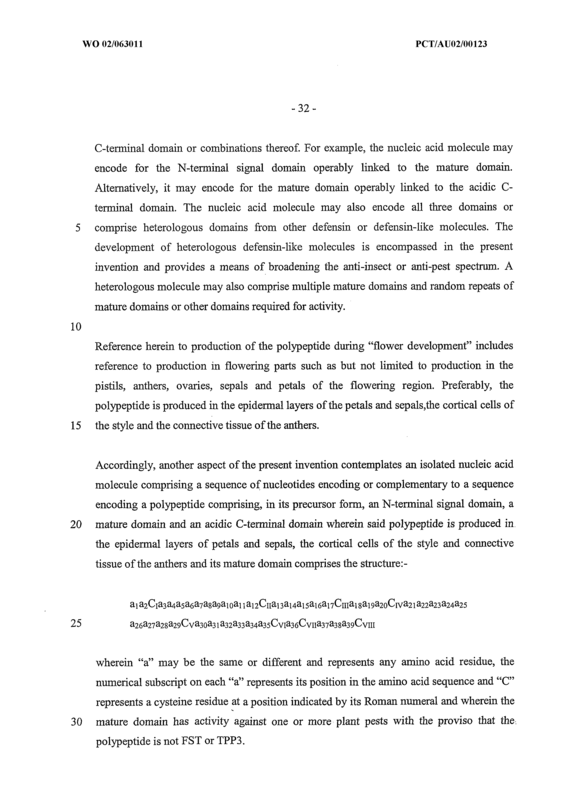 An isolated nucleic acid molecule comprising a sequence of nucleotides encoding or complementary to a sequence encoding a polypeptide comprising, in its precursor form, an N-terminal signal domain, a mature domain and an acidic C-terminal domain wherein said polypeptide is produced during flower development and its mature domain has activity against one or more plant pests. 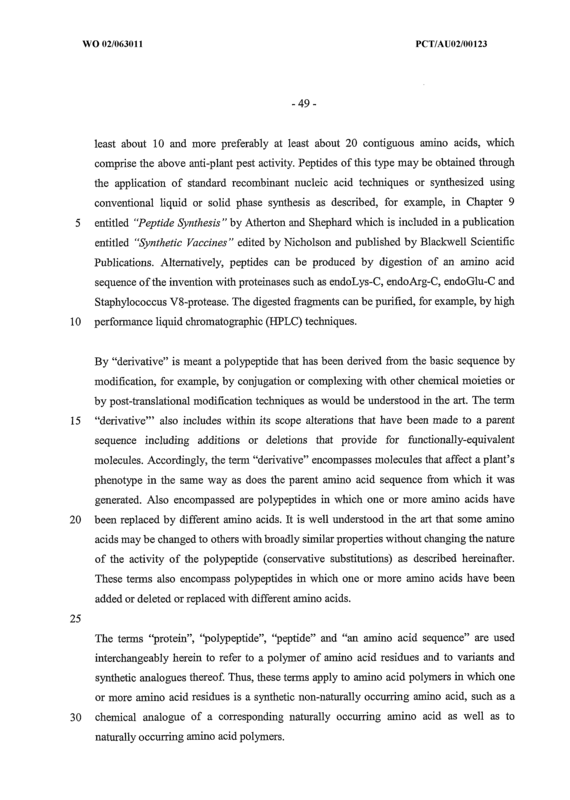 wherein "a" may be the same or different and represents any amino acid residue and the numerical subscript on each "a" represents its position in the amino acid sequence and "C" represents a cysteine residue at a position indicated by its Roman numeral and wherein the mature domain has activity against one or more plant pests with the proviso that the polypeptide is not FST or TPP3. 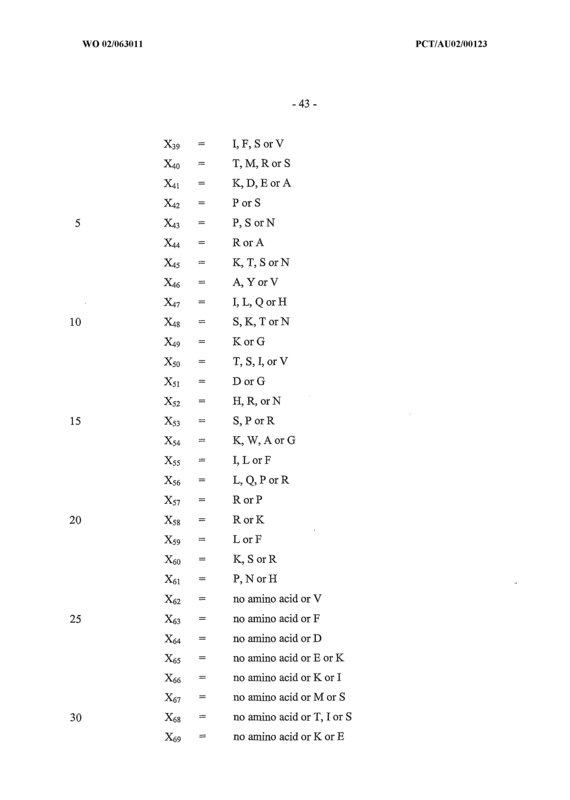 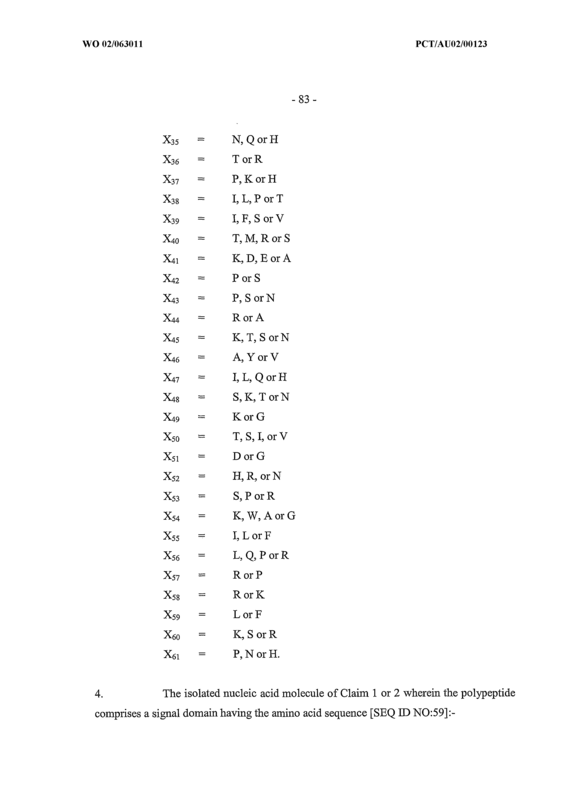 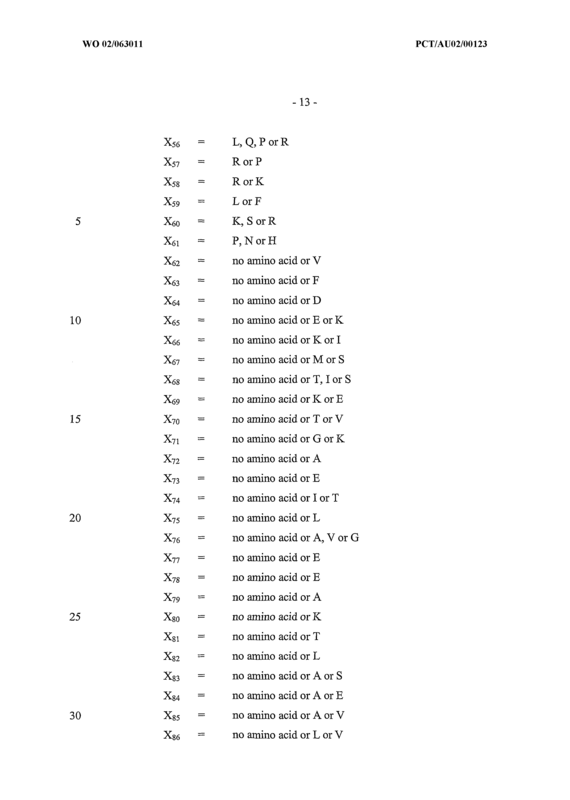 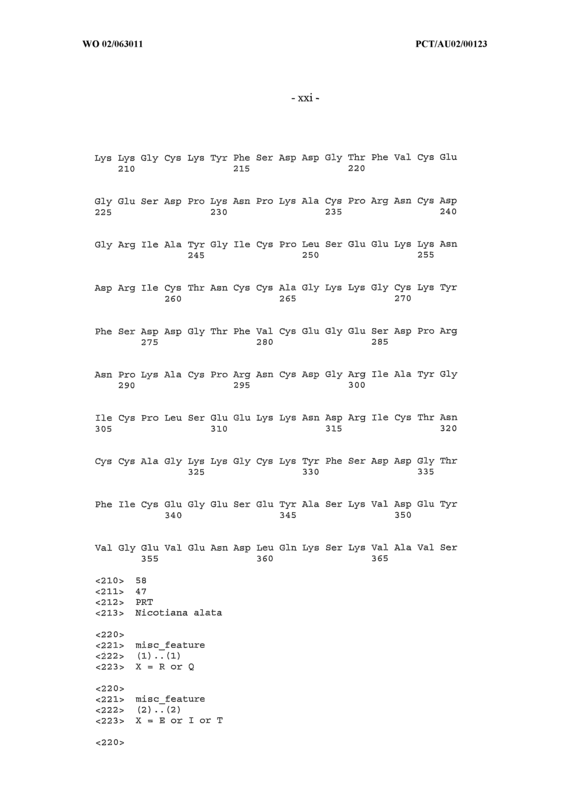 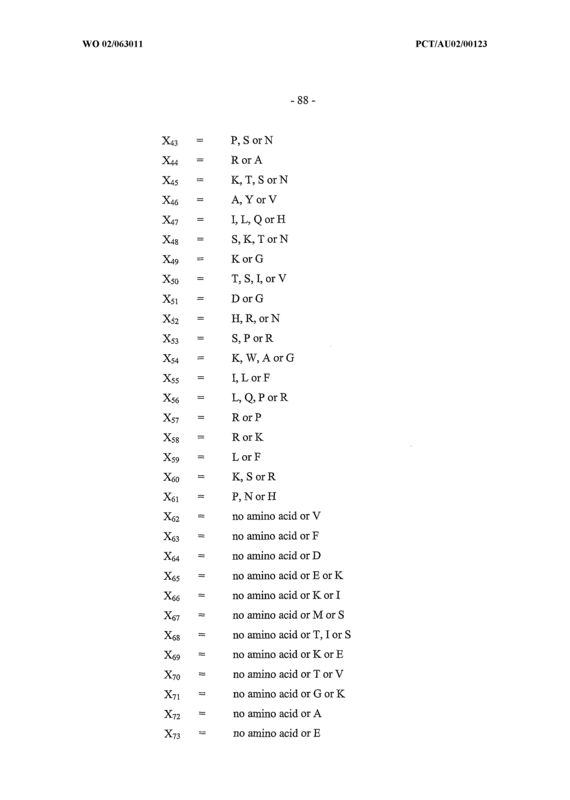 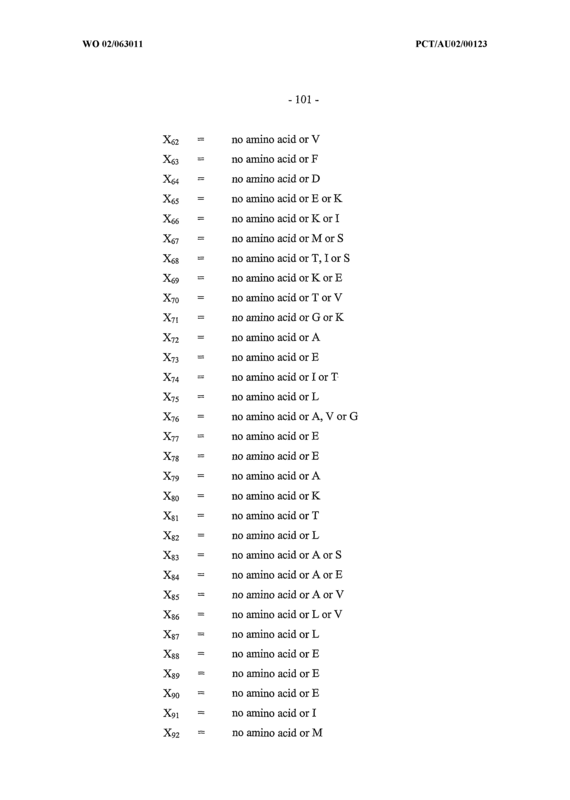 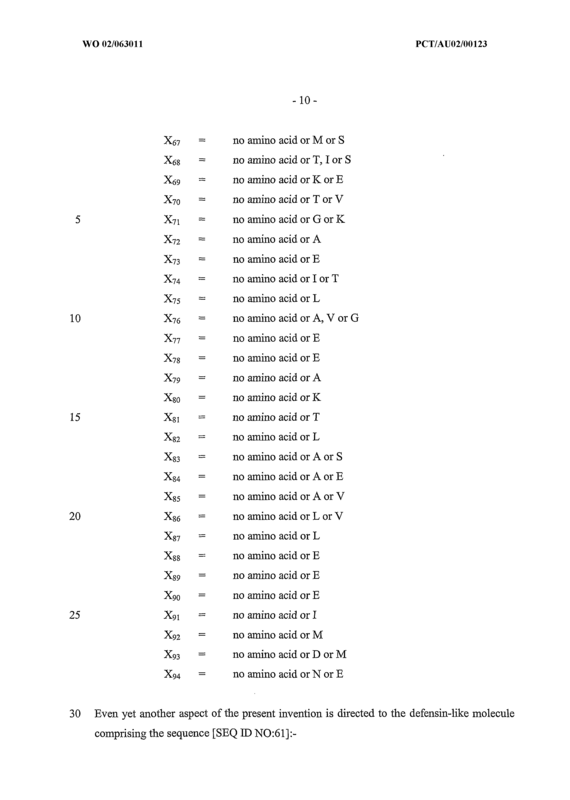 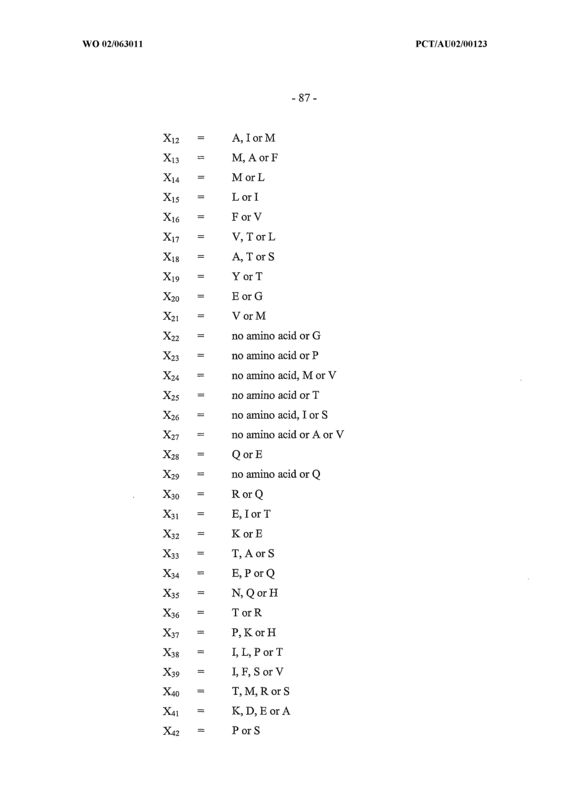 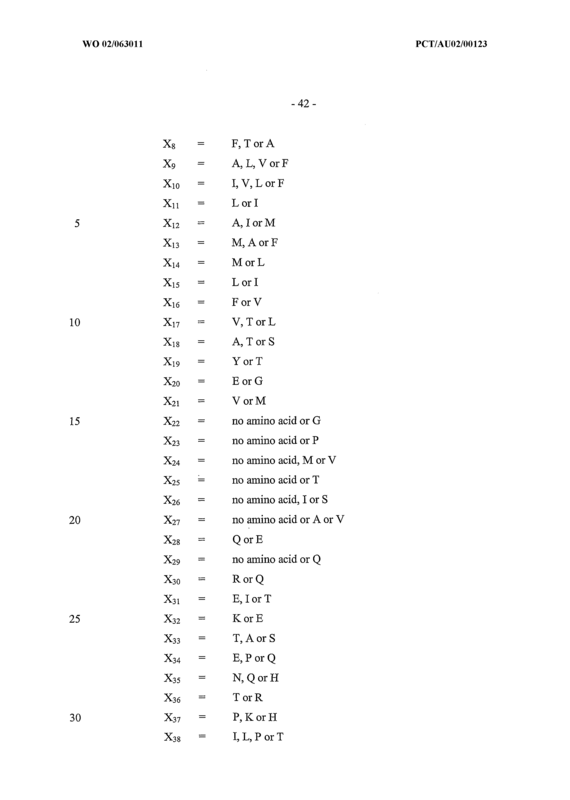 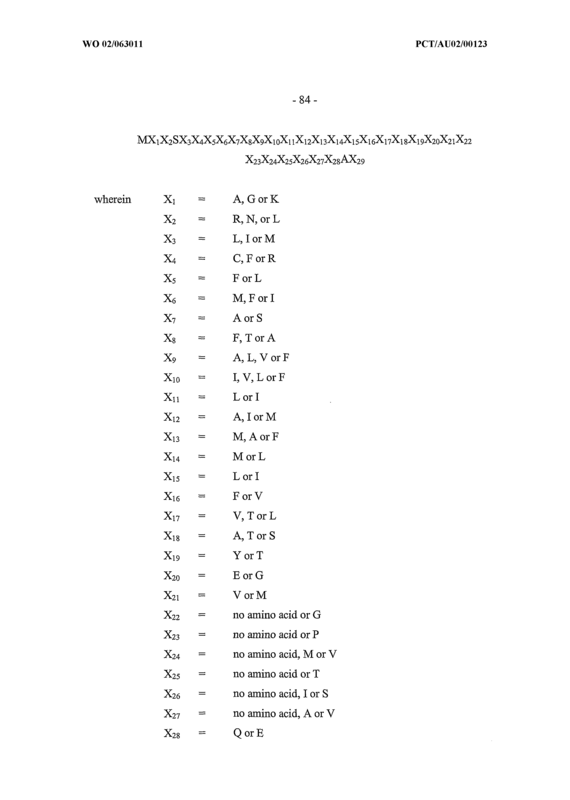 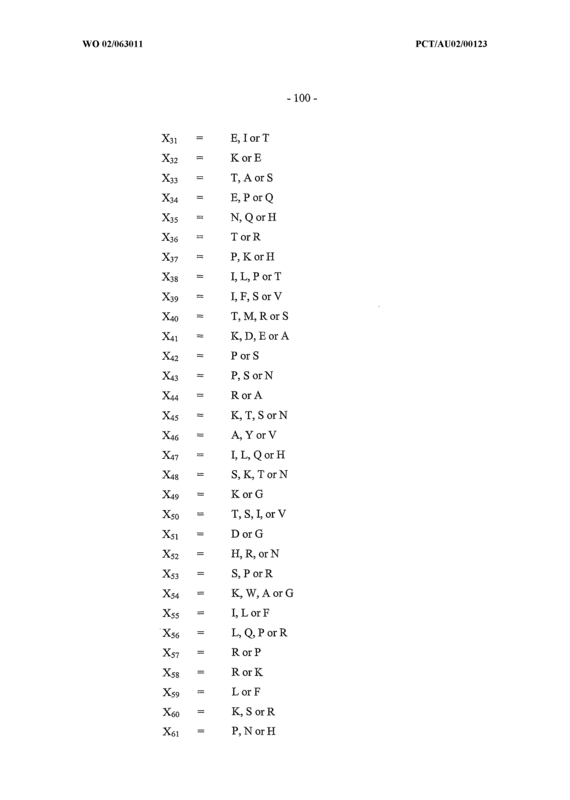 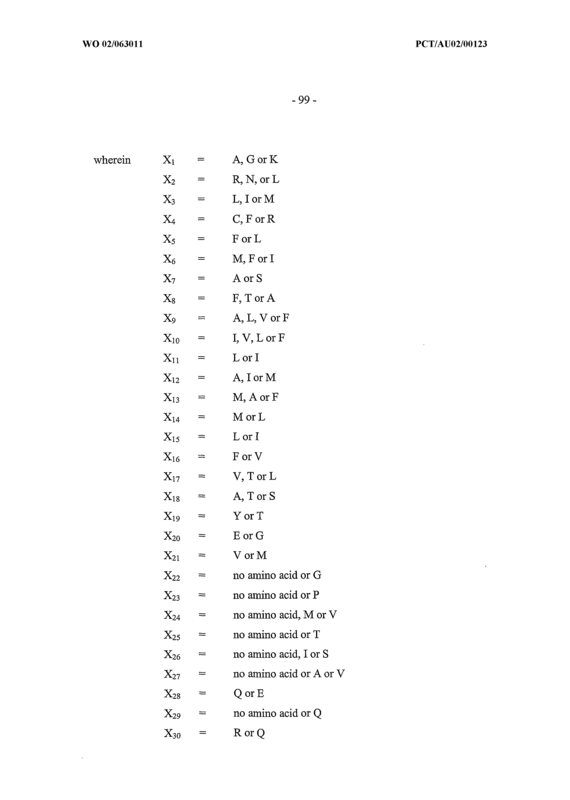 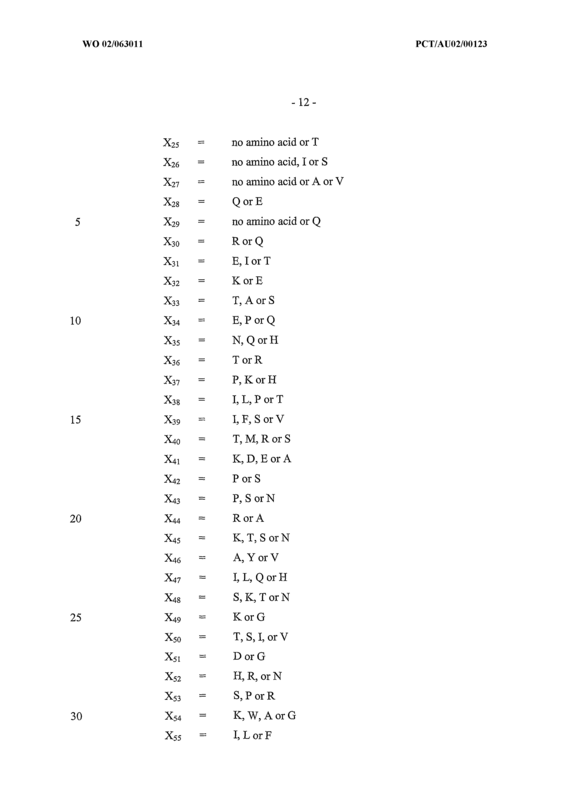 X27 = no amino acid, A or V X29 = no amino acid or Q.
Xβ5 no amino acid or E or K Xδ6 no amino acid or K or I Xδ7 no amino acid or M or S Xδ8 no amino acid or T, I or S Xό9 no amino acid or K or E X70 no amino acid or T or V X7I no amino acid or G or K X72 no amino acid or A X73 no amino acid or E X74 no amino acid or I or T X75 no amino acid or L X76 no amino acid or A, V or G X77 no amino acid or E X78 no amino acid or E X79 no amino acid or A XδO no amino acid or K Xδl no amino acid or T Xδ2 no amino acid or L Xδ3 no amino acid or A or S Xδ4 no amino acid or A or E Xδ5 no amino acid or A or N Xδ6 no amino acid or L or N Xδ7 no amino acid or L Xδ8 no amino acid or E Xδ9 no amino acid or E X90 no amino acid or E X9I no amino acid or I X92 no amino acid or M X93 no amino acid or D or M X94 no amino acid or Ν or E.
X90 no amino acid or E X9I no amino acid or I X92 no amino acid or M X93 no amino acid or D or M X94 no amino acid or Ν or E.
The isolated nucleic acid molecule of Claim 1 wherein the nucleic acid is DΝA. 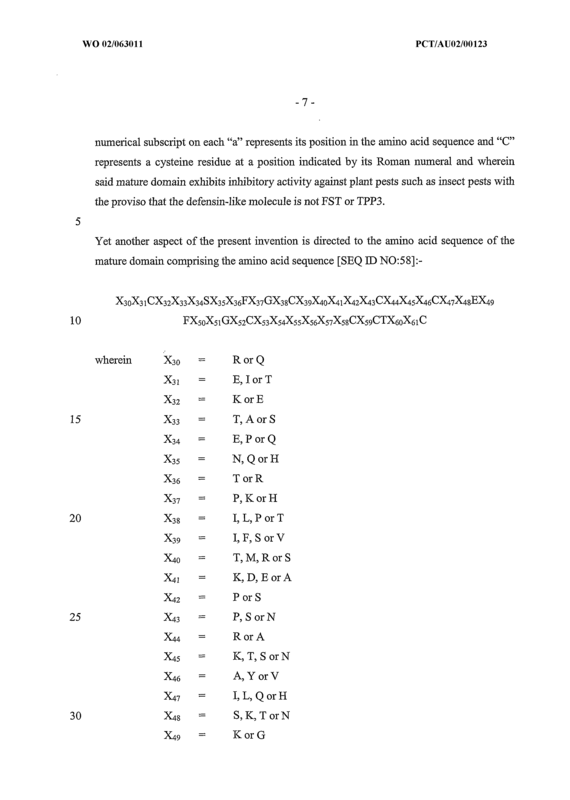 The isolated nucleic acid molecule of Claim 1 wherein the nucleic acid is RΝA. 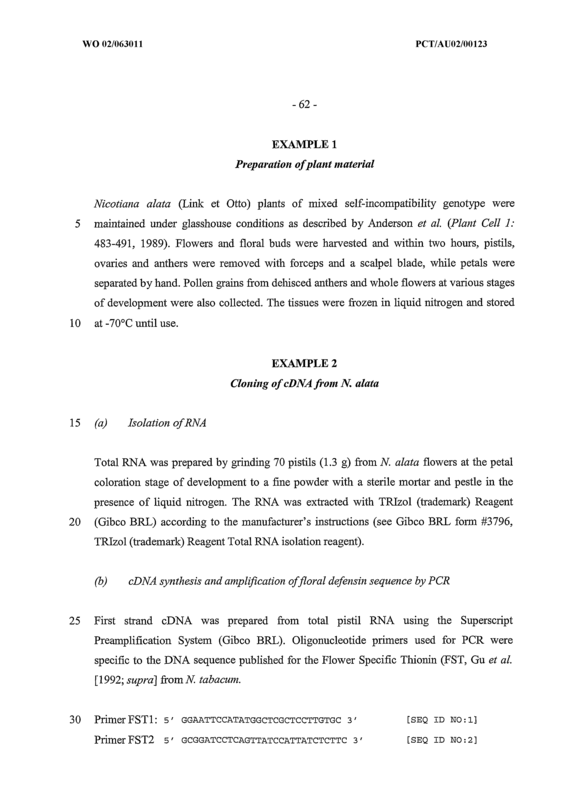 The isolated nucleic acid molecule of Claim 1 wherein the polypeptide is produced in one or more of pistils, ovaries or anthers of flowers of a plant. 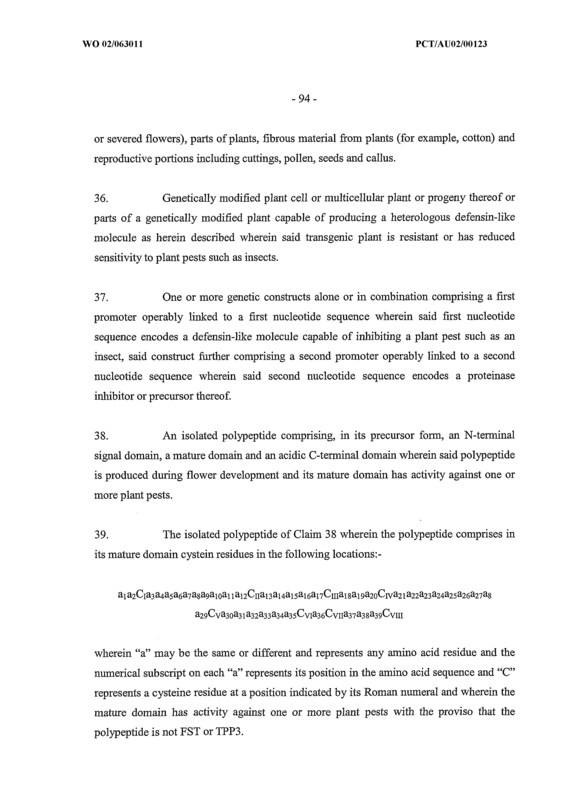 The isolated nucleic acid molecule of Claim 1 wherein the polypeptide is produced in pistils of flowers of a plant. 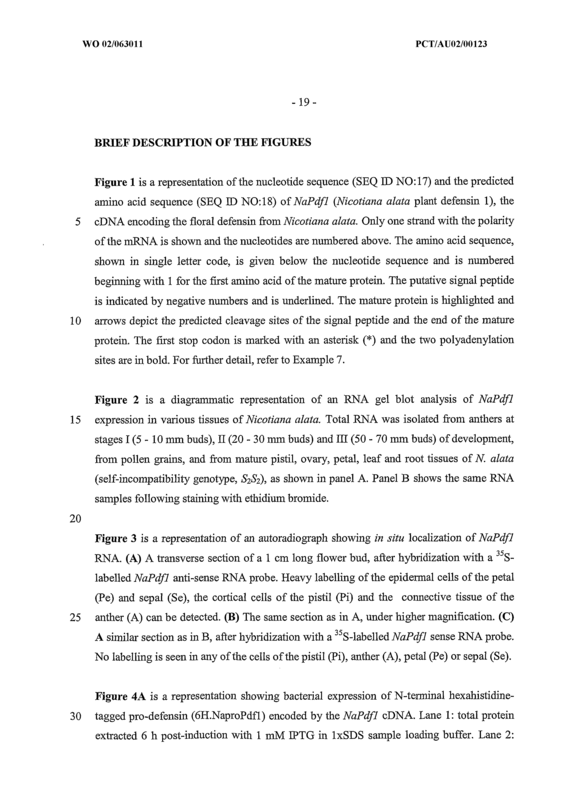 The isolated nucleic acid molecule of Claim 1 wherein the polypeptide is produced in epidermal layers of petals and sepals, cortical cells of a style and/or the connective tissue of anther. 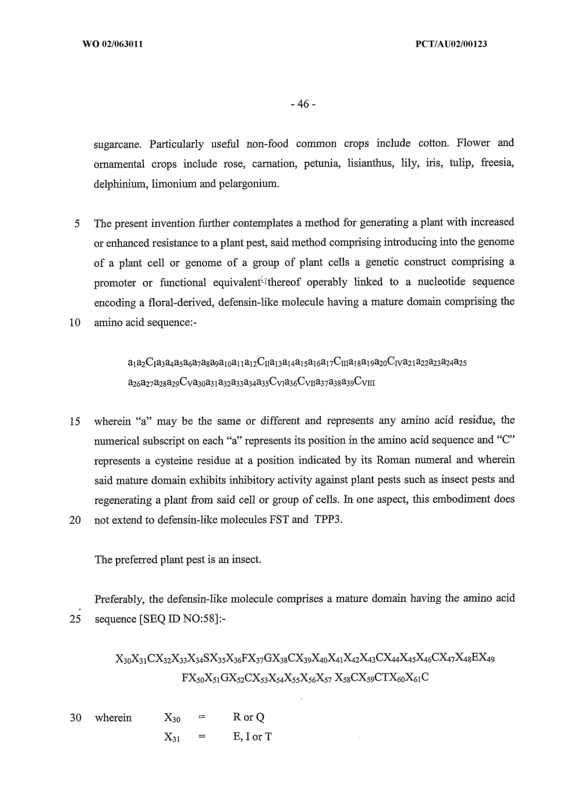 The isolated nucleic acid molecule of Claim 1 wherein the plant pest is an insect. 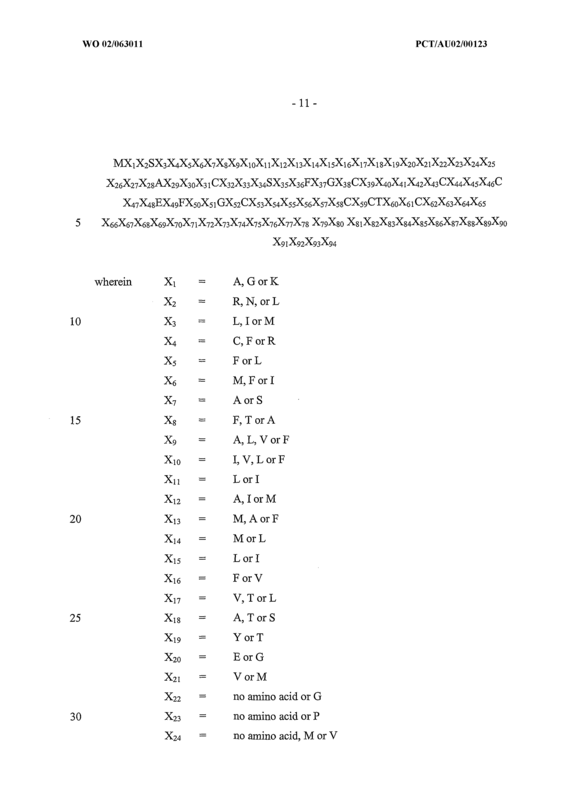 The isolated nucleic acid molecule of Claim 1 wherein the nucleic acid molecule is isolatable from Nicotiana alata or varieties or strains thereof. 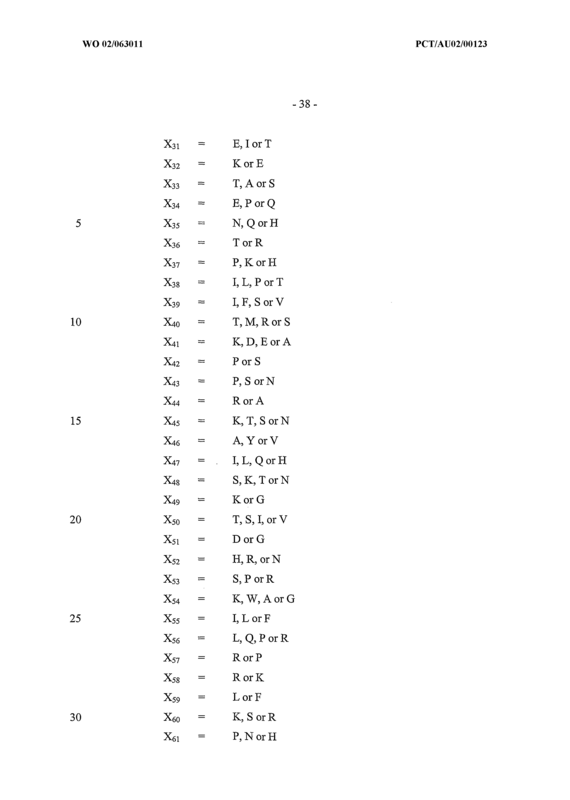 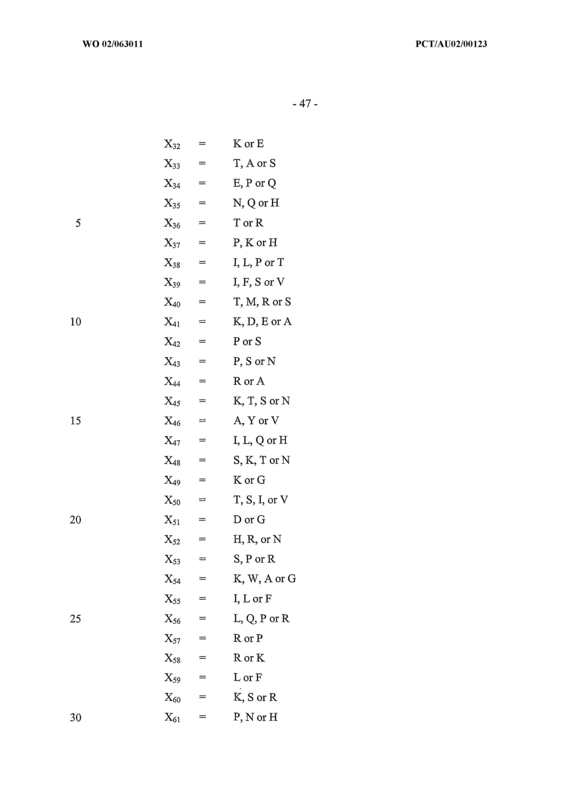 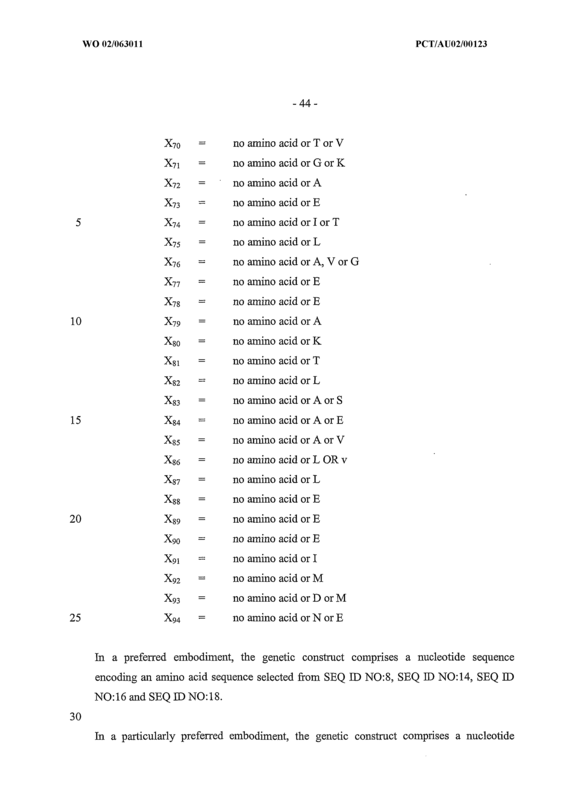 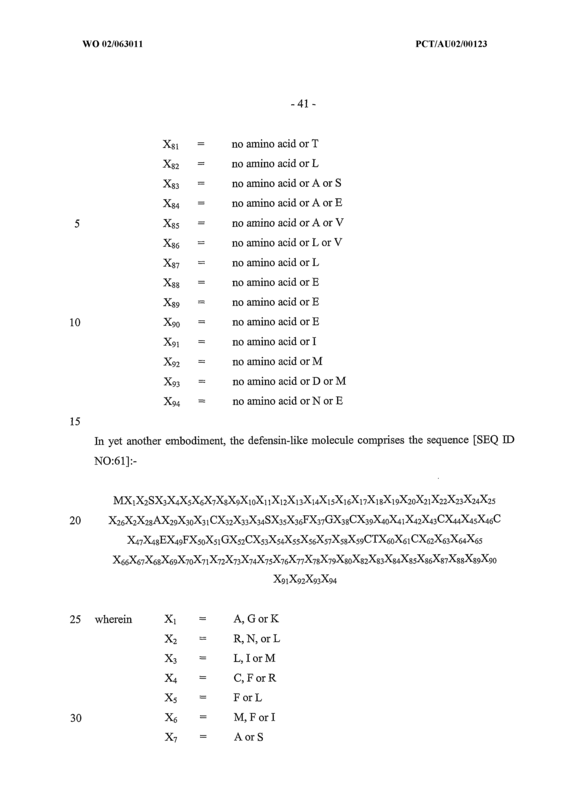 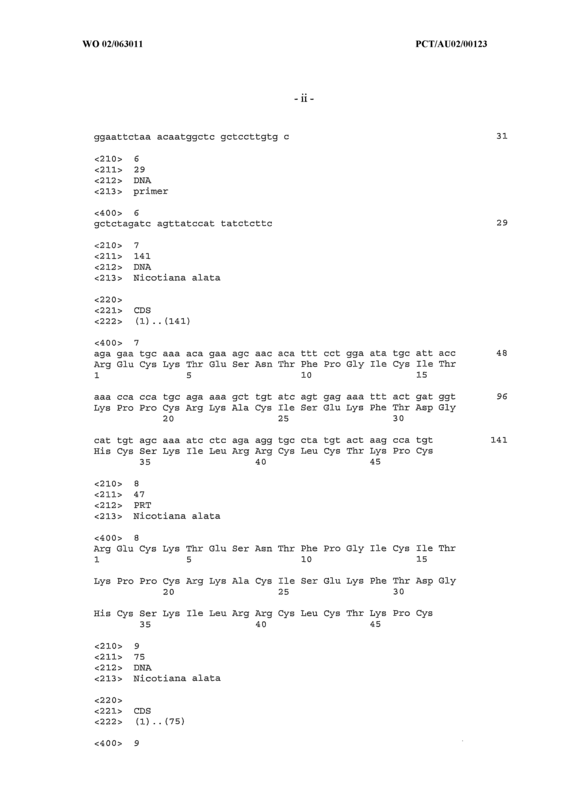 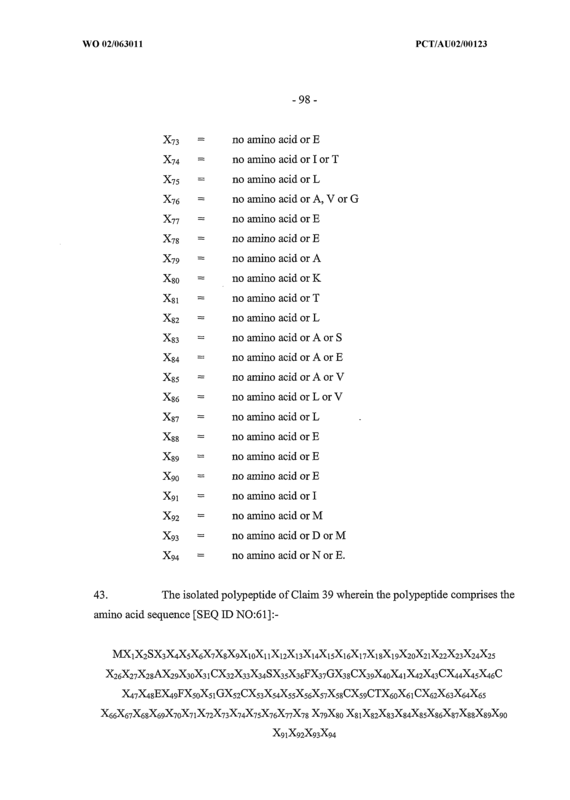 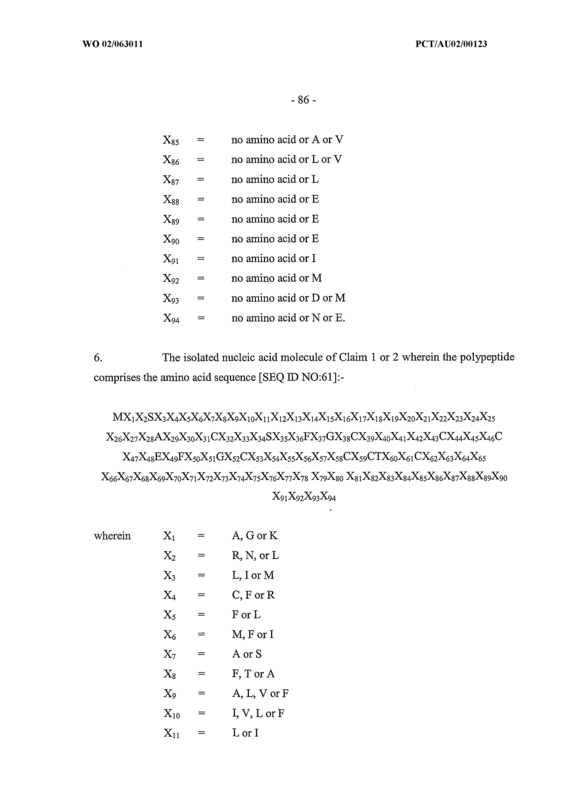 The isolated nucleic acid molecule of Claim 13 wherein the polypeptide comprises an amino acid sequence in the mature domain as set forth in SEQ ED NO: 8 or an amino acid sequence having at least 70% similarity to SEQ ED NO: 8 after optimal alignment. 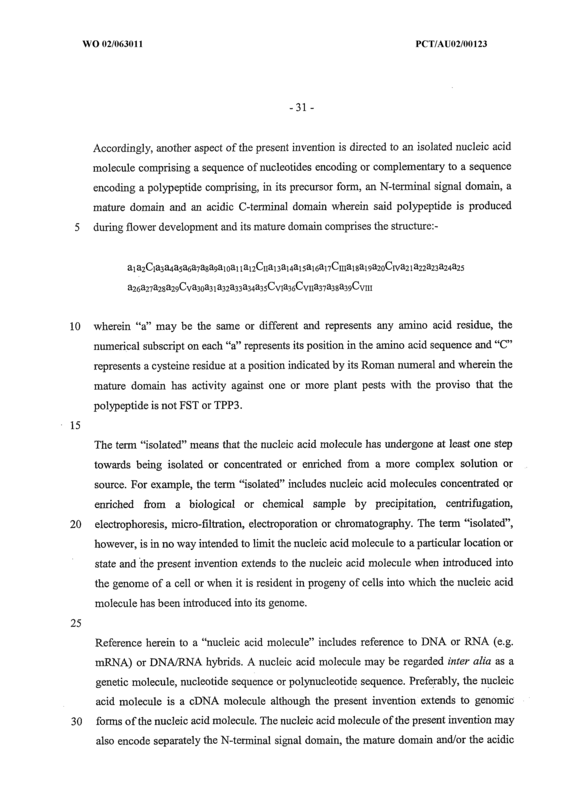 The isolated nucleic acid molecule of Claim 13 comprising a sequence of nucleotides encoding the mature domain as set forth in SEQ ID NO: 7 or a nucleotide sequence having at least about 70% similarity to SEQ JD NO:7 or a nucleotide sequence capable of hybridizing to SEQ ED NO: 7 or its complementary form under low stringency conditions. 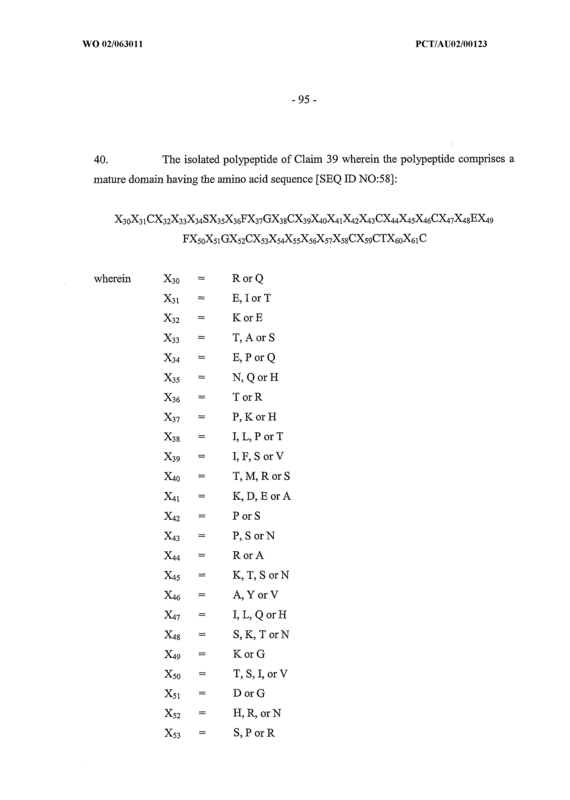 The isolated nucleic acid molecule of Claim 13 wherem the polypeptide comprises an amino acid sequence as set forth in SEQ ED NO: 8. 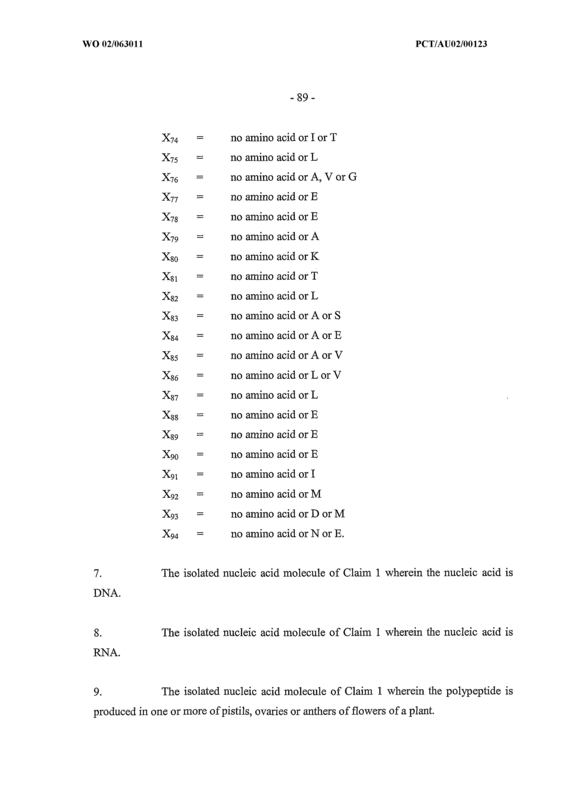 The isolated nucleic acid molecule of Claim 13 comprising the nucleotide sequence set forth in SEQ JD NO:7. 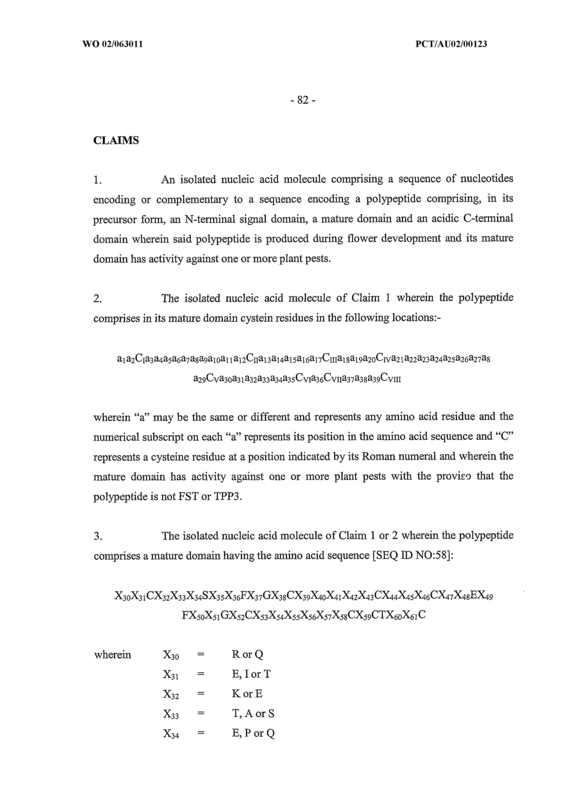 The isolated nucleic acid molecule of Claim 1 or 13 contained in a construct operably linked to a promoter. 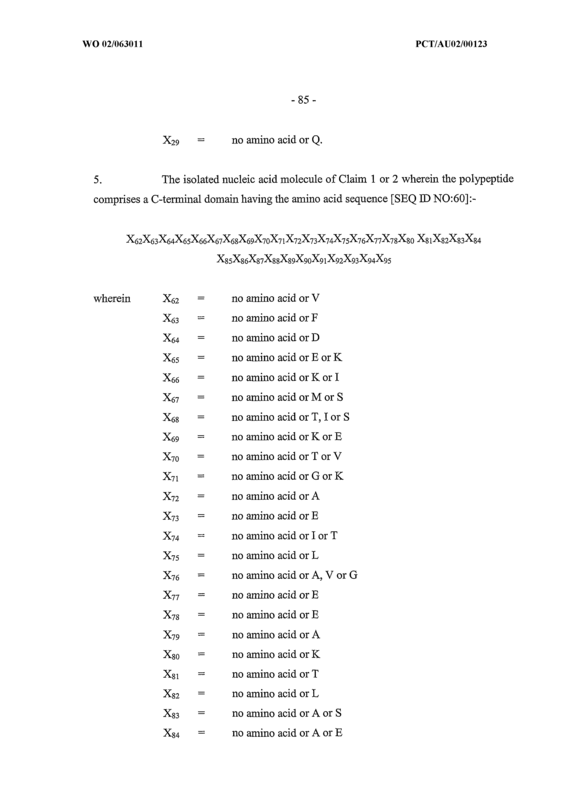 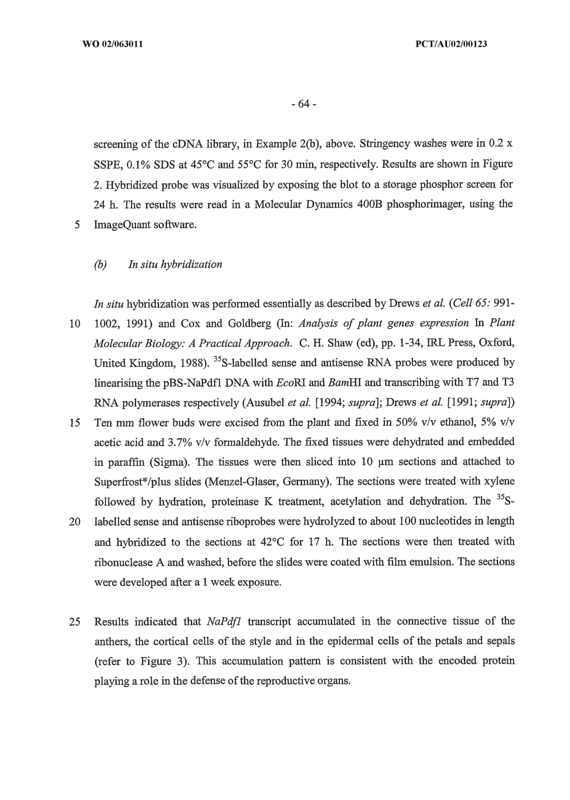 The isolated nucleic acid molecule of Claim 1 wherein the polypeptide comprises an amino acid sequence selected from SEQ ED NO: 8, SEQ ED NO: 14, SEQ ED NO:16 and SEQ ED NO:18 or an amino acid sequence having at least about 70%> similarity to any one of SEQ JD NO:8, SEQ ED NO:14, SEQ ID NO:16 and SEQ ED NO:18. 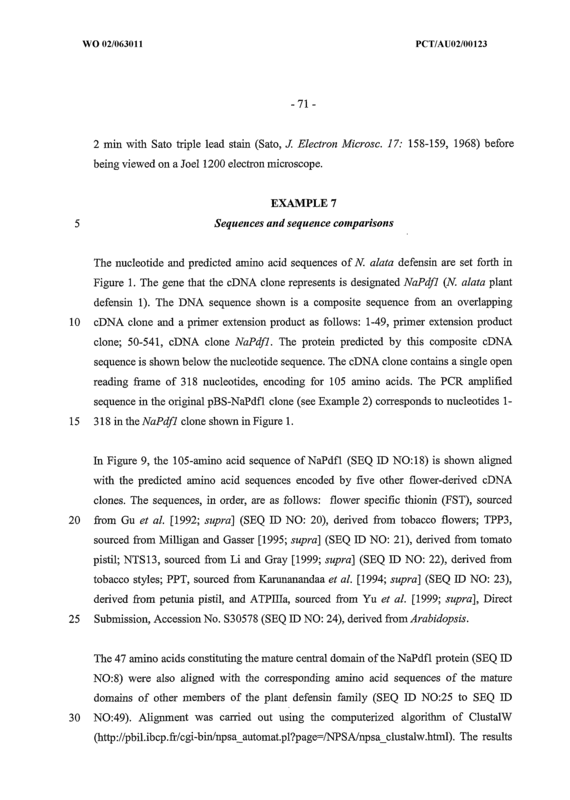 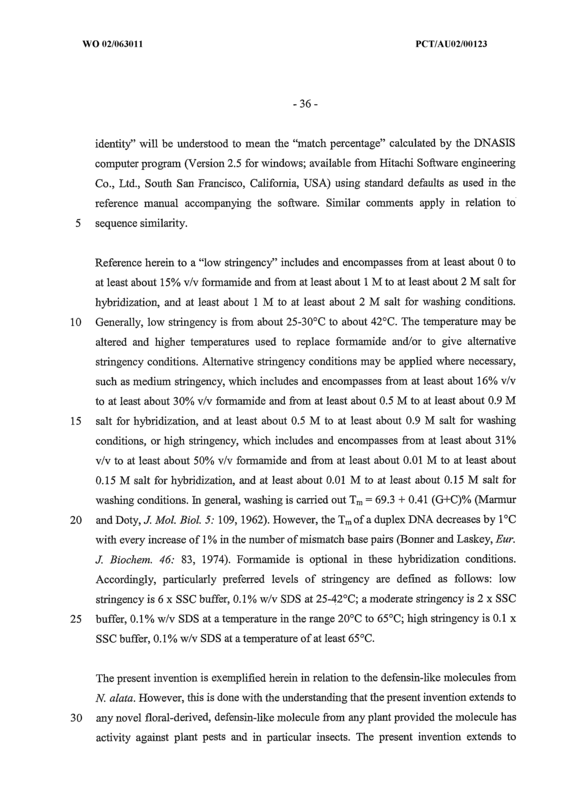 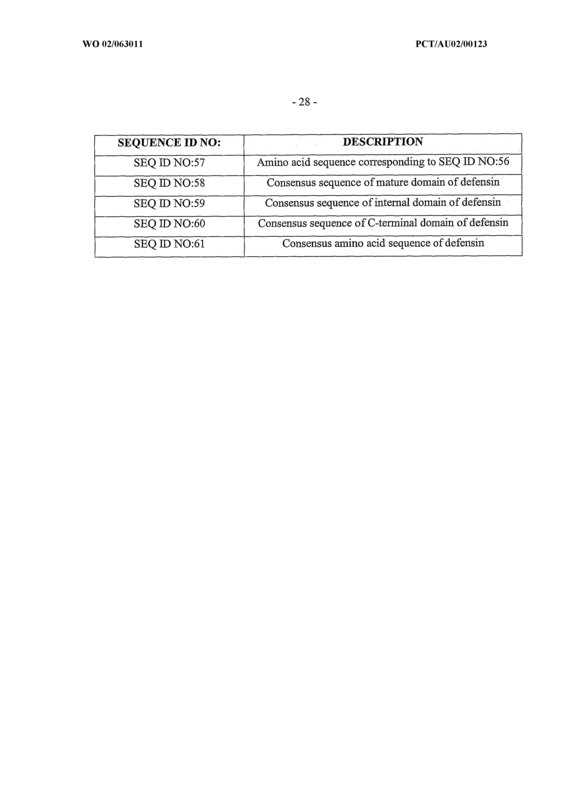 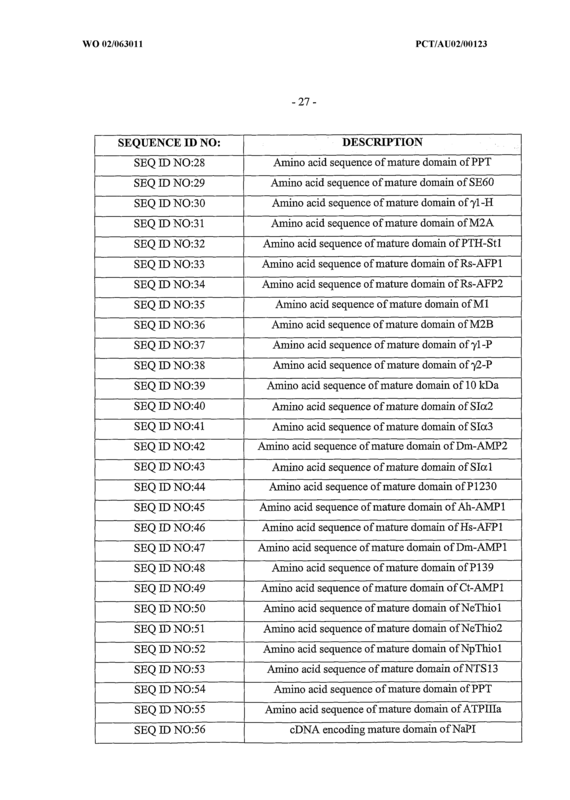 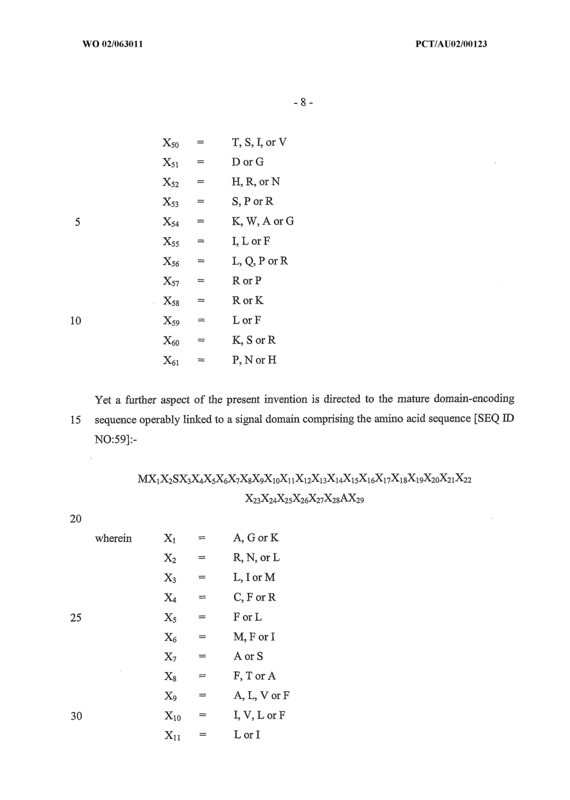 The isolated nucleic acid molecule of Claim 1 wherein the nucleic acid molecule comprises a nucleotide sequence selected from SEQ JD NO:7, SEQ ED NO: 13, SEQ ED NO: 15 and SEQ ID NO: 17 or a nucleotide sequence having at least about 70% similarity to one of SEQ JD NO:7, SEQ ED NO:13, SEQ ED NO:15 and SEQ LD NO:17 or a nucleotide sequence of a nucleic acid molecule capable of hybridizing to one of SEQ ED NO:7, SEQ ID NO: 13, SEQ ED NO: 15 and SEQ ED NO: 17 or their complementeary forms under low stringency conditions. 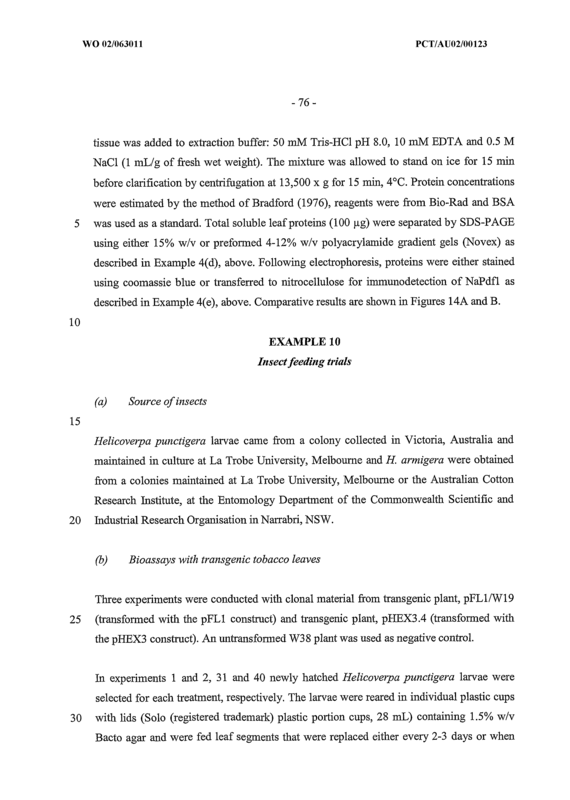 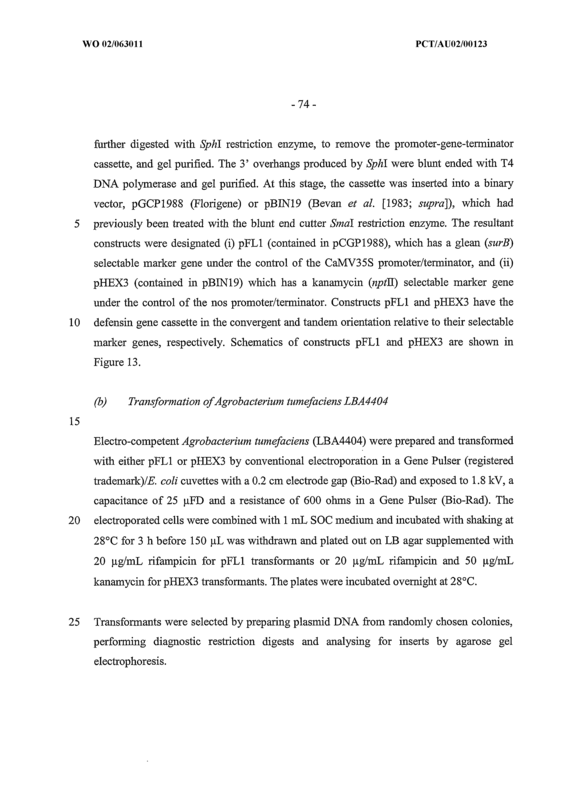 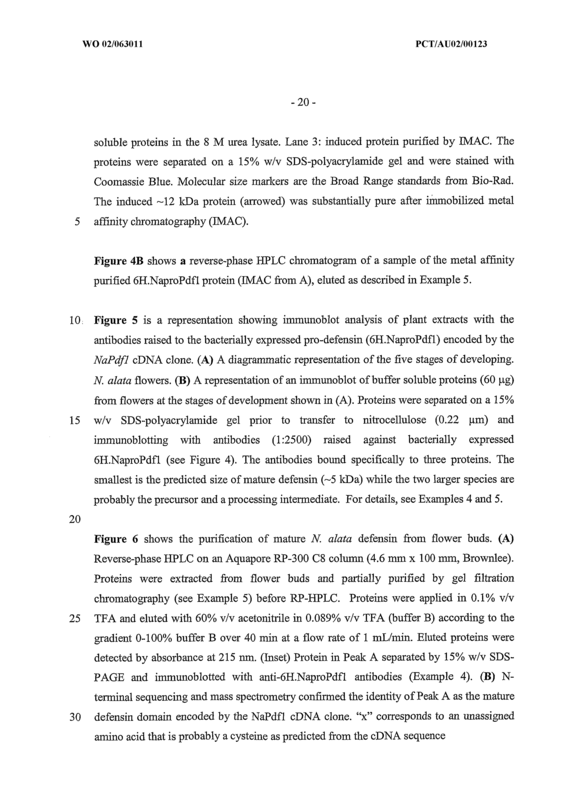 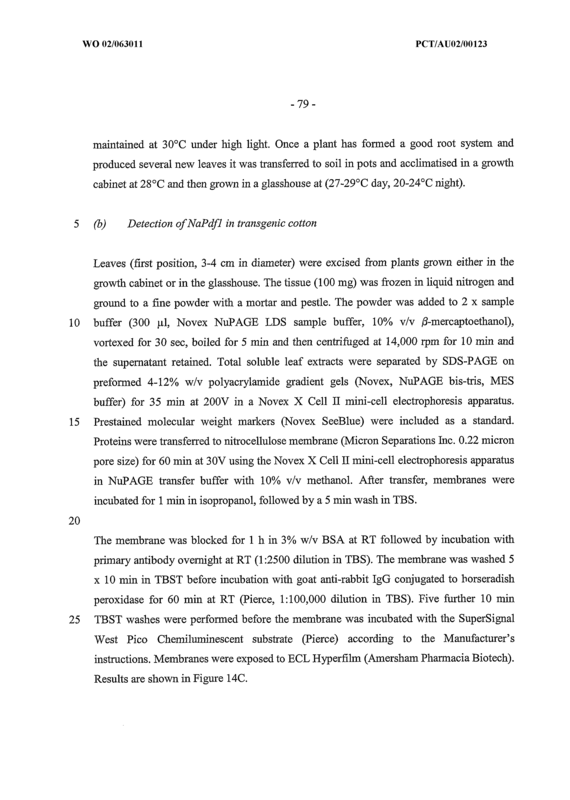 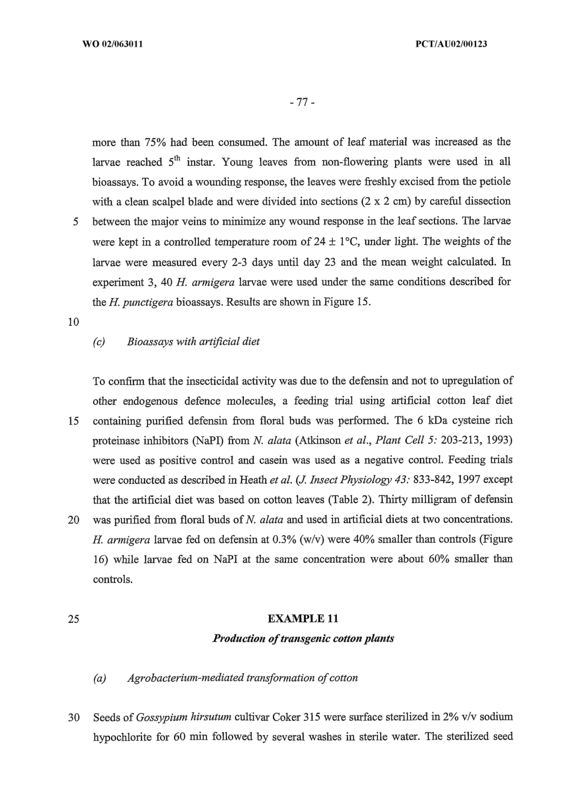 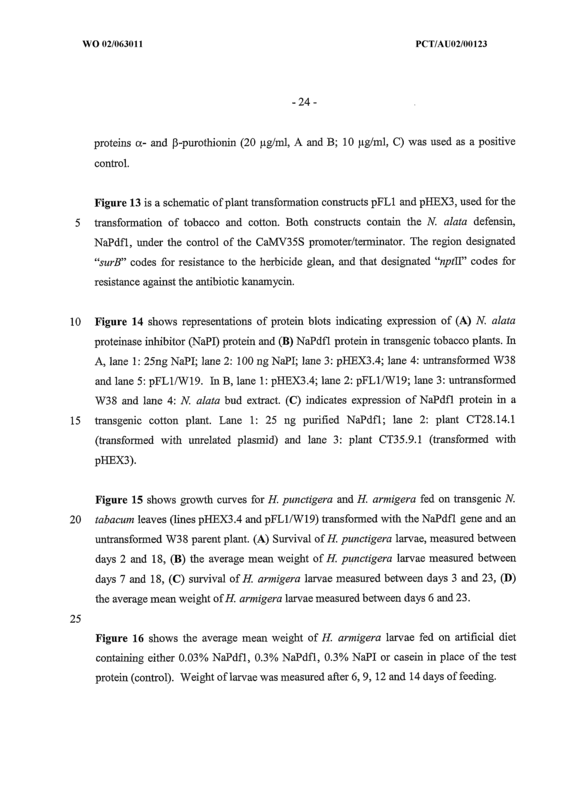 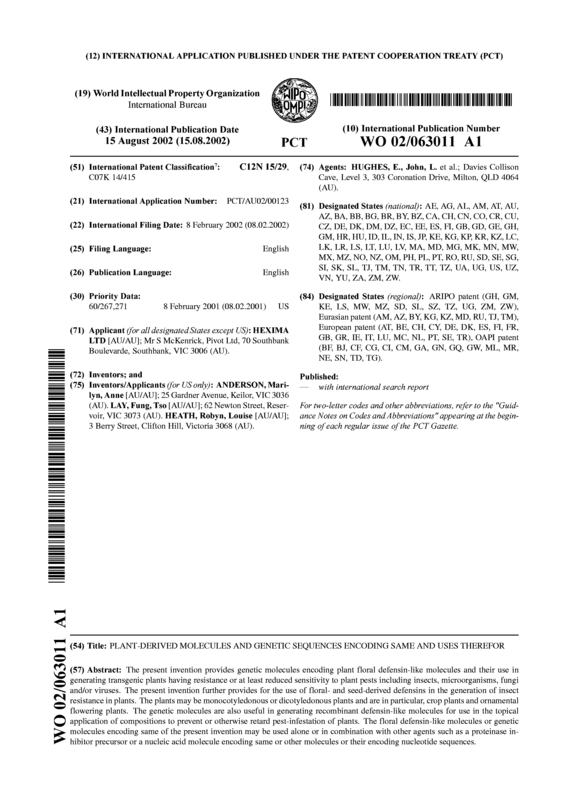 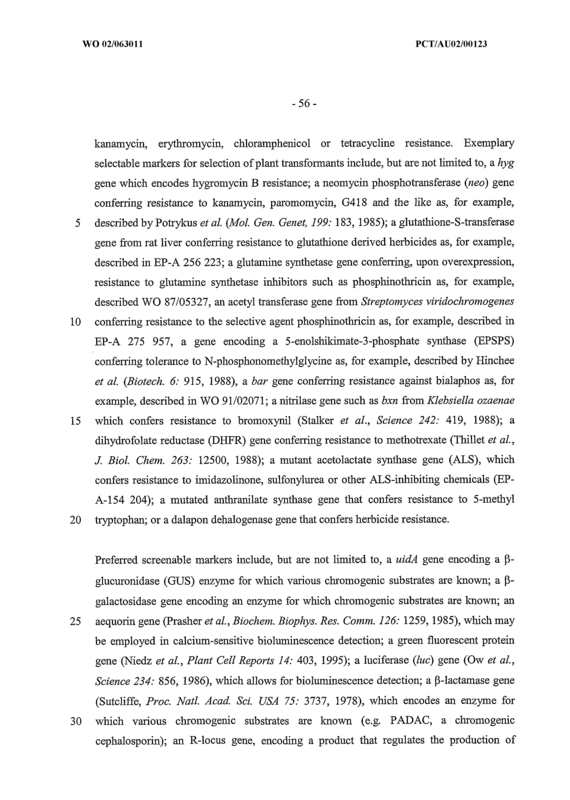 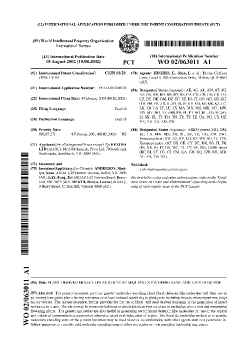 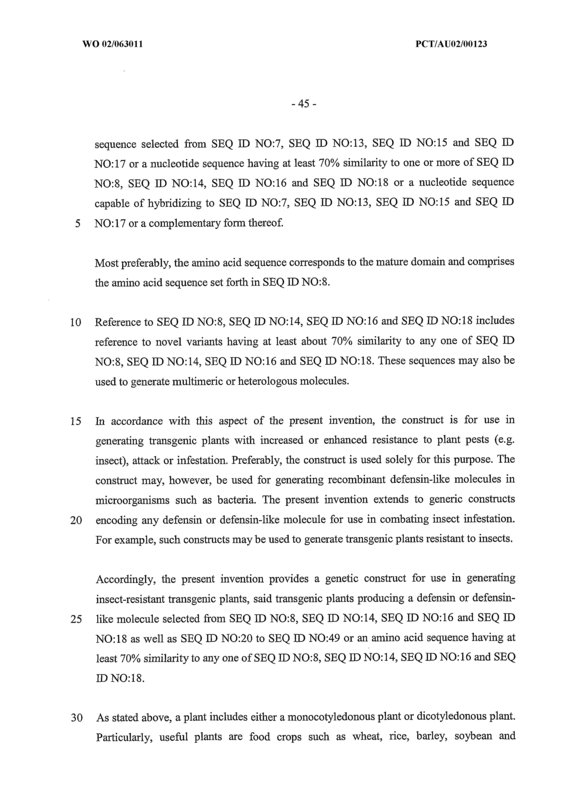 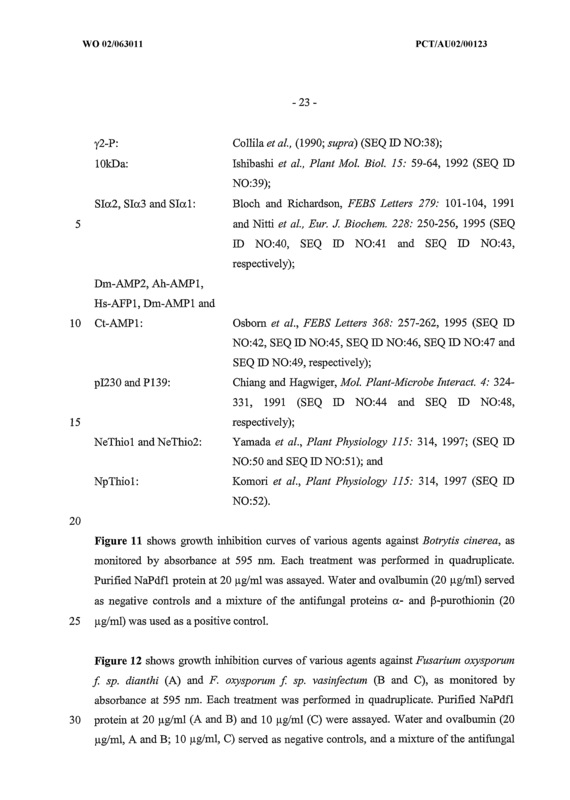 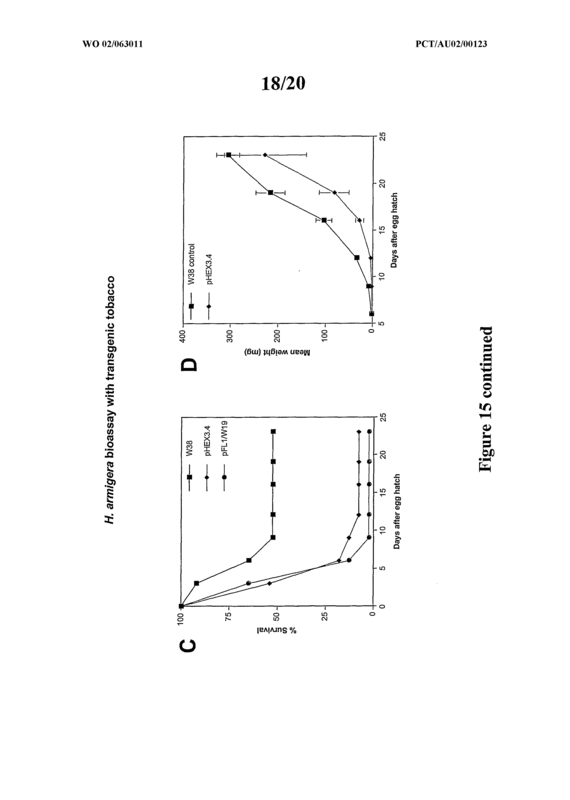 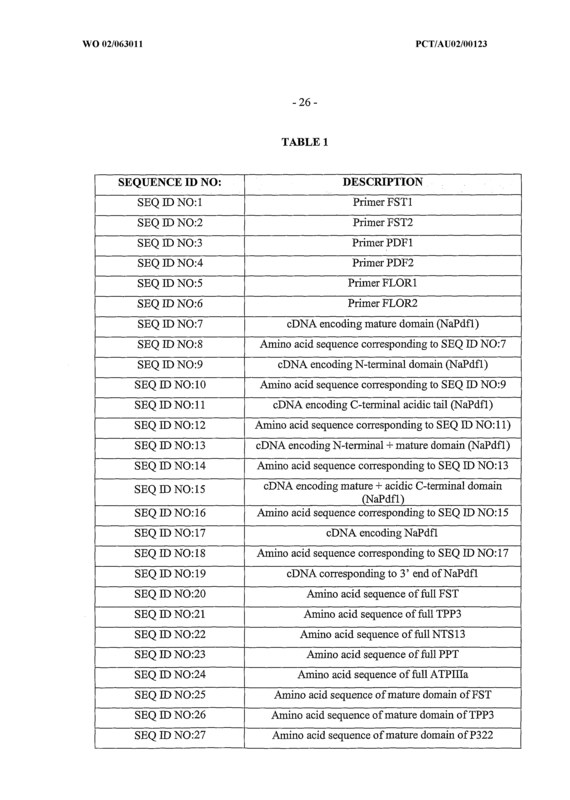 A genetic construct for use in generating insect-resistant transgenic plants, said transgenic plants producing a defensin or defensin-like molecule selected from SEQ JD NO:8, SEQ ED NO: 14, SEQ ED NO:16 and SEQ ED NO:18 as well as SEQ ID NO:20 to SEQ ID NO:49 or an amino acid sequence having at least 70% similarity to any one of SEQ ED NO:8, SEQ ED NO:14, SEQ ED NO:16 and SEQ ID NO:18. 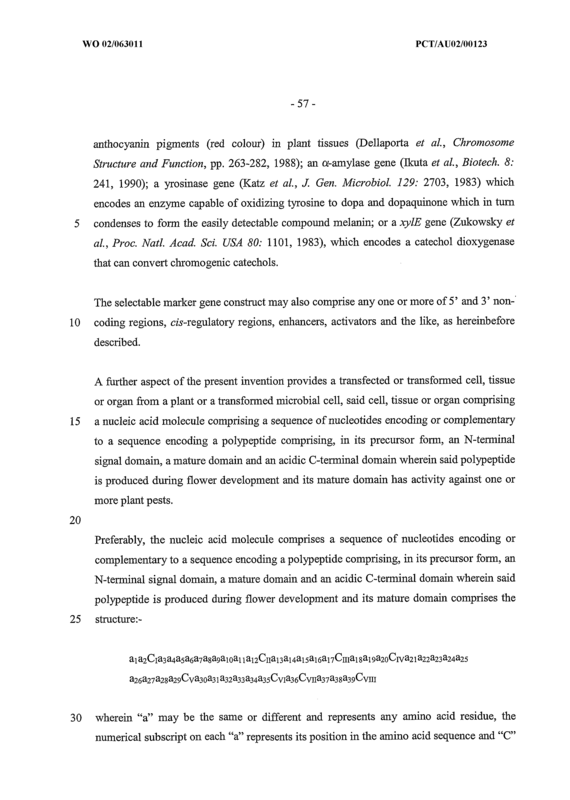 The genetic construct of Claim 21 wherein the transgenic plant is a monocotyledonous plant. 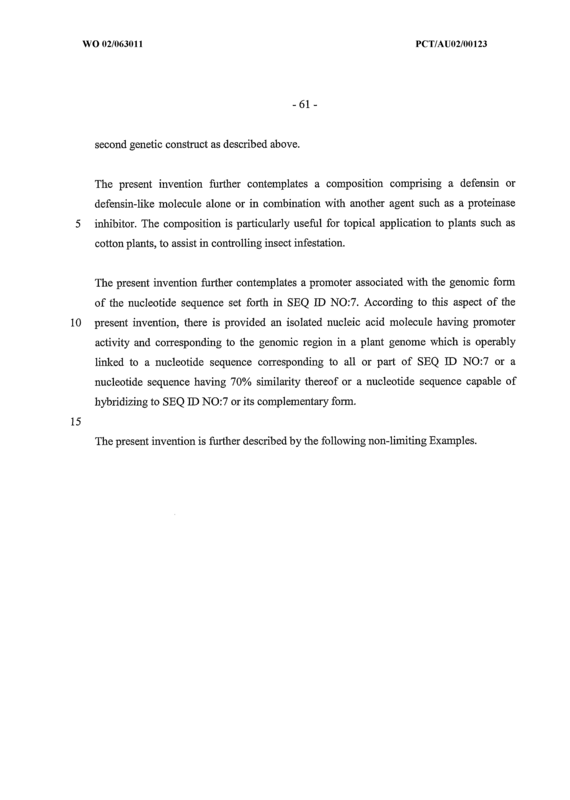 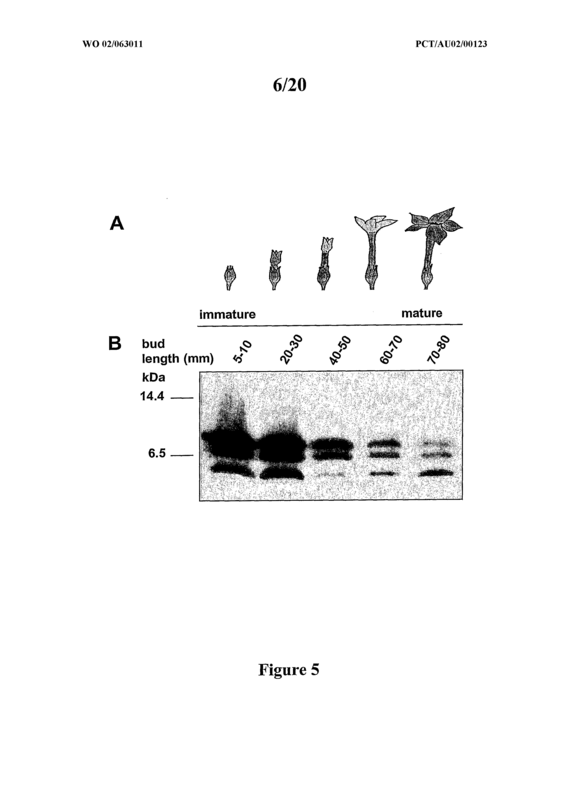 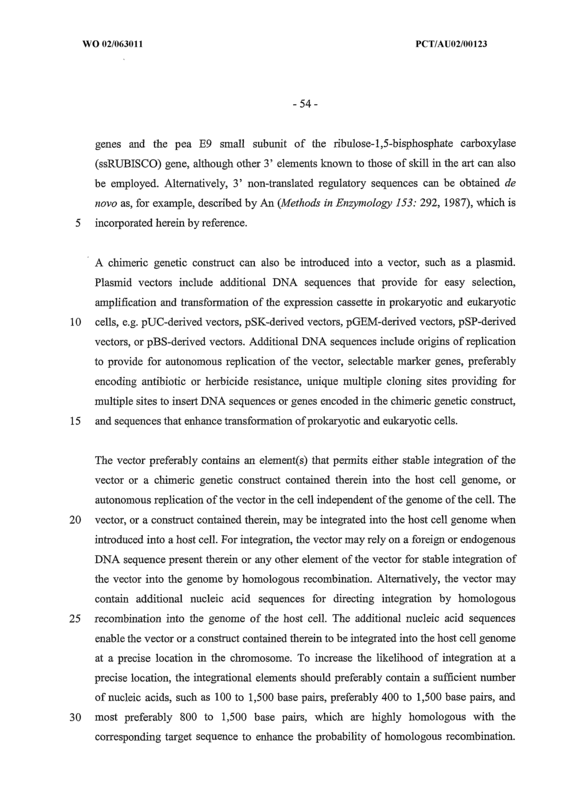 The genetic construct of Claim 21 wherein the transgenic plant is a dicotyledonas plant. 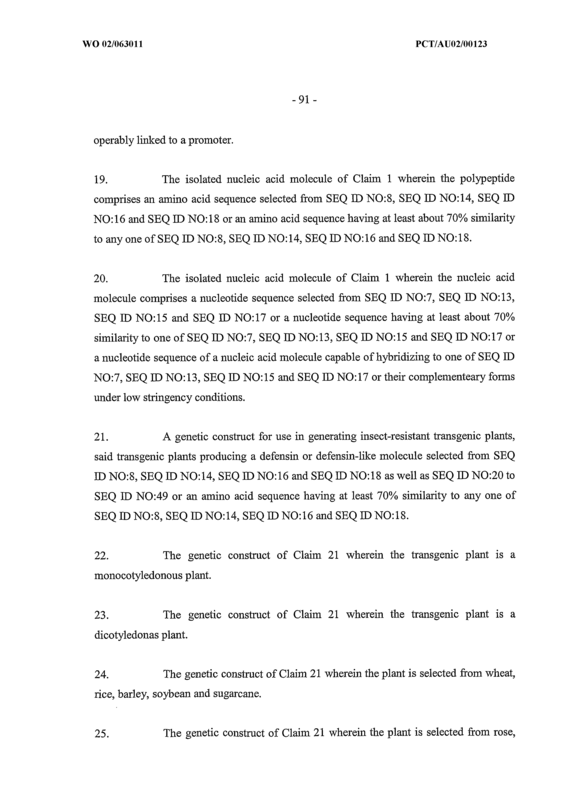 The genetic construct of Claim 21 wherein the plant is selected from wheat, rice, barley, soybean and sugarcane. 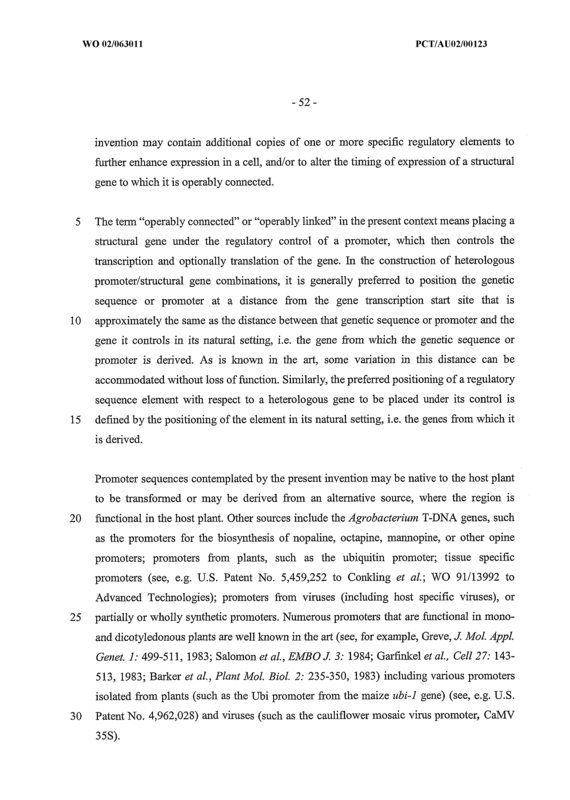 The genetic construct of Claim 21 wherein the plant is selected from rose, carnation, petunia, lisianthus, lily, iris, tulip, freesia, dephinium, limorium and pelargonium. 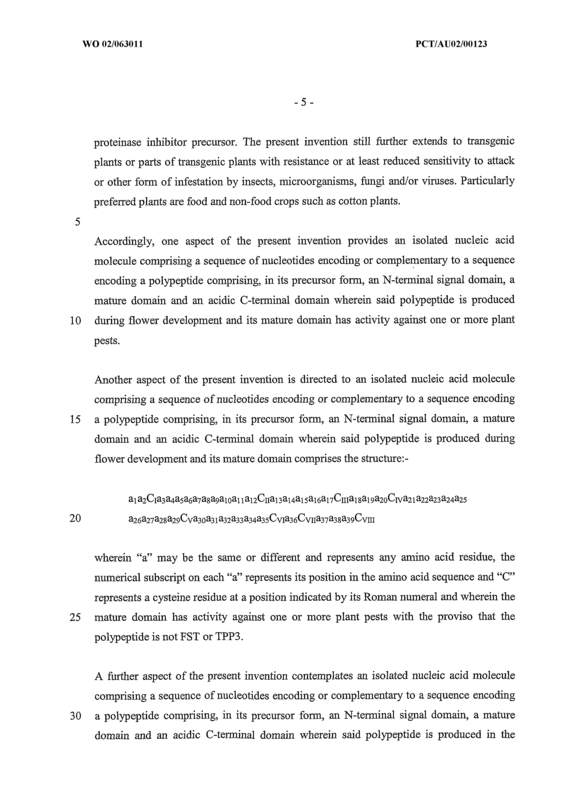 wherein "a" may be the same or different and represents any amino acid residue, the numerical subscript on each "a" represents its position in the amino acid sequence and "C" represents a cysteine residue at a position indicated by its Roman numeral and wherein said mature domain exhibits inhibitory activity against plant pests such as insect pests and regenerating a plant from said cell or group of cells. 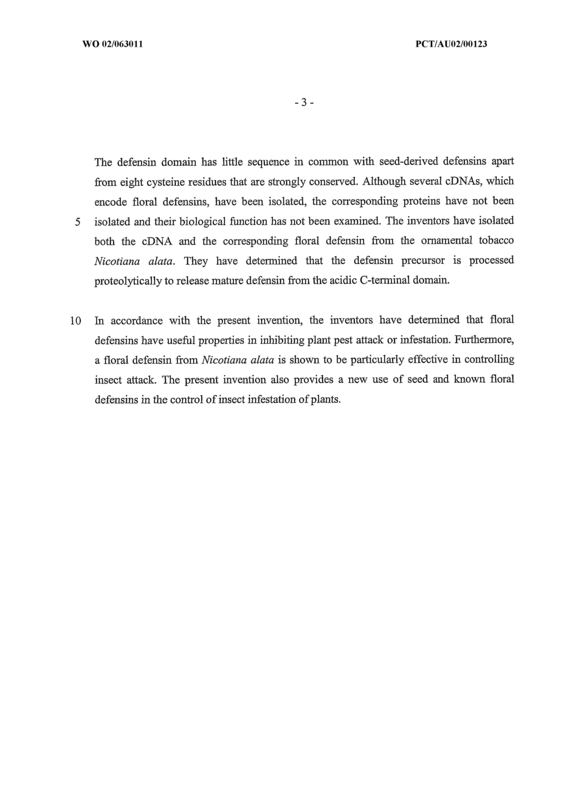 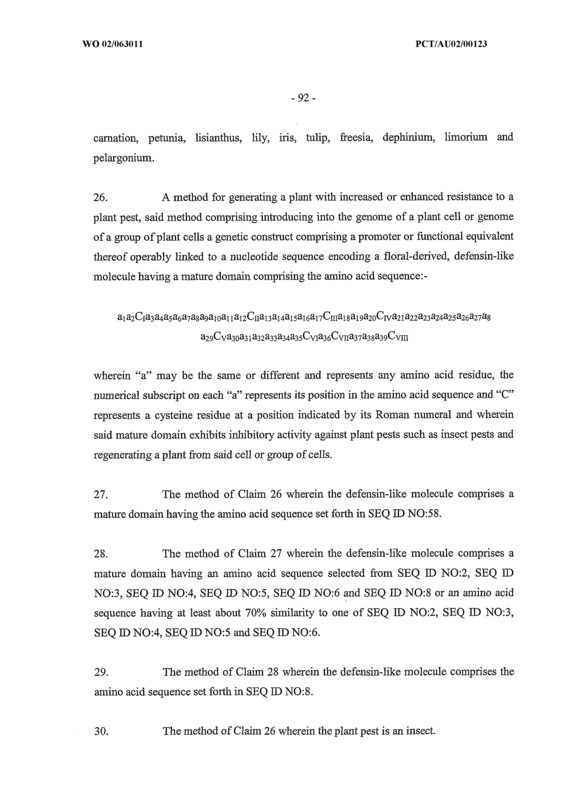 The method of Claim 26 wherein the defensin-like molecule comprises a mature domain having the amino acid sequence set forth in SEQ ED NO: 58. 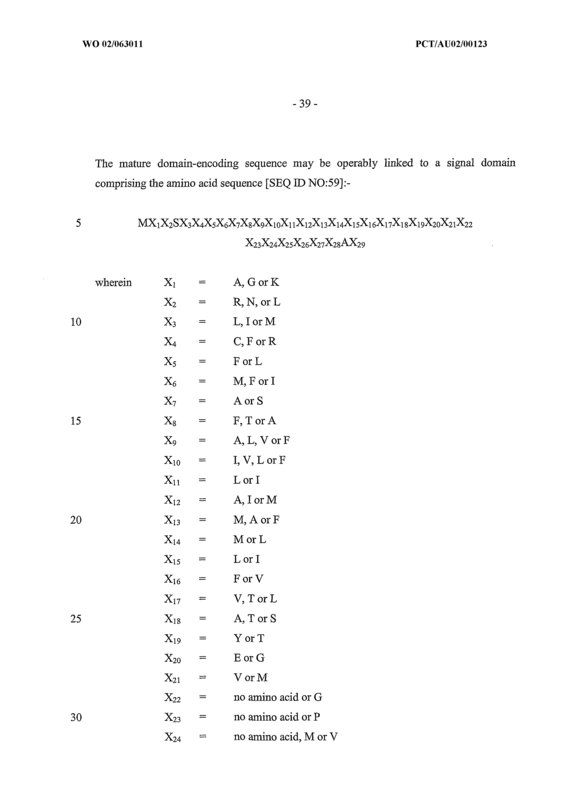 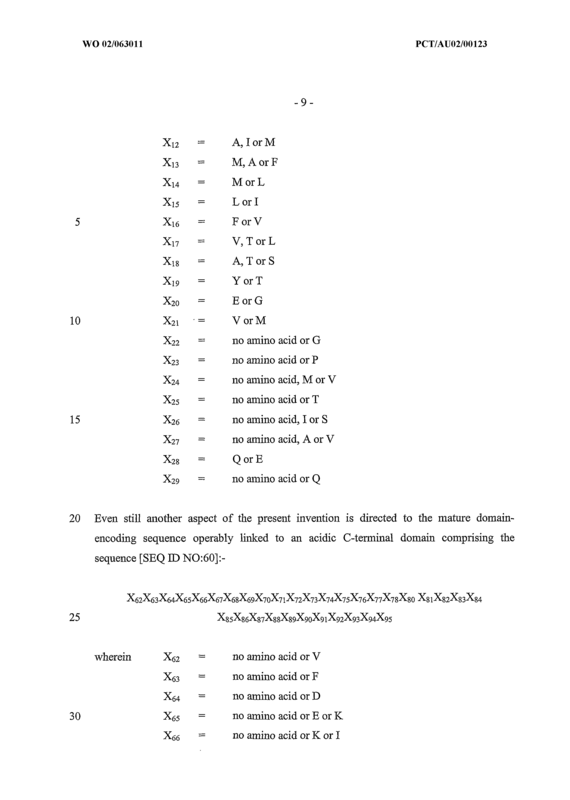 The method of Claim 27 wherein the defensin-like molecule comprises a mature domain having an amino acid sequence selected from SEQ ID NO:2, SEQ JD NO:3, SEQ ID NO:4, SEQ ID NO:5, SEQ ID NO:6 and SEQ ED NO:8 or an amino acid sequence having at least about 70% similarity to one of SEQ ED NO:2, SEQ ED NO:3, SEQ ED NO:4, SEQ ID NO:5 and SEQ ID NO:6. 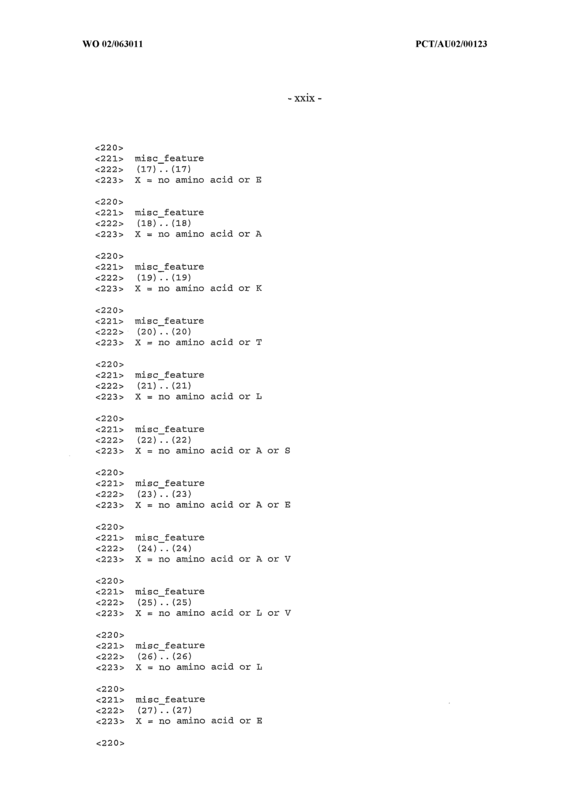 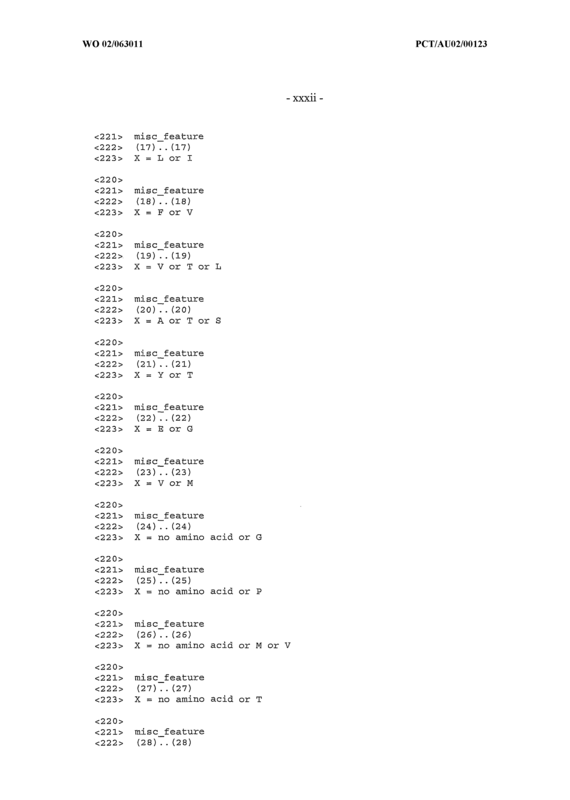 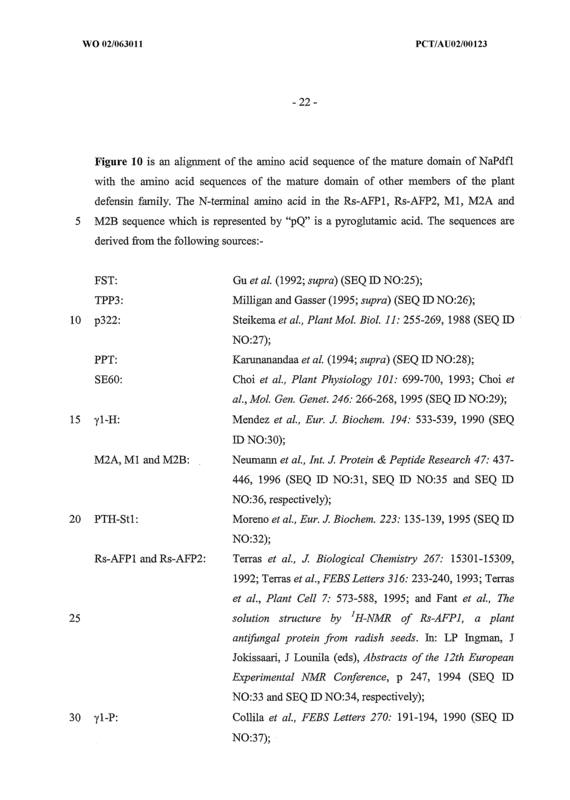 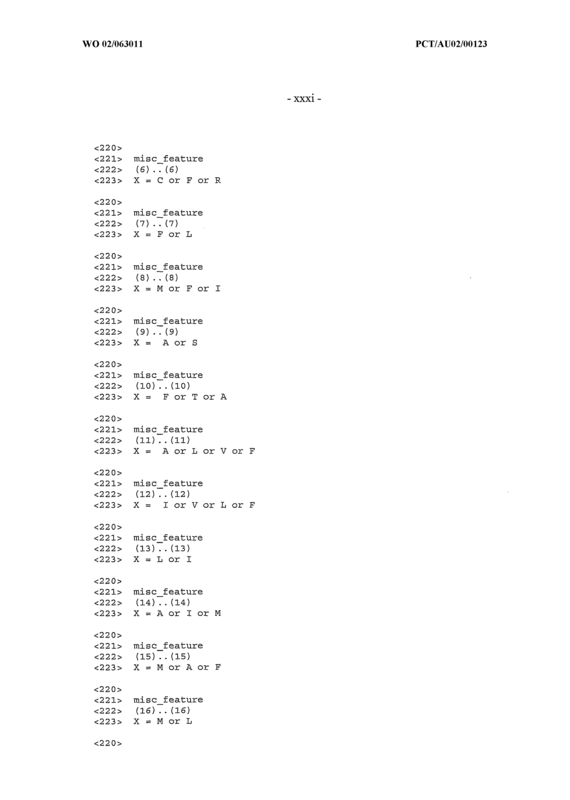 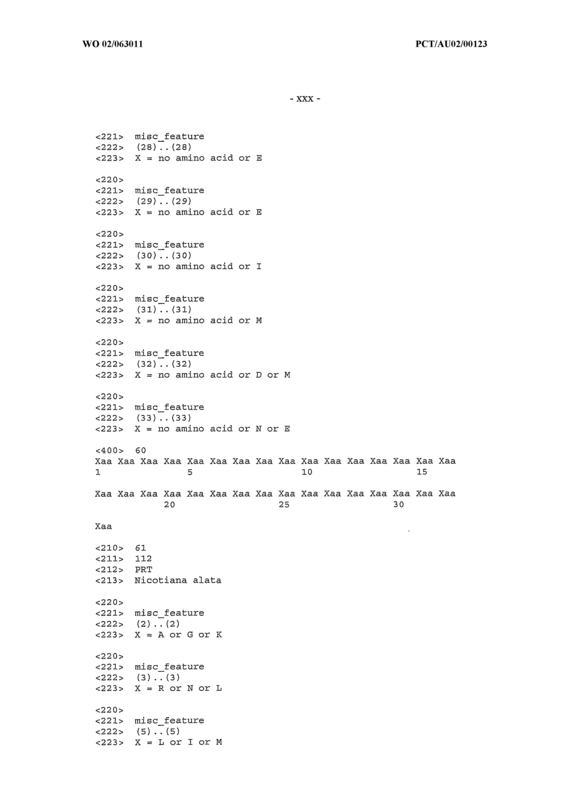 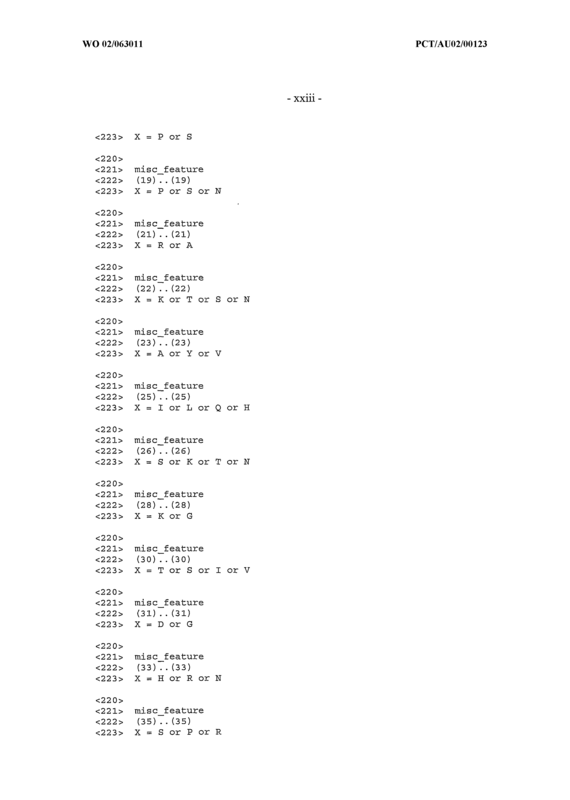 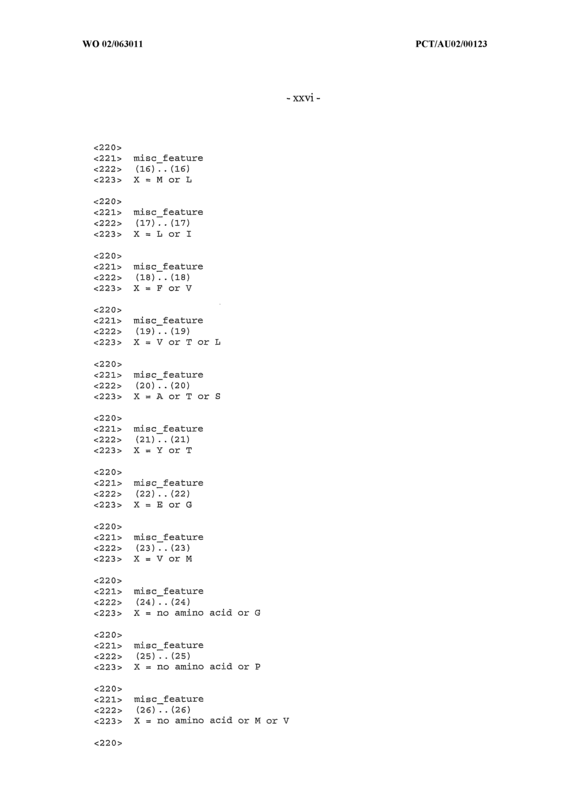 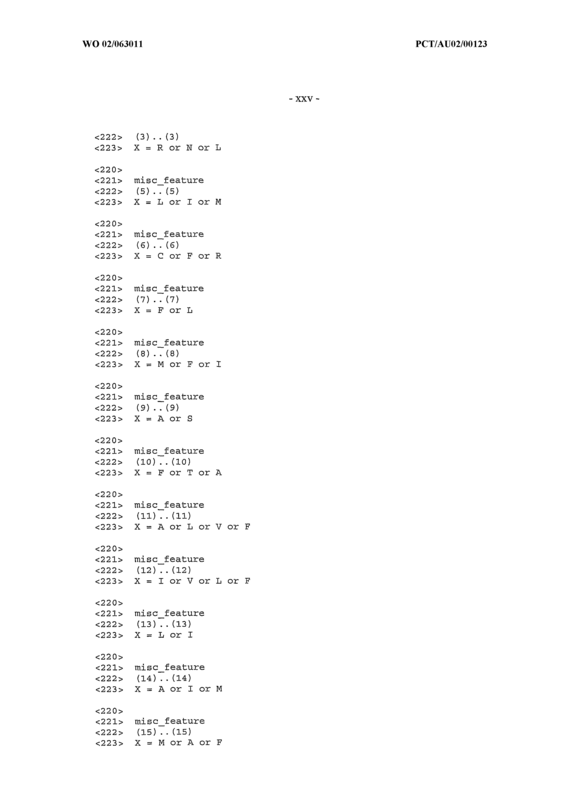 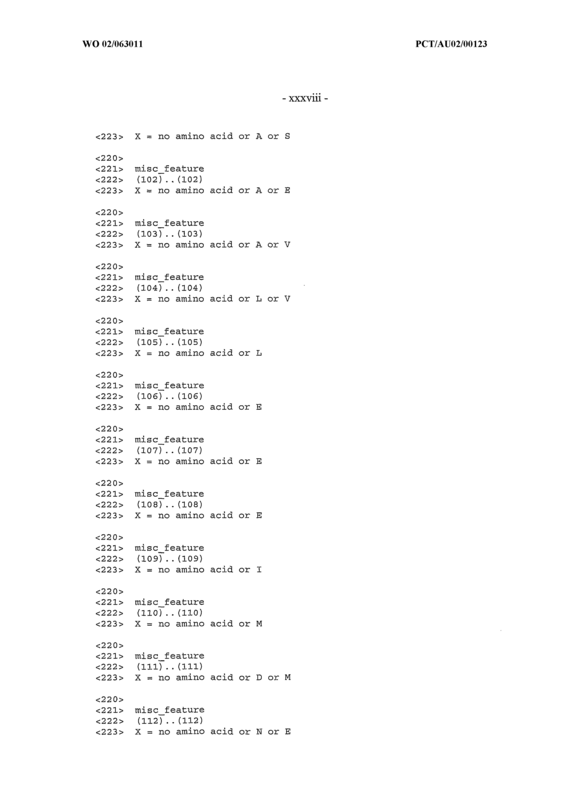 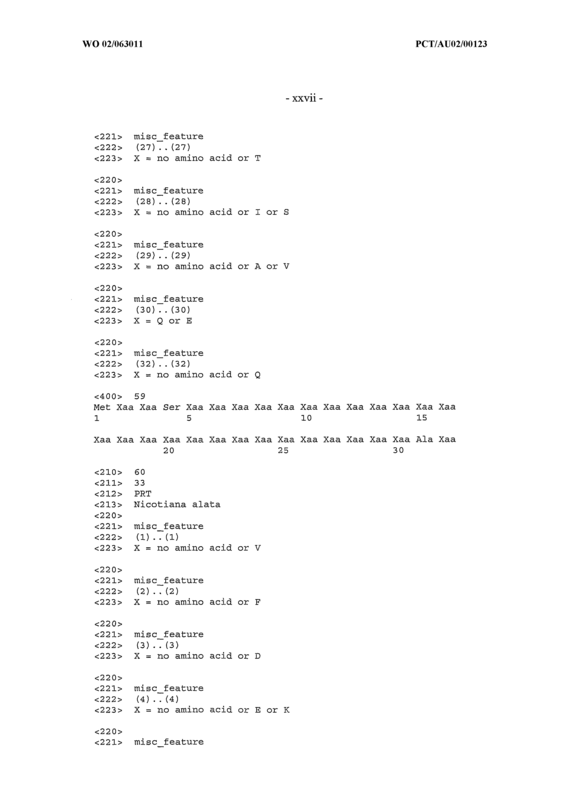 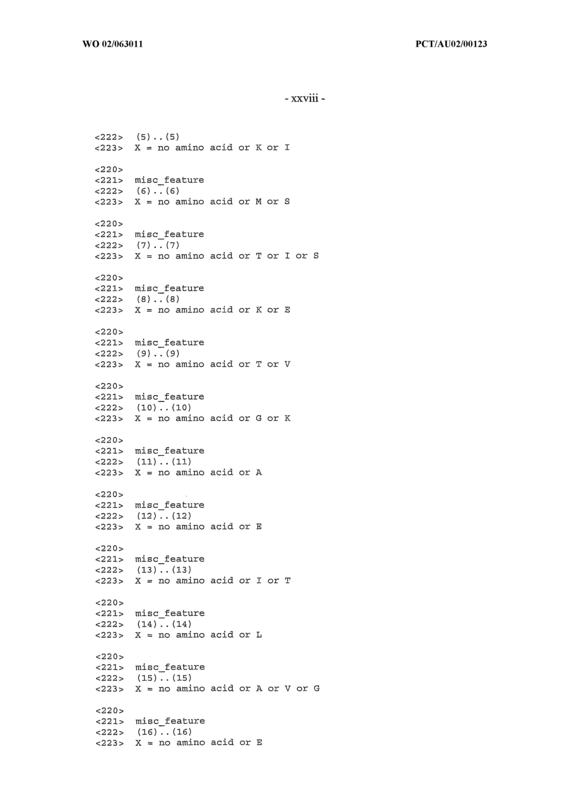 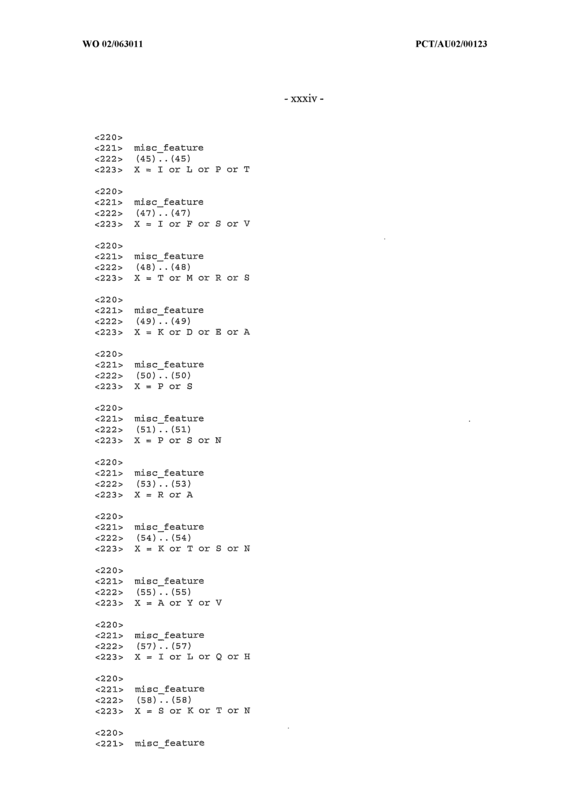 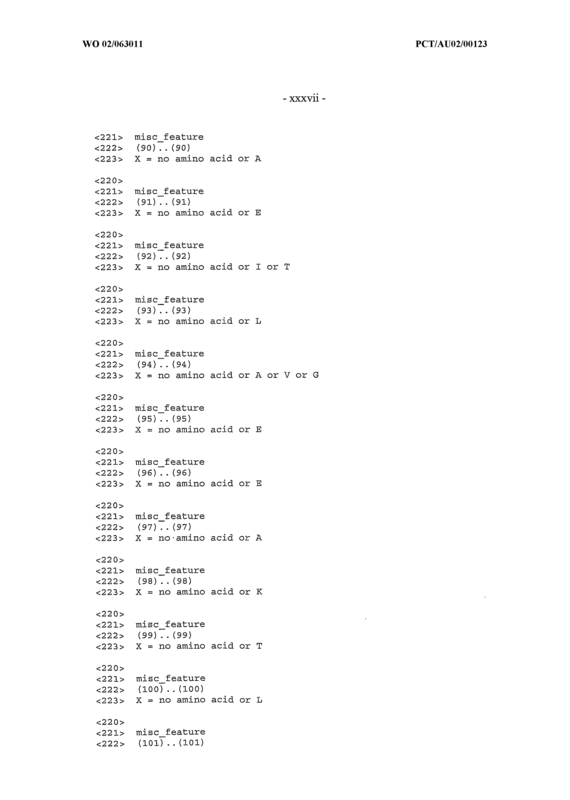 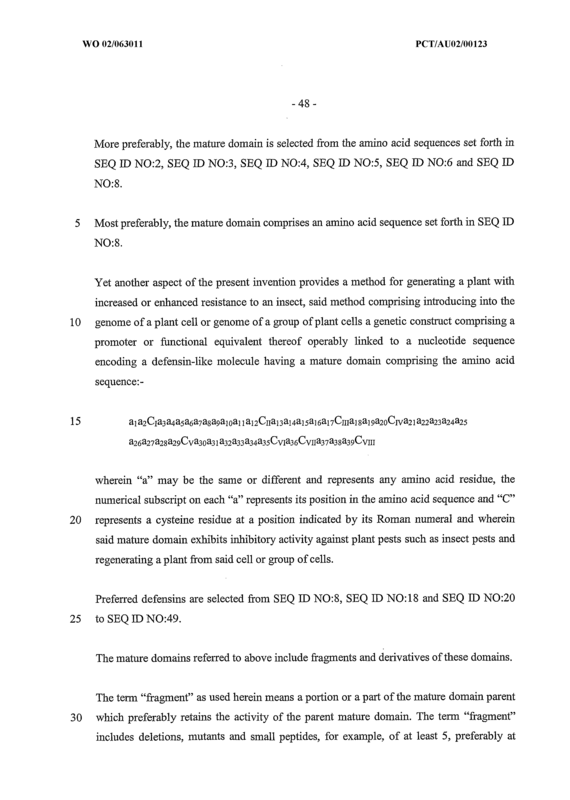 The method of Claim 28 wherein the defensin-like molecule comprises the amino acid sequence set forth in SEQ JD NO: 8. 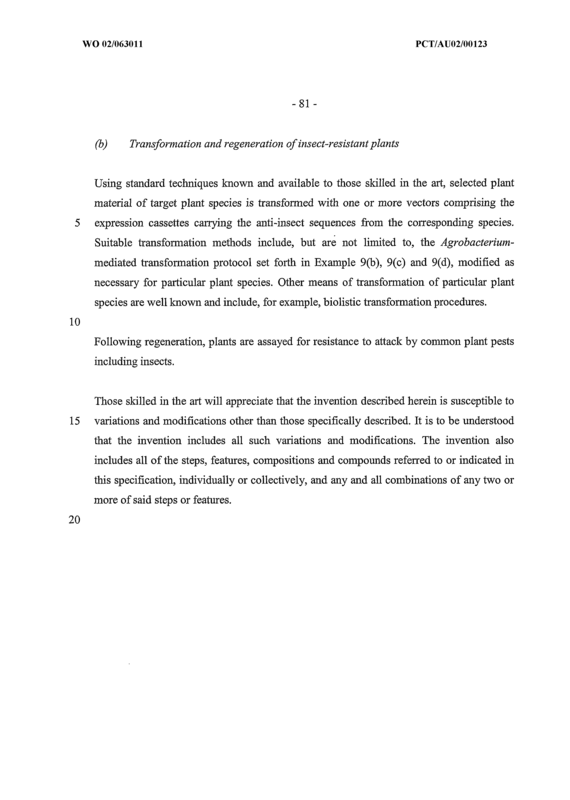 The method of Claim 26 wherein the plant pest is an insect. 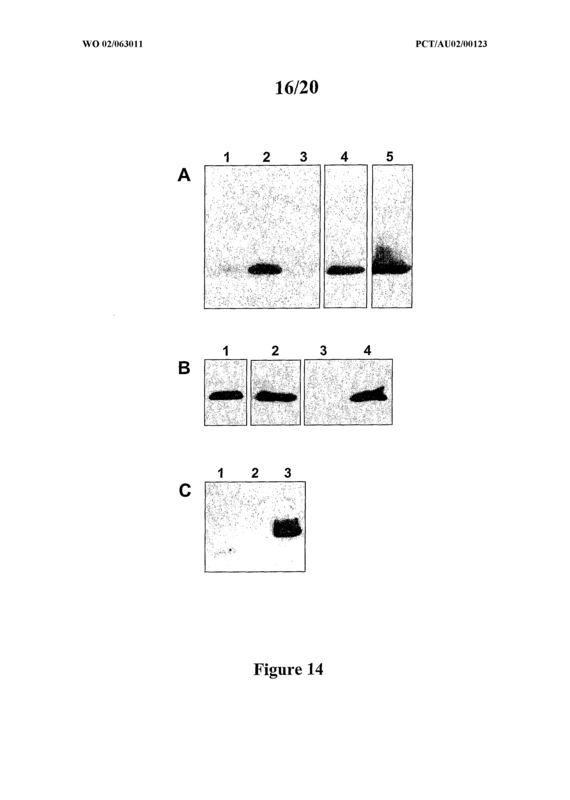 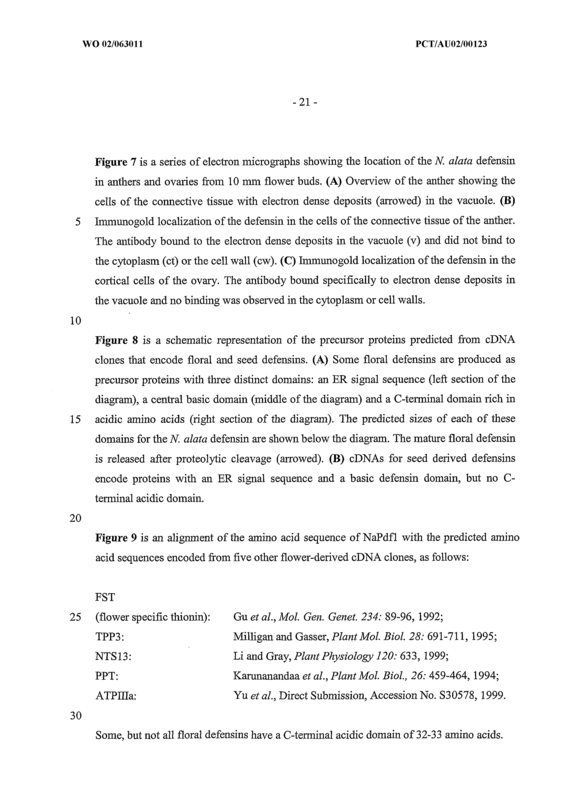 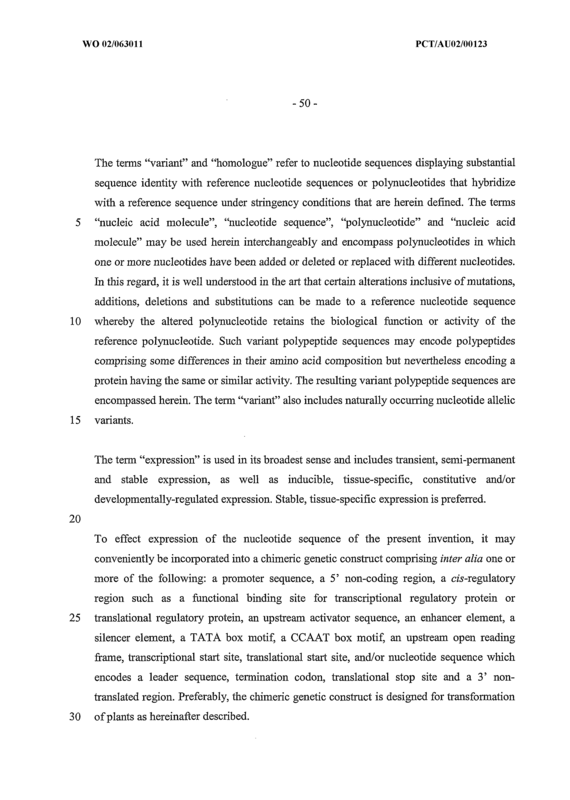 A fransfected or transformed cell, tissue or organ from a plant or a fransformed microbial cell, said cell, tissue or organ comprising a nucleic acid molecule comprising a sequence of nucleotides encoding or complementary to a sequence encoding a polypeptide comprising, in its precursor form, an N-terminal signal domain, a mature domain and an acidic C-terminal domain wherein said polypeptide is produced during flower development and its mature domain has activity against one or more plant pests. 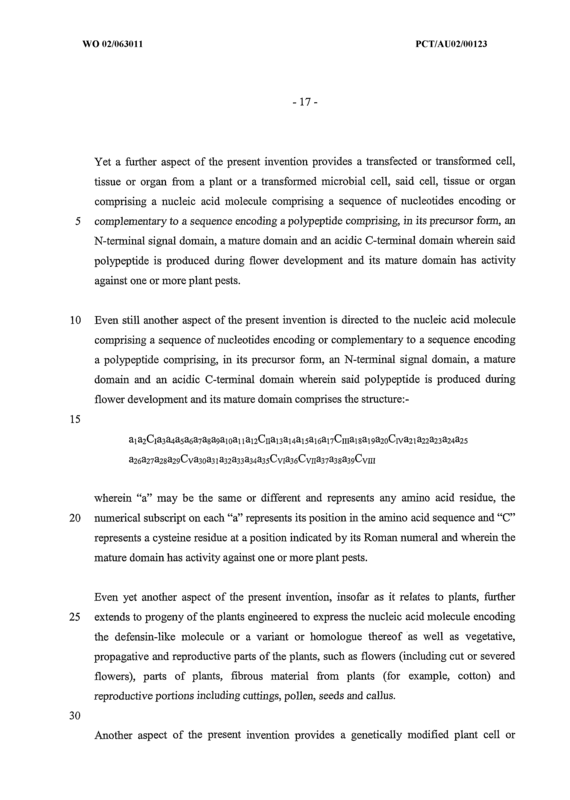 wherein "a" may be the same or different and represents any amino acid residue, the numerical subscript on each "a" represents its position in the amino acid sequence and "C" represents a cysteine residue at a position indicated by its Roman numeral and wherein the mature domain has activity against one or more plant pests. 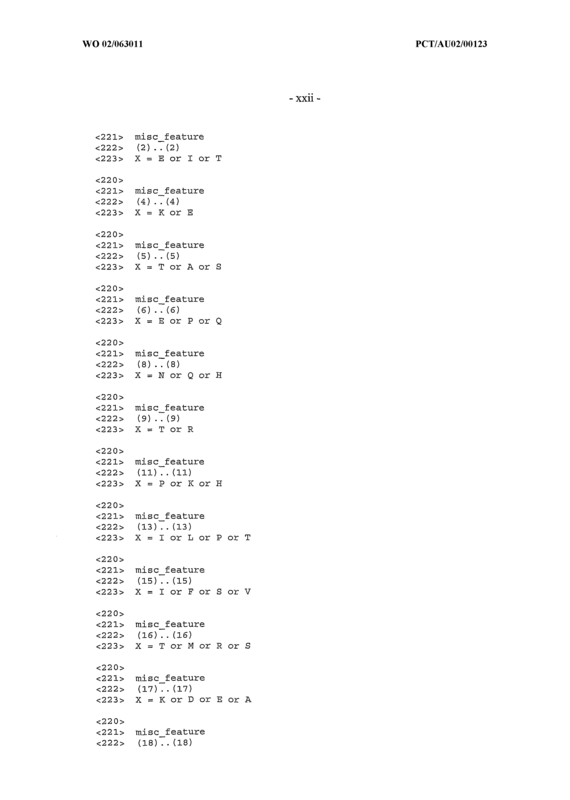 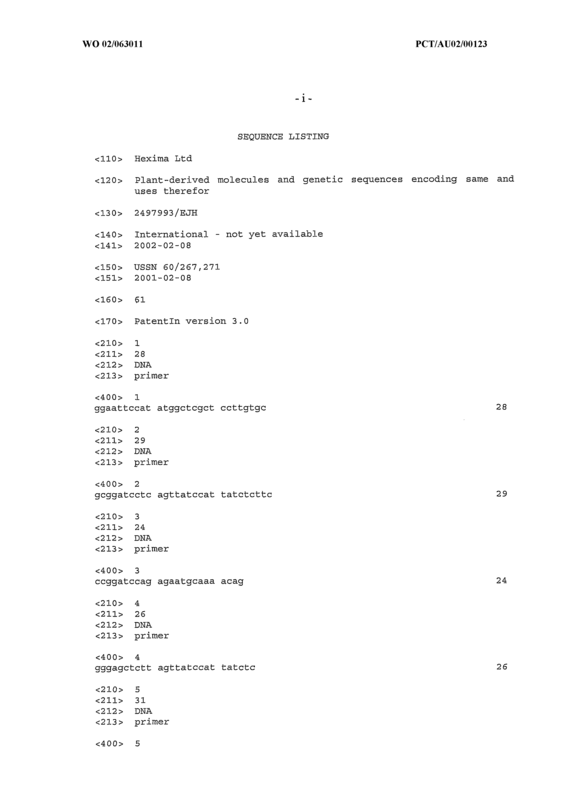 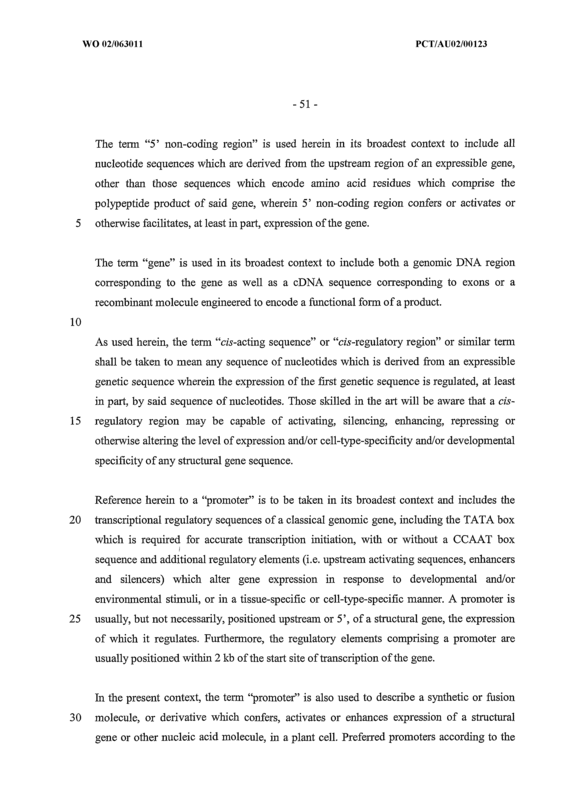 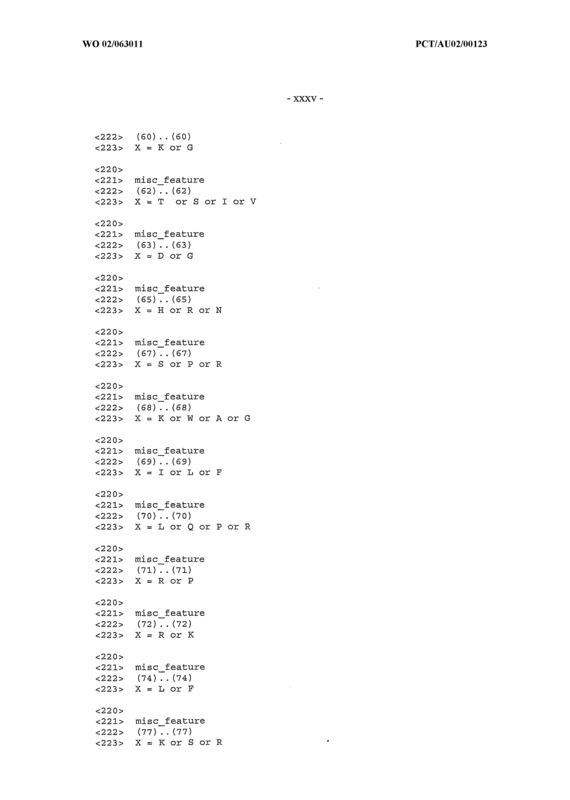 The fransfected or transformed cell, tissue or organ of Claim 32 wherein the polypeptide comprises an amino acid sequence selected from SEQ ID NO:2, SEQ ED NO:3, SEQ ID NO:4, SEQ ID NO:5, SEQ ED NO:6 and SEQ ED NO:8 or an amino acid sequence having at least about 70% similarity to one of SEQ ED NO:2, SEQ ID NO:3, SEQ ID NO:4, SEQ ED NO:5 and SEQ ED NO:6. 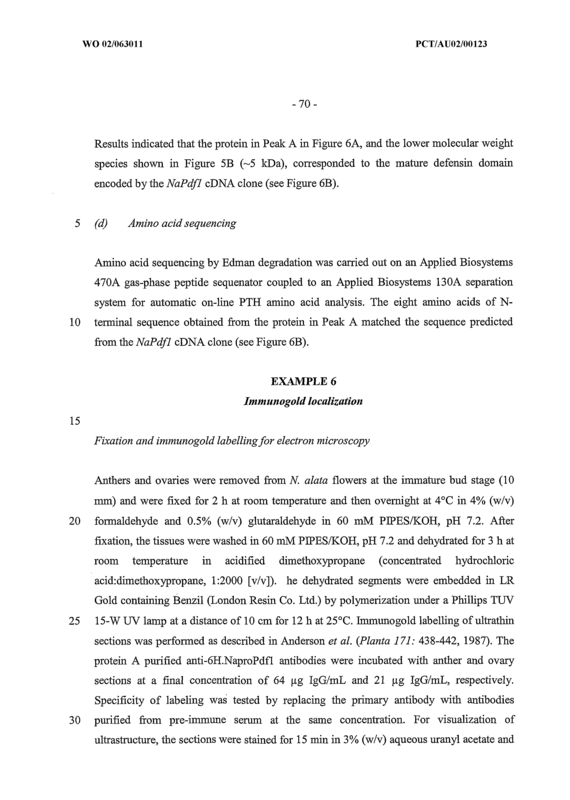 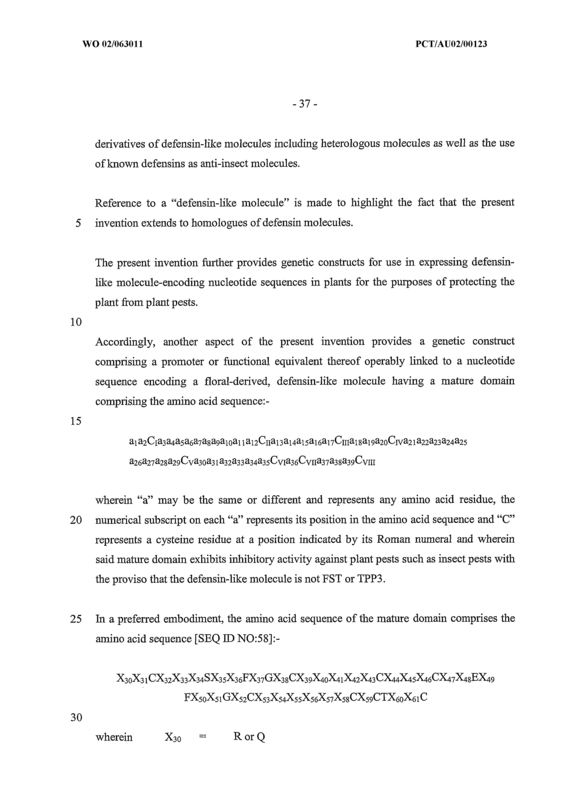 The method of Claim 3 wherein the defensin-like molecule comprises the amino acid sequence set forth in SEQ ED NO: 8. 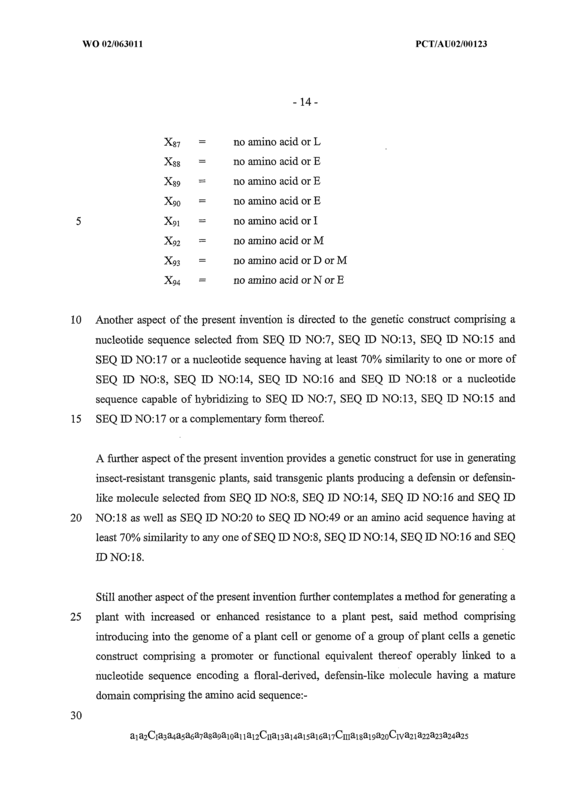 Progeny of plants engineered to express the nucleic acid molecule encoding the defensin-like molecule as herein defined or a variant or homologue thereof as well as vegetative, propagative and reproductive parts ofthe plants, such as flowers (including cut or severed flowers), parts of plants, fibrous material from plants (for example, cotton) and reproductive portions including cuttings, pollen, seeds and callus. 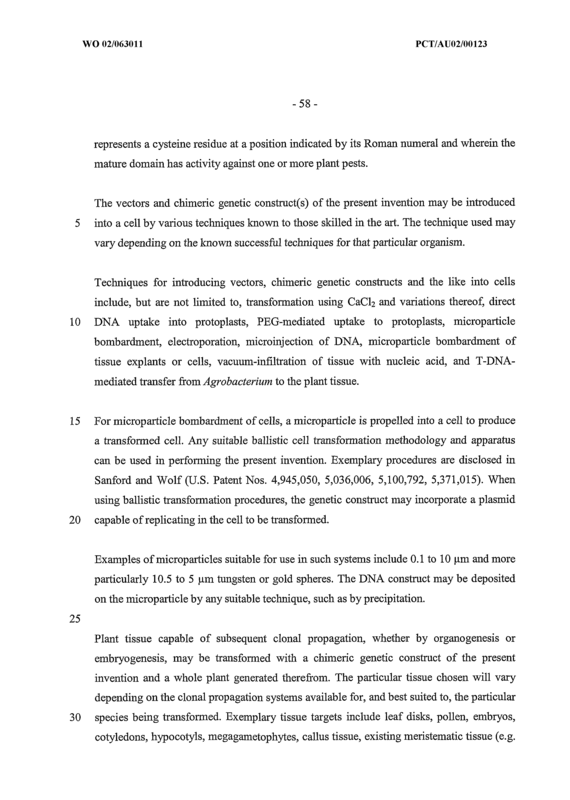 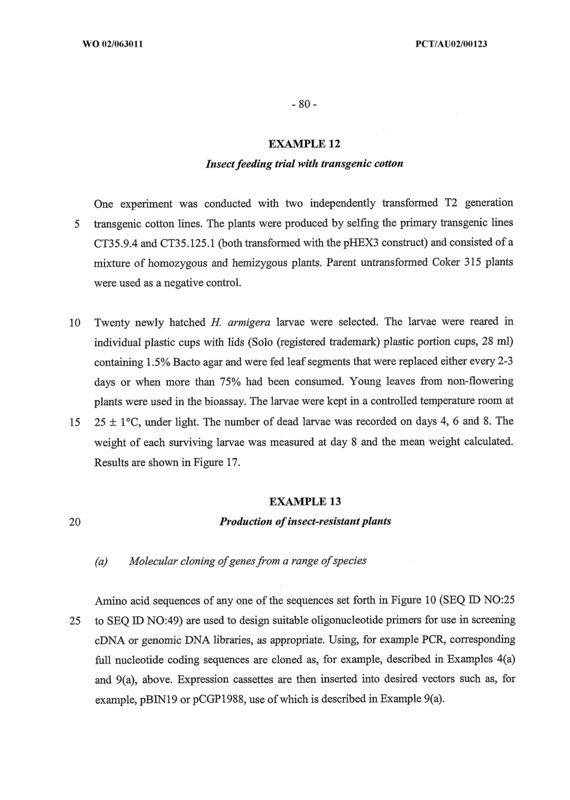 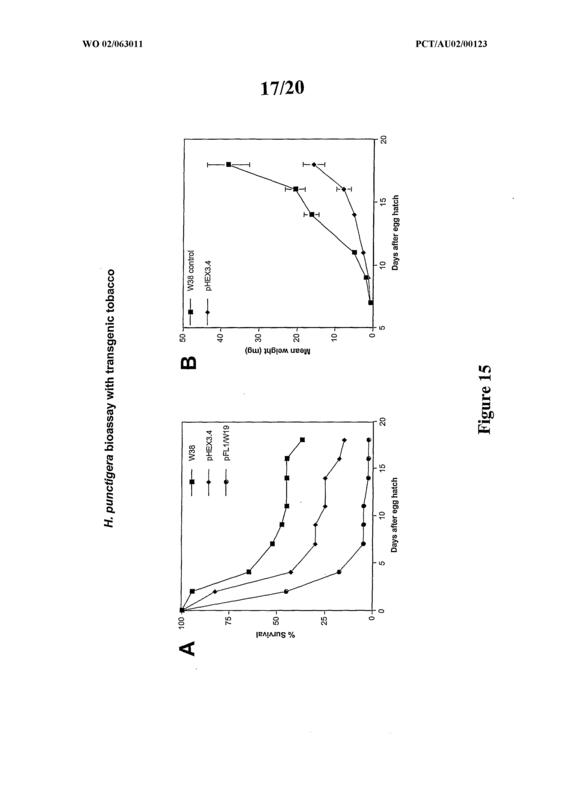 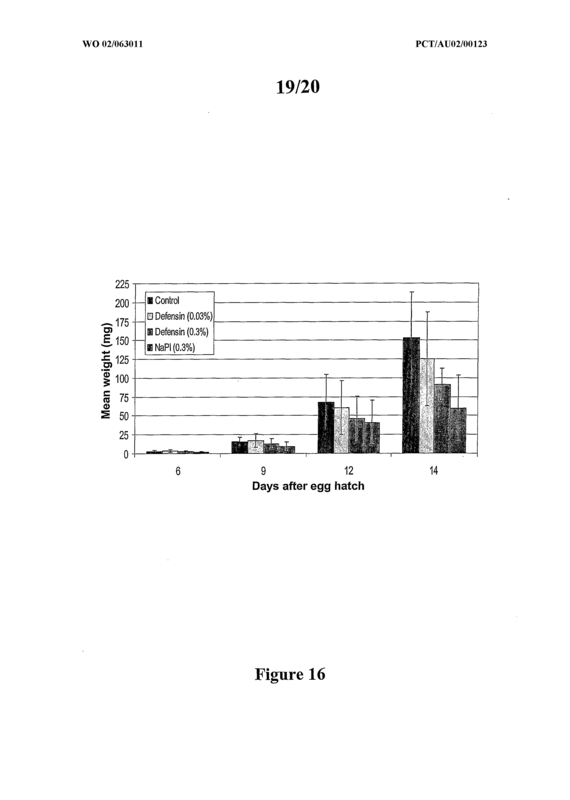 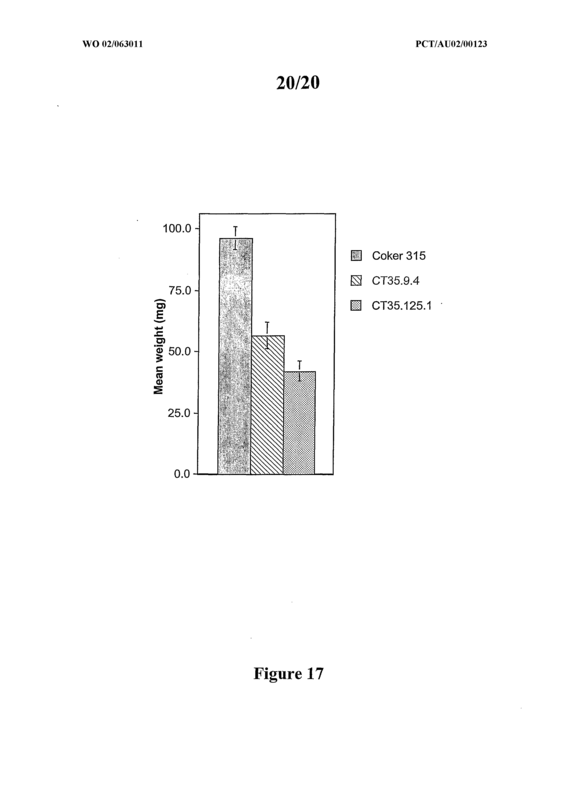 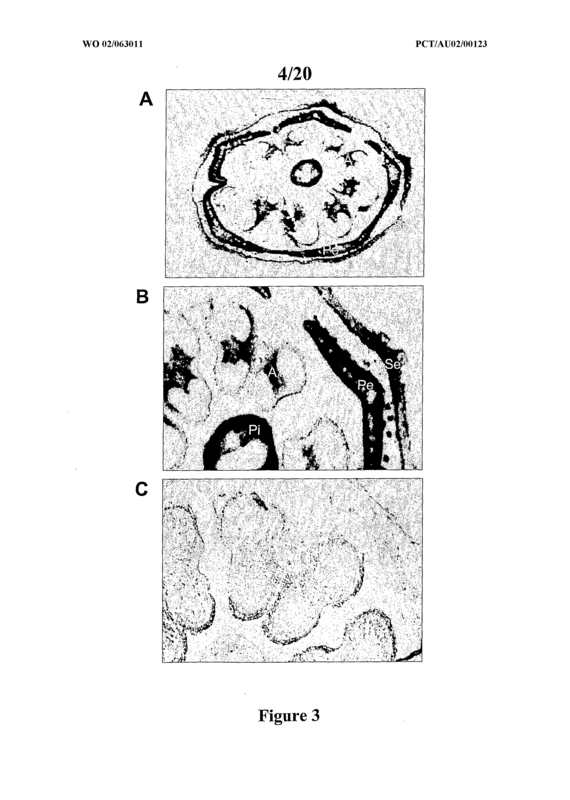 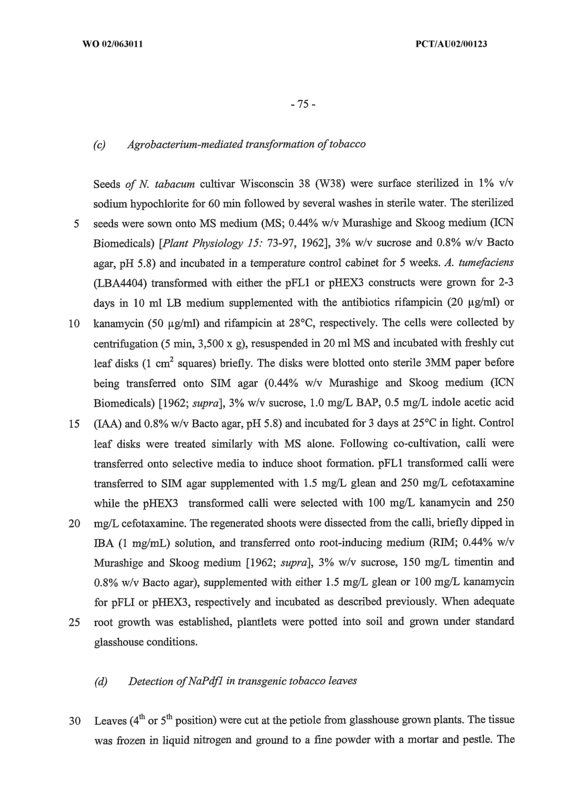 Genetically modified plant cell or multicellular plant or progeny thereof or parts of a genetically modified plant capable of producing a heterologous defensin-like molecule as herein described wherein said transgenic plant is resistant or has reduced sensitivity to plant pests such as insects. 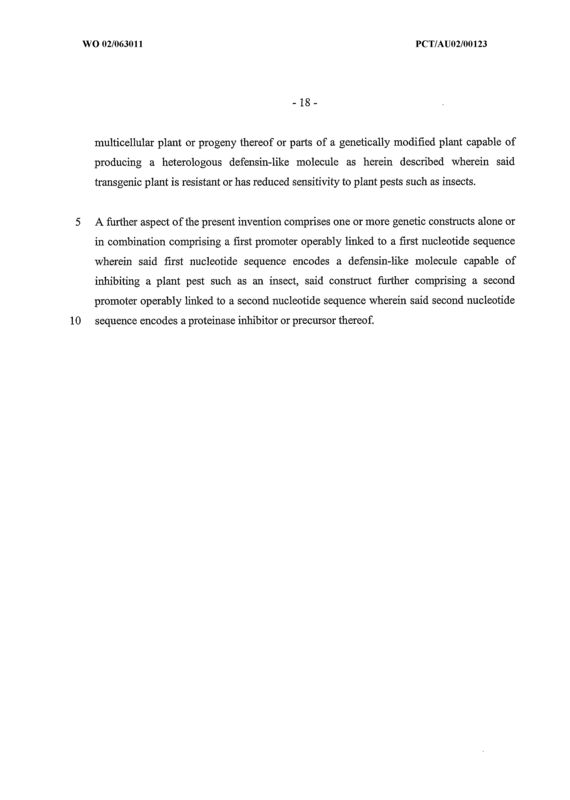 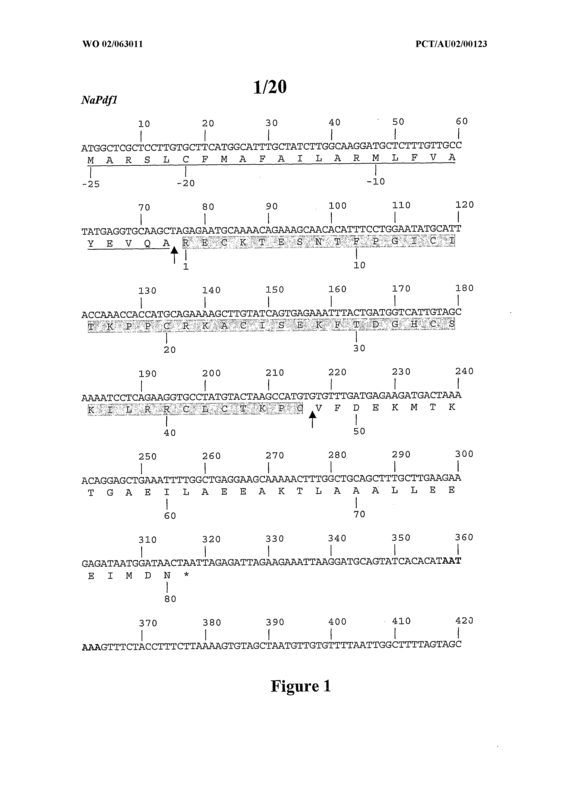 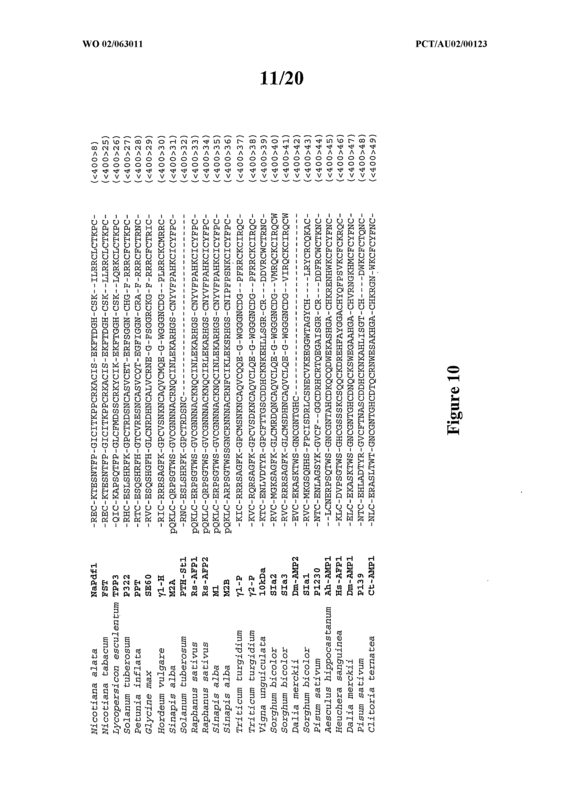 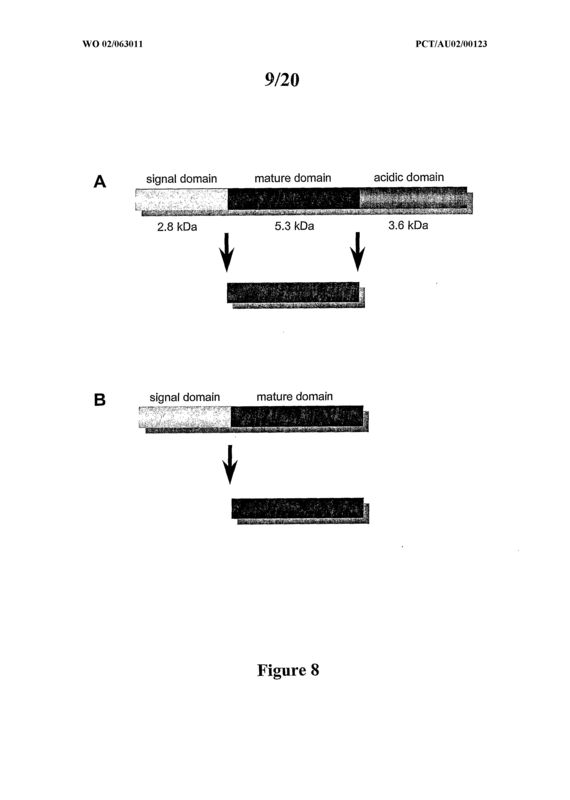 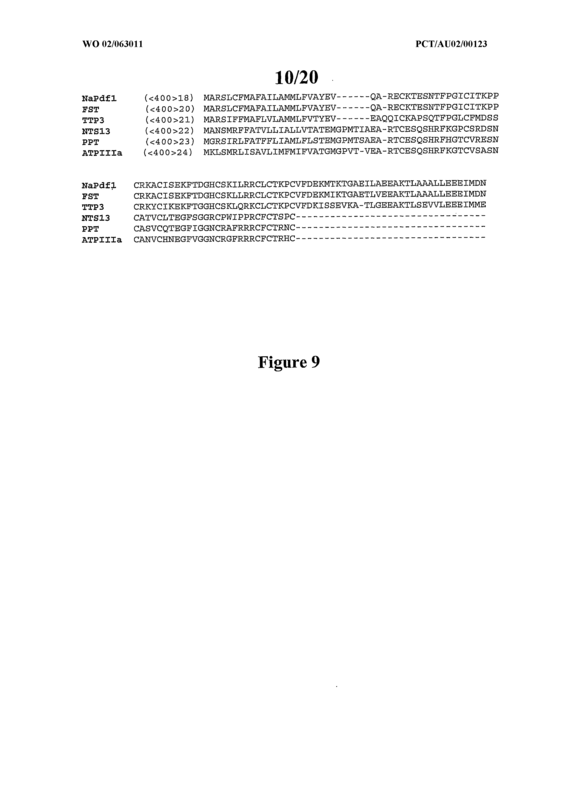 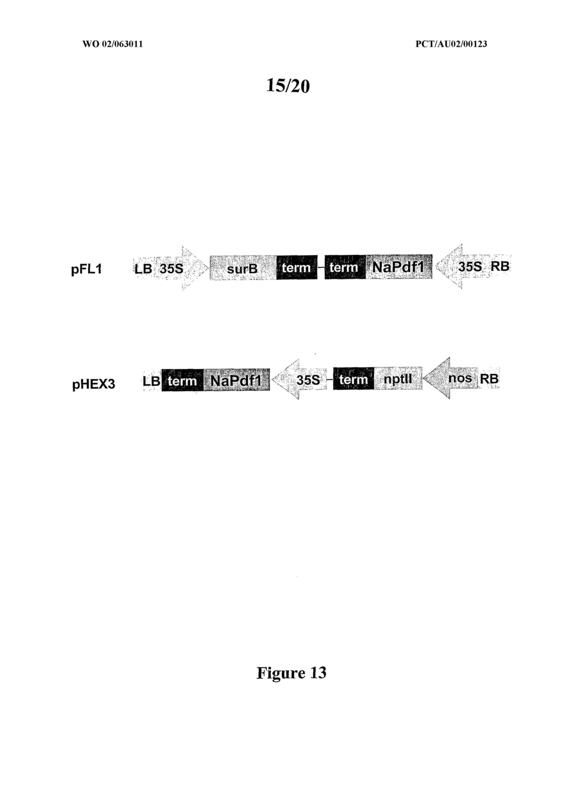 One or more genetic constructs alone or in combination comprising a first promoter operably linked to a first nucleotide sequence wherein said first nucleotide sequence encodes a defensin-like molecule capable of inhibiting a plant pest such as an insect, said construct further comprising a second promoter operably linked to a second nucleotide sequence wherein said second nucleotide sequence encodes a proteinase inhibitor or precursor thereof. 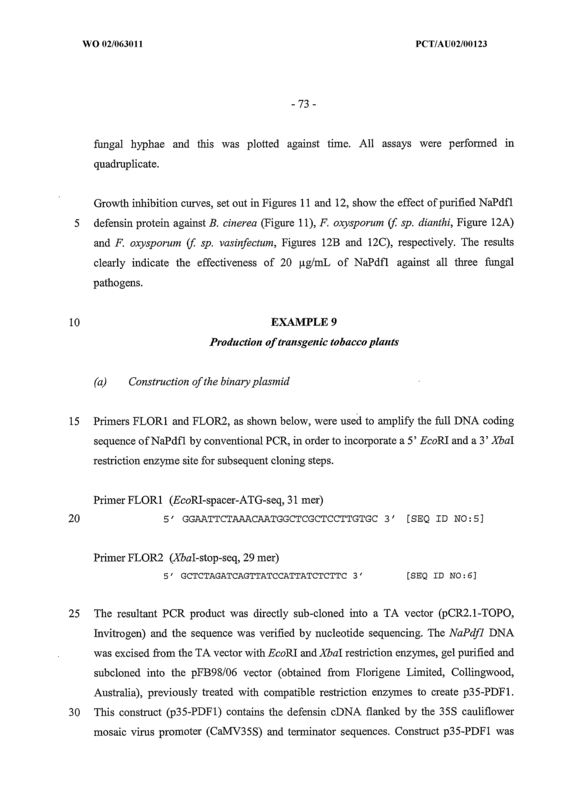 An isolated polypeptide comprising, in its precursor form, an N-terminal signal domain, a mature domain and an acidic C-terminal domain wherein said polypeptide is produced during flower development and its mature domain has activity against one or more plant pests. 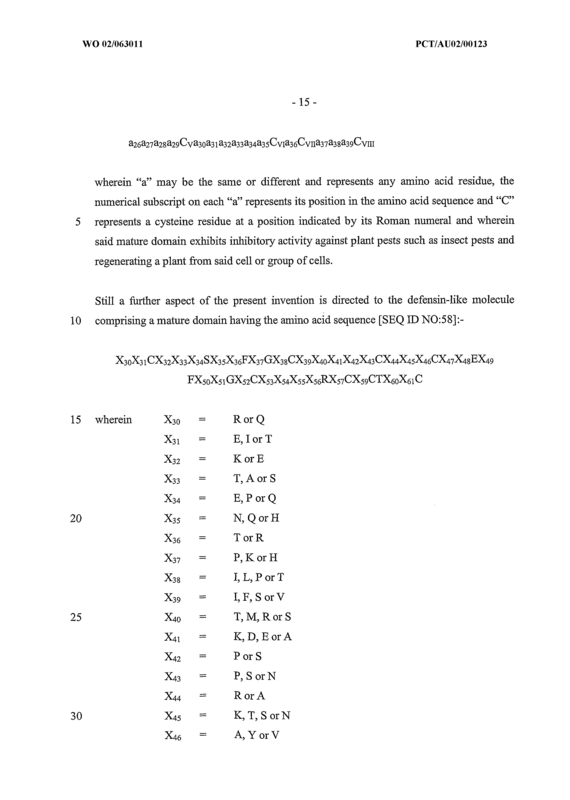 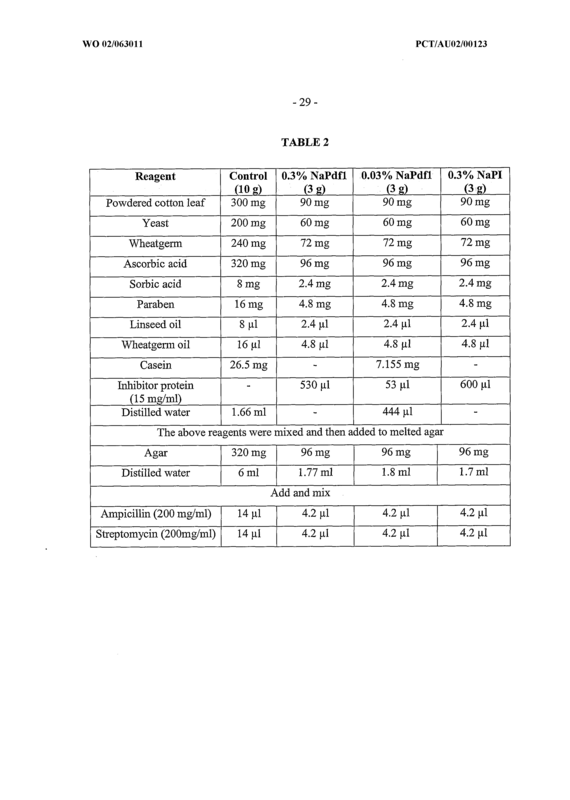 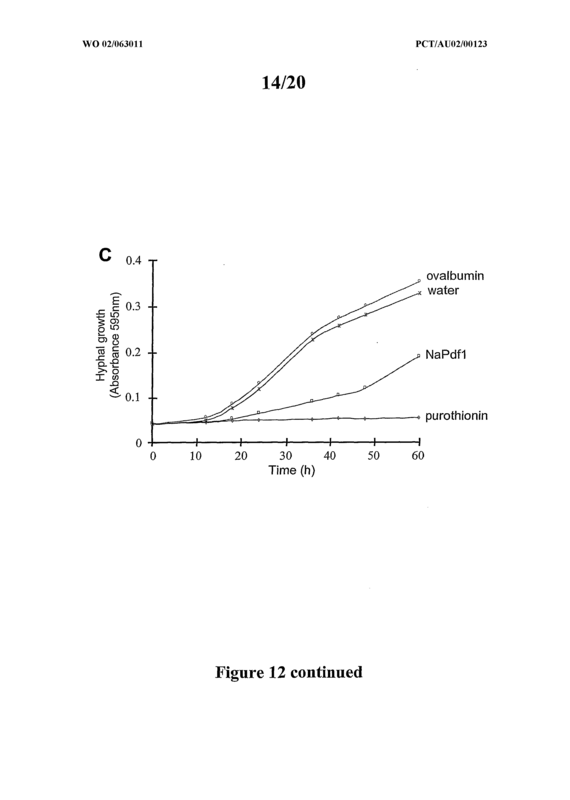 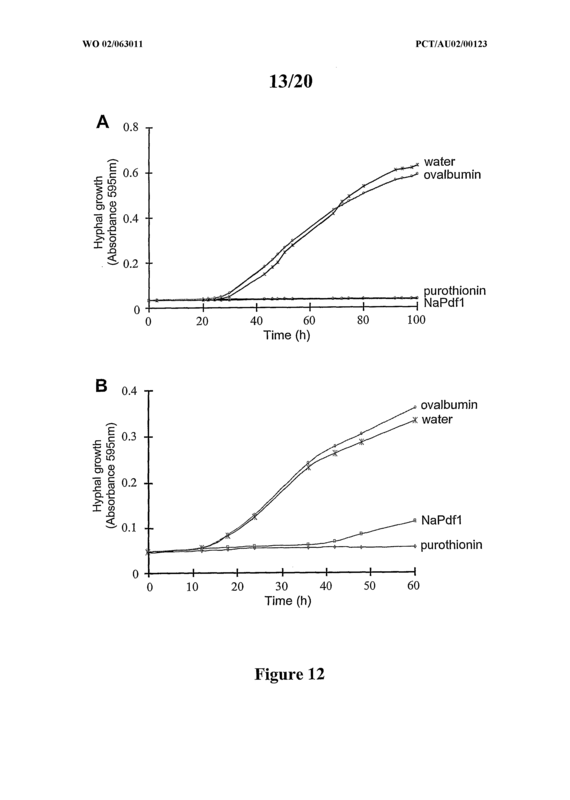 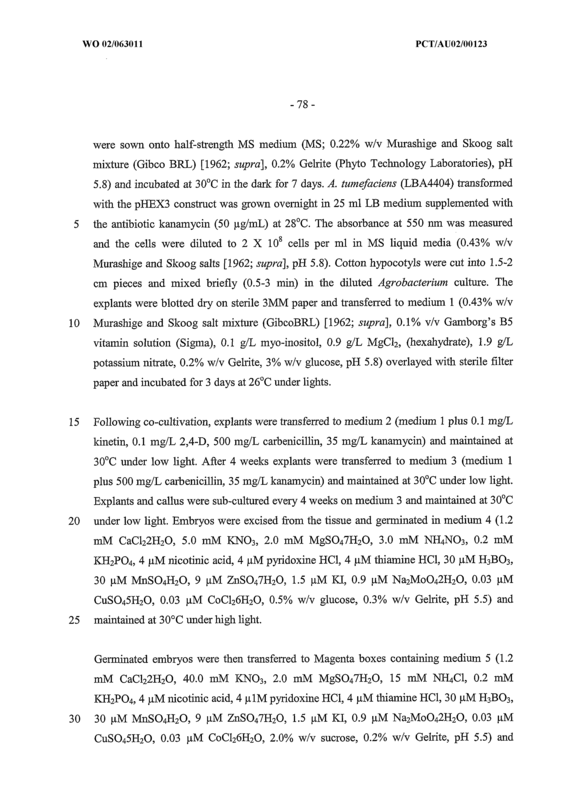 X29 =- no amino acid or Q.
Xδ3 no amino acid or A or S X84 no amino acid or A or E Xδ5 no amino acid or A or V Xδδ no amino acid or L or V Xδ7 no amino acid or L Xδ8 no amino acid or E Xδ9 no amino acid or E X90 no amino acid or E X91 no amino acid or I X92 no amino acid or M X93 no amino acid or D or M X94 no amino acid or N or E.
X9 = no amino acid or M X 3 = no amino acid or D or M X94 = no amino acid or N or E.
The isolated polypeptide of Claim 38 wherein the polypeptide is produced in one or more of pistils, ovaries or anthers of flowers of a plant. 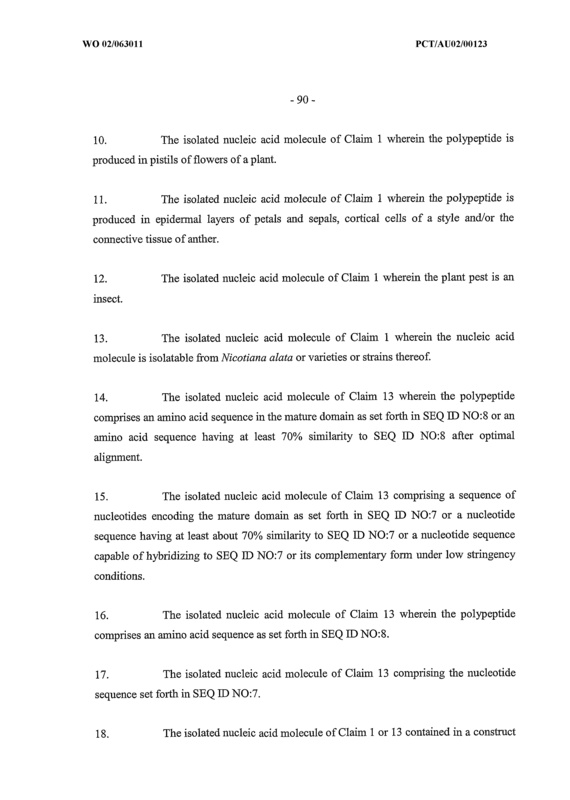 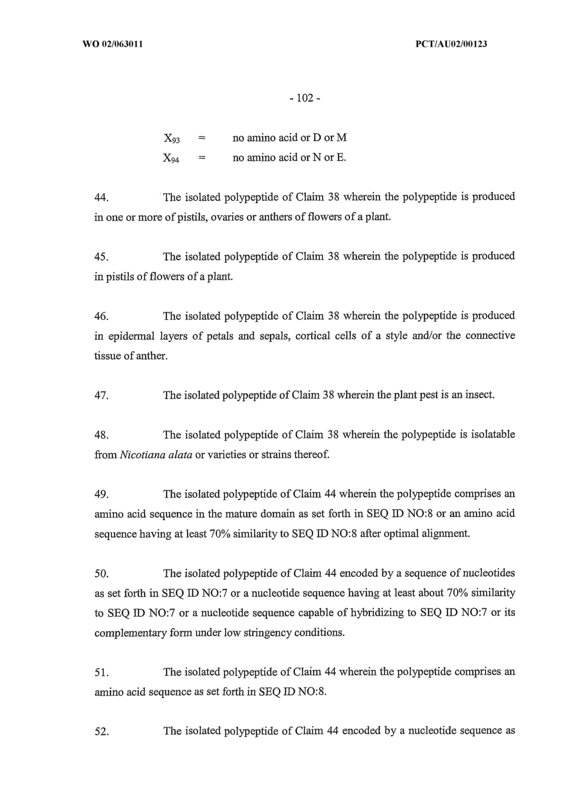 The isolated polypeptide of Claim 38 wherem the polypeptide is produced in pistils of flowers of a plant. 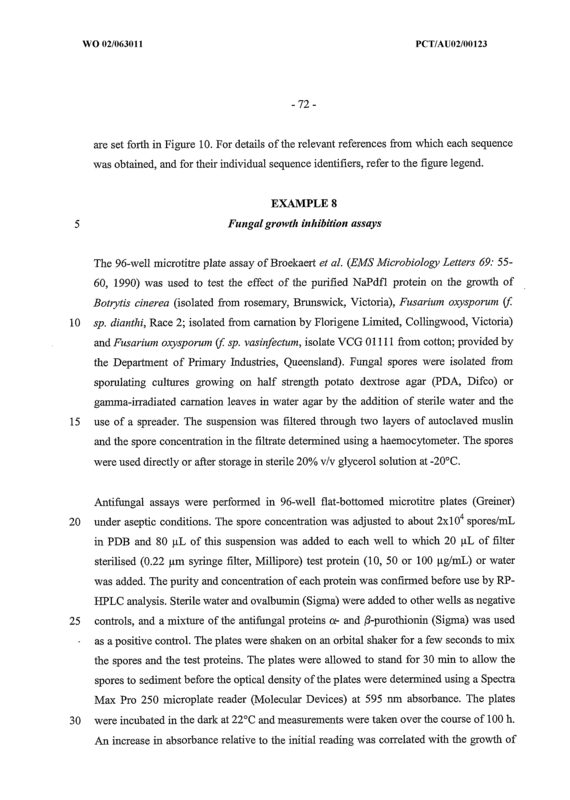 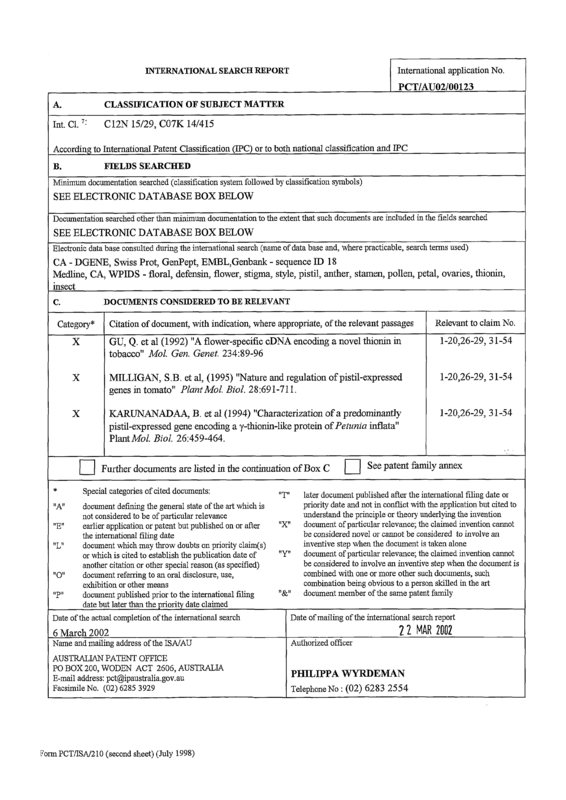 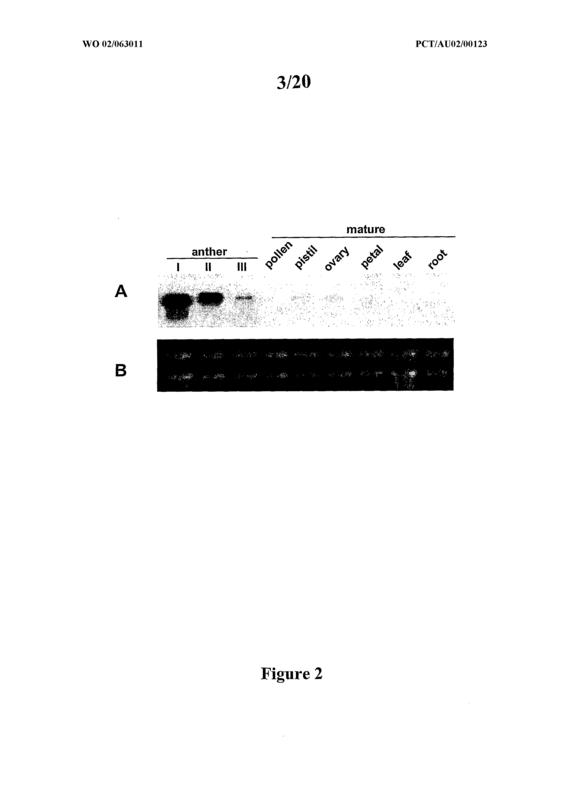 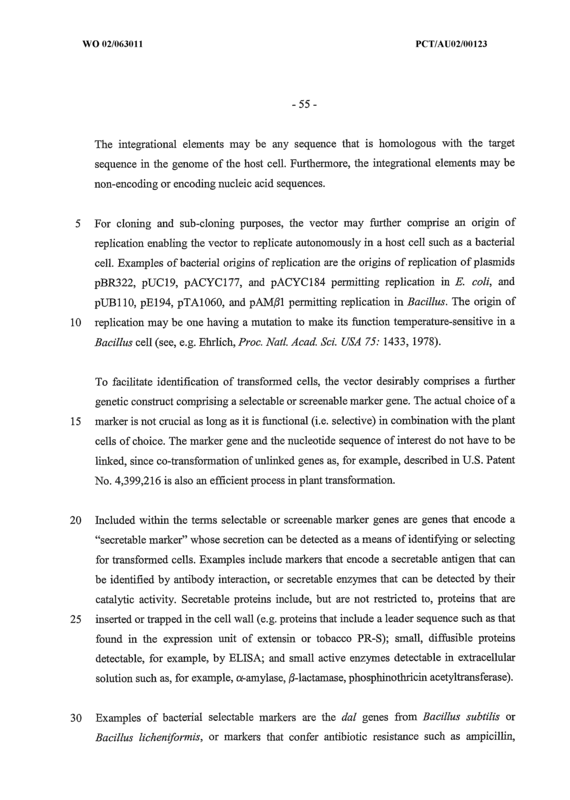 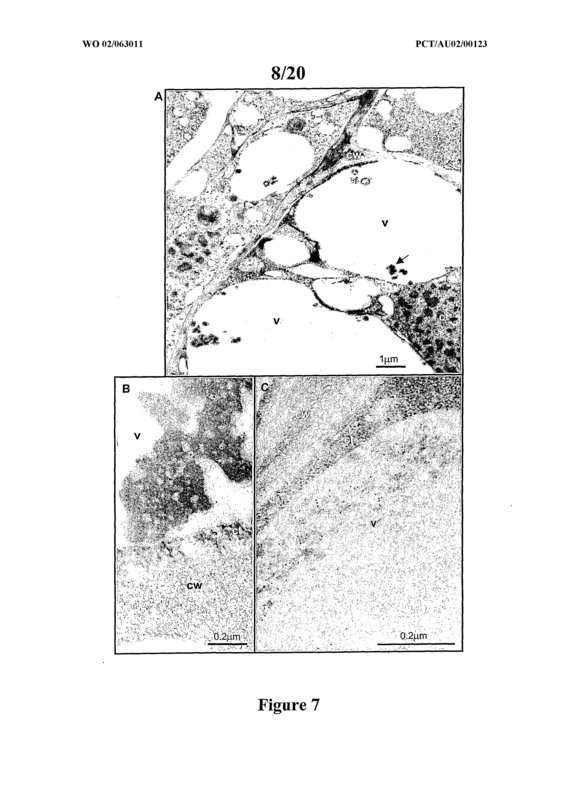 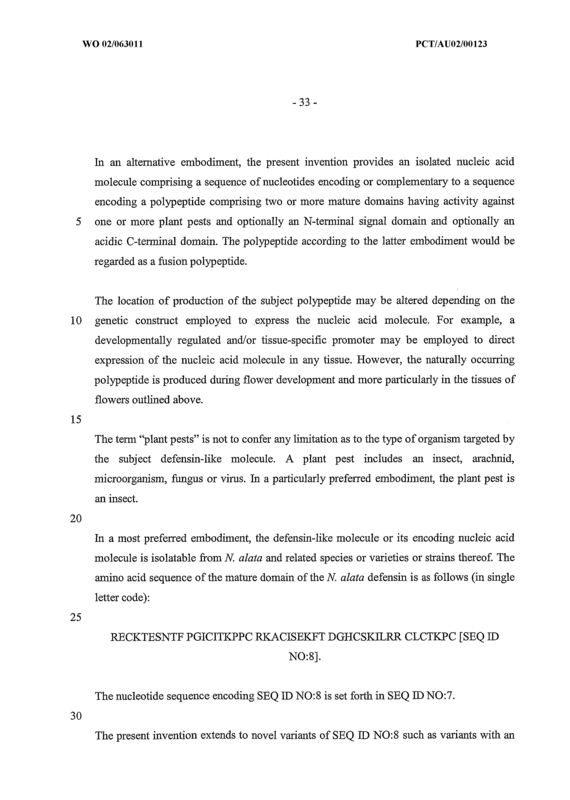 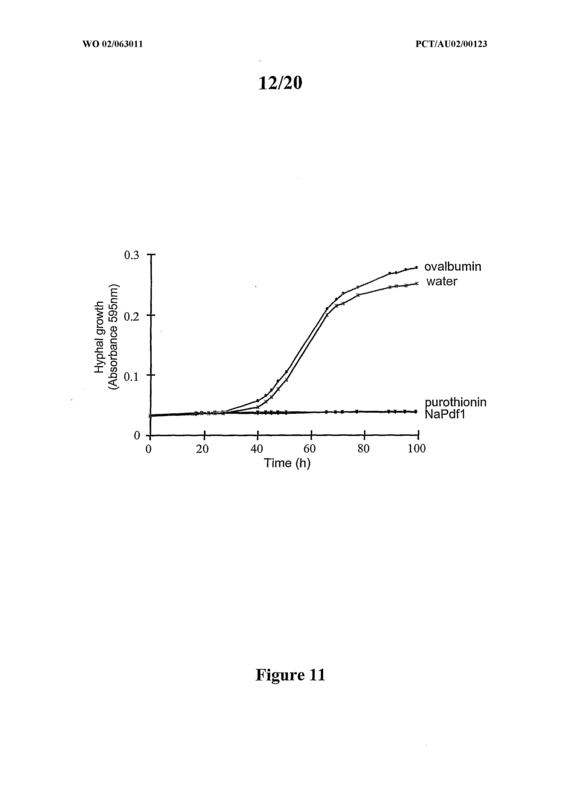 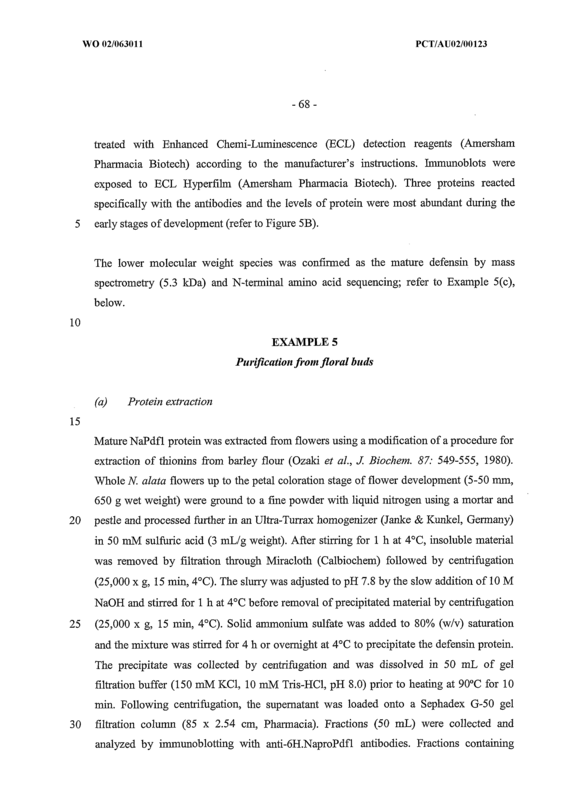 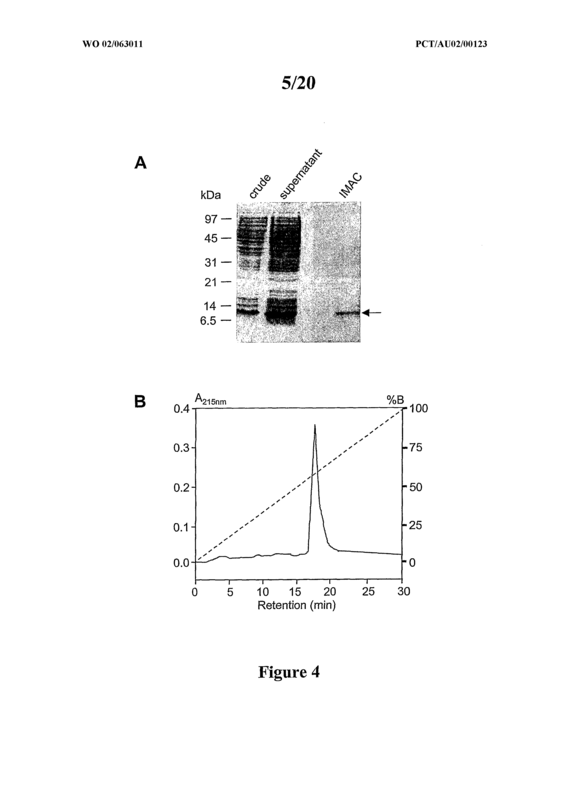 The isolated polypeptide of Claim 38 wherein the polypeptide is produced in epideπnal layers of petals and sepals, cortical cells of a style and/or the connective tissue of anther. 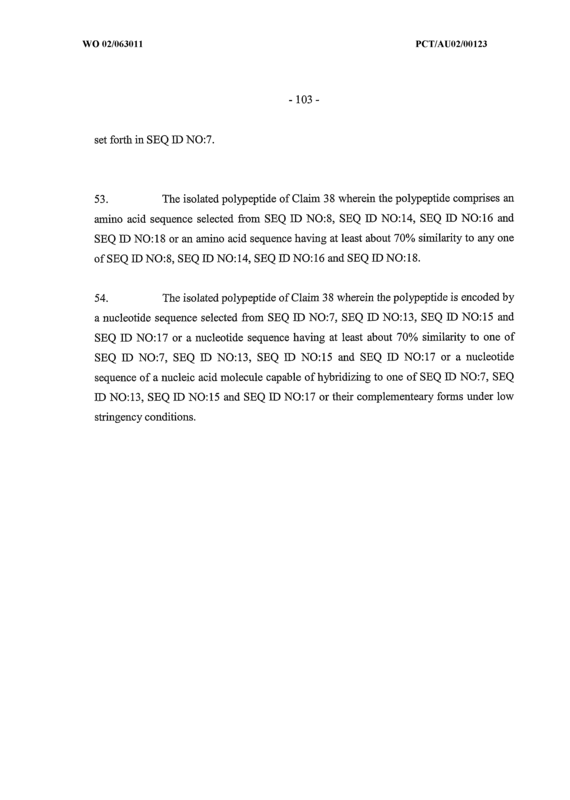 The isolated polypeptide of Claim 38 wherein the plant pest is an insect. 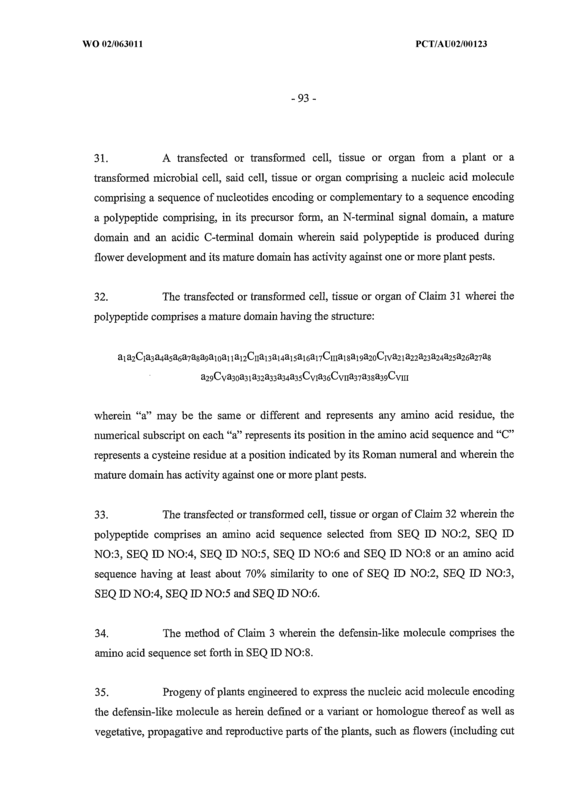 The isolated polypeptide of Claim 38 wherein the polypeptide is isolatable from Nicotiana alata or varieties or strains thereof. 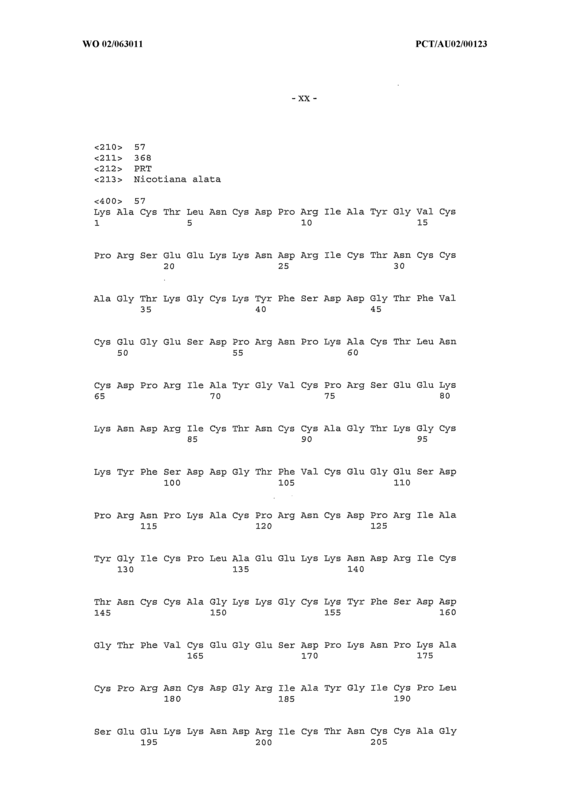 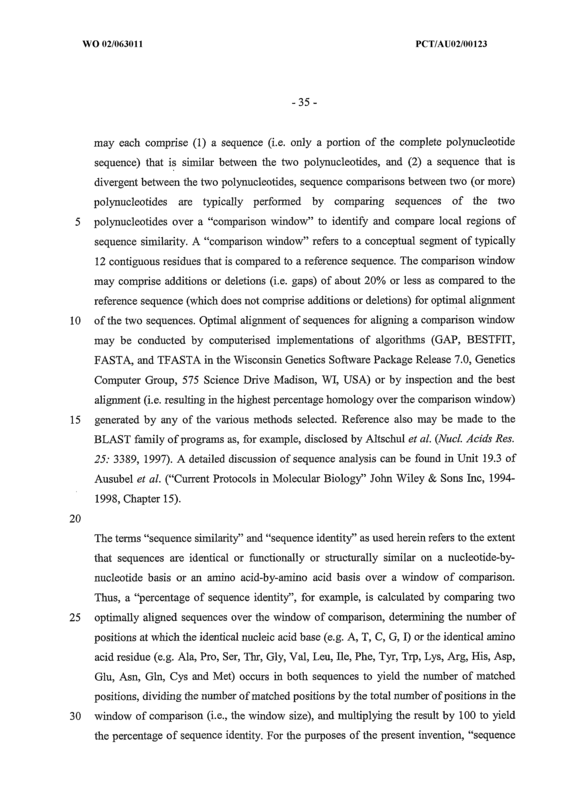 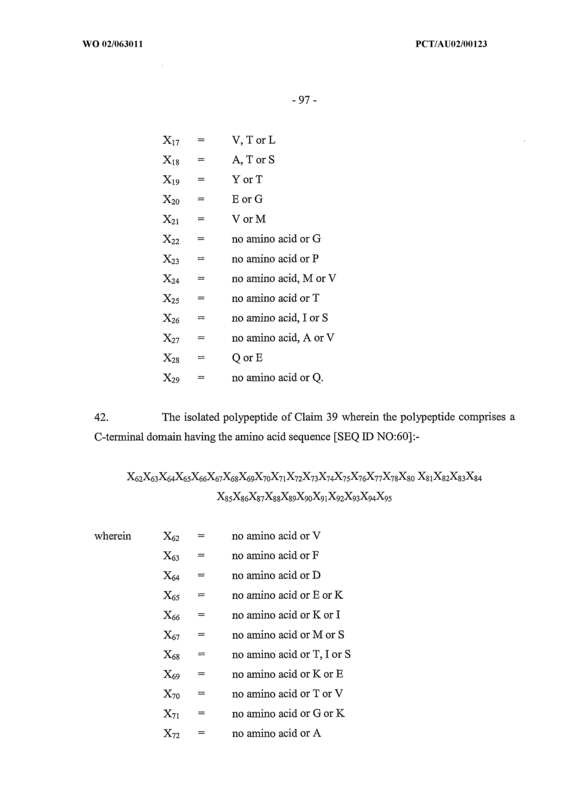 The isolated polypeptide of Claim 44 wherein the polypeptide comprises an amino acid sequence in the mature domain as set forth in SEQ ED NO: 8 or an amino acid sequence having at least 70% similarity to SEQ ED NO: 8 after optimal alignment. 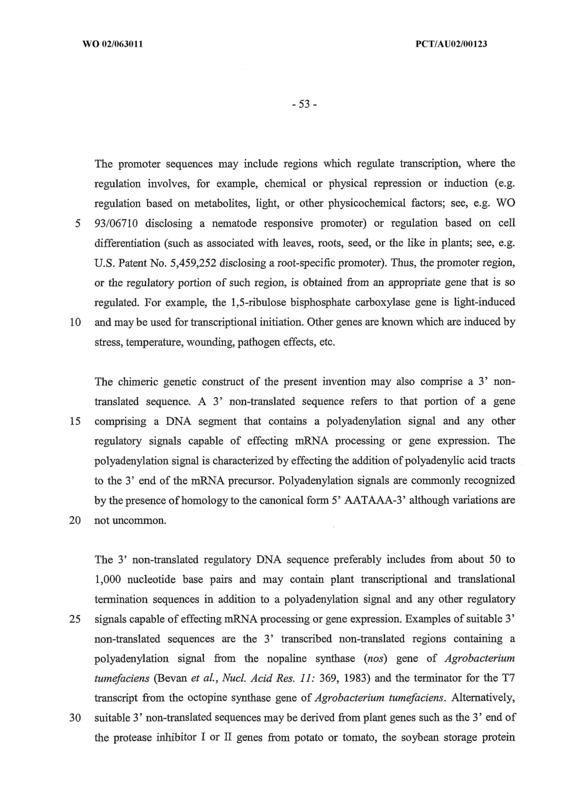 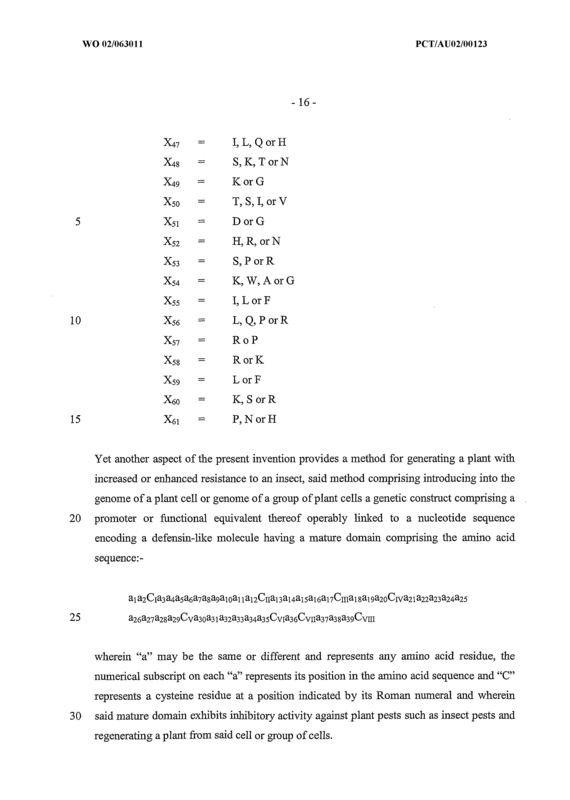 The isolated polypeptide of Claim 44 encoded by a sequence of nucleotides as set forth in SEQ ED NO:7 or a nucleotide sequence having at least about 70% similarity to SEQ ID NO:7 or a nucleotide sequence capable of hybridizing to SEQ ED NO:7 or its complementary form under low stringency conditions. 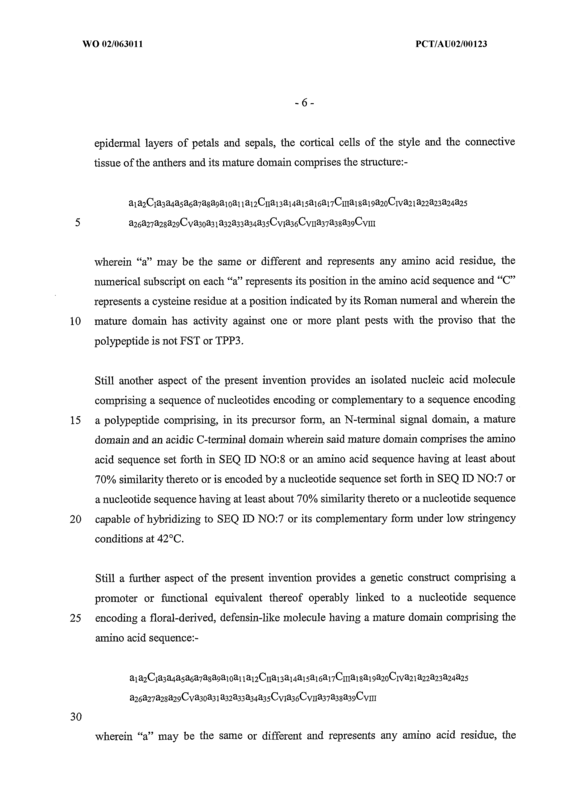 The isolated polypeptide of Claim 44 wherein the polypeptide comprises an amino acid sequence as set forth in SEQ ED NO:8. 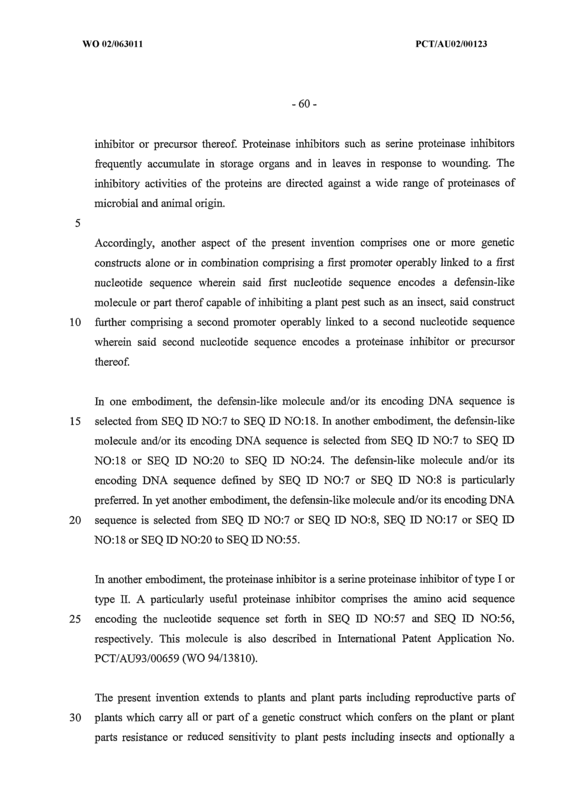 The isolated polypeptide of Claim 44 encoded by a nucleotide sequence as set forth in SEQ JD NO:7. 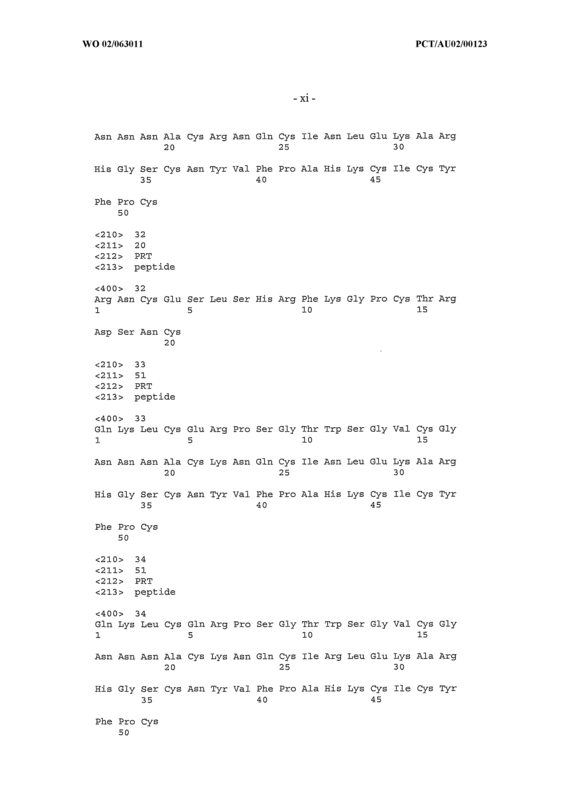 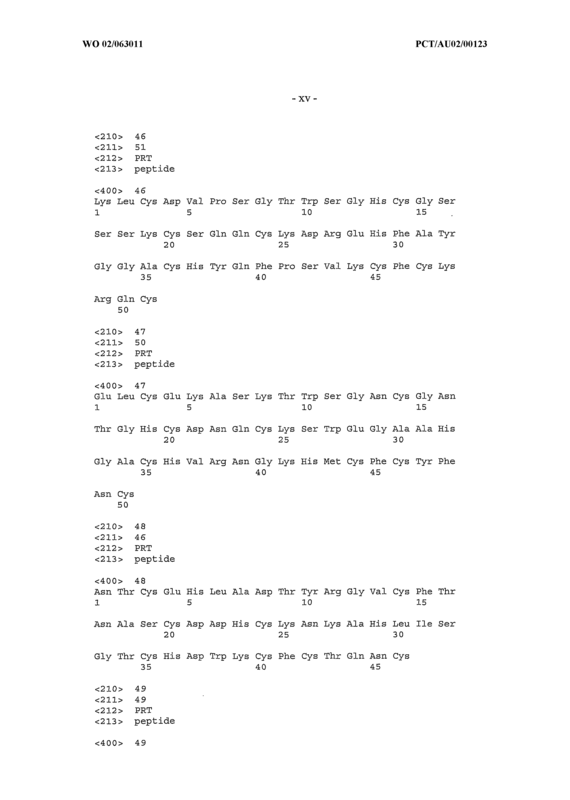 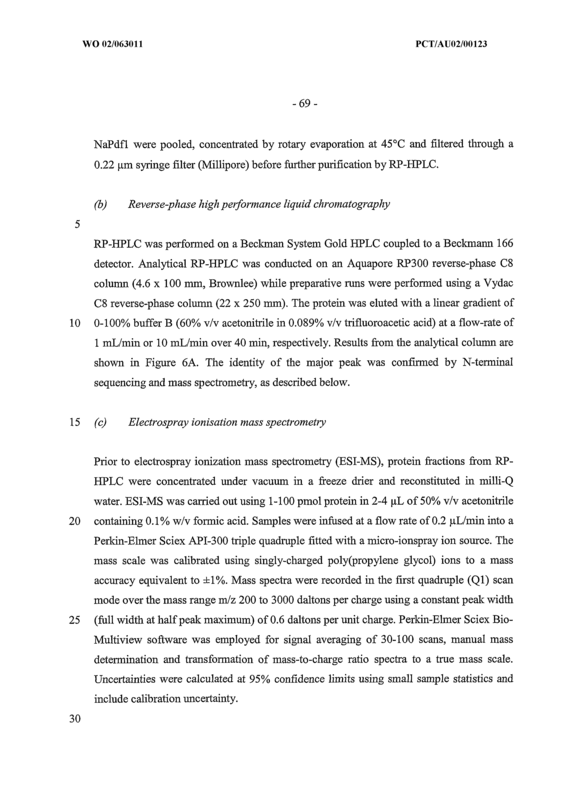 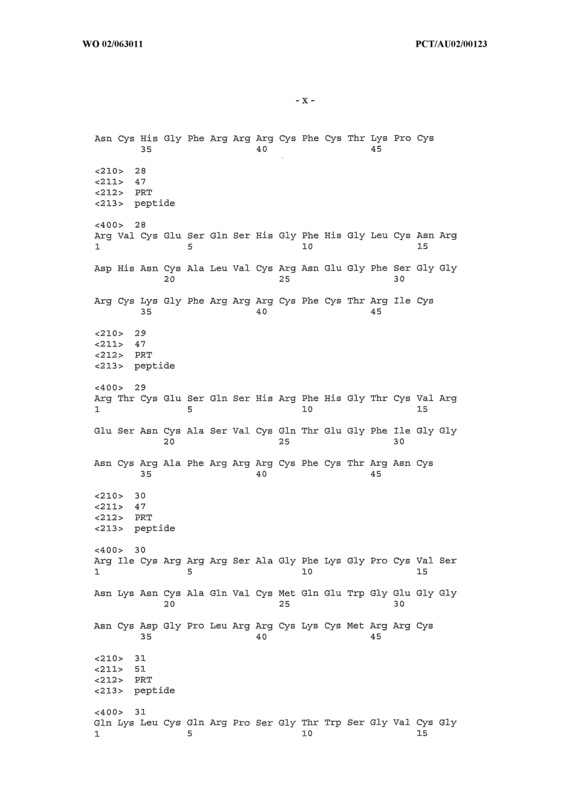 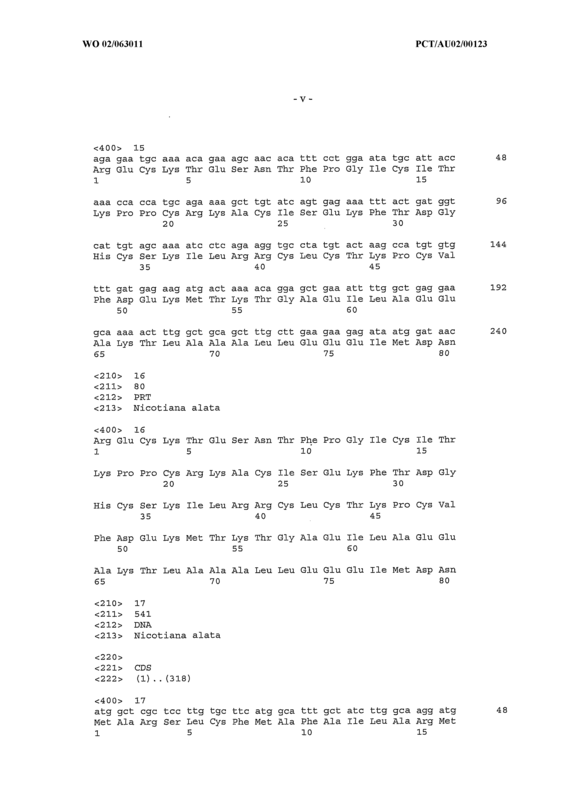 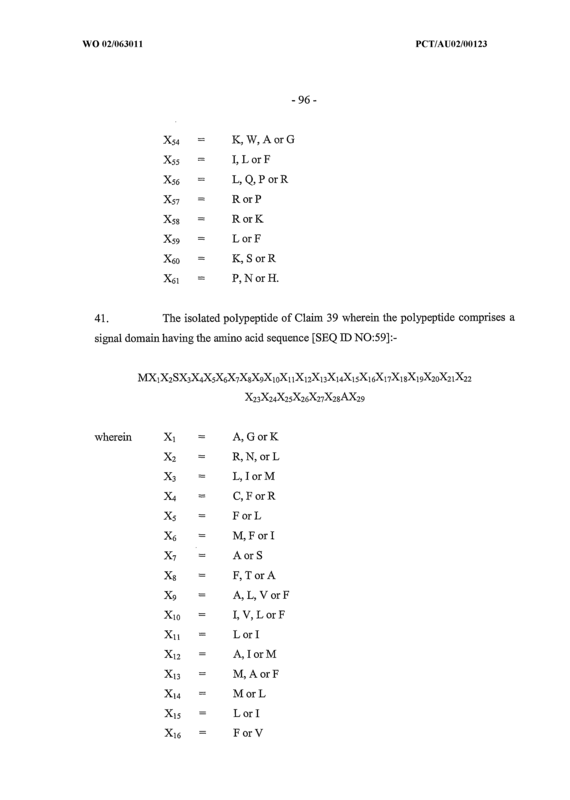 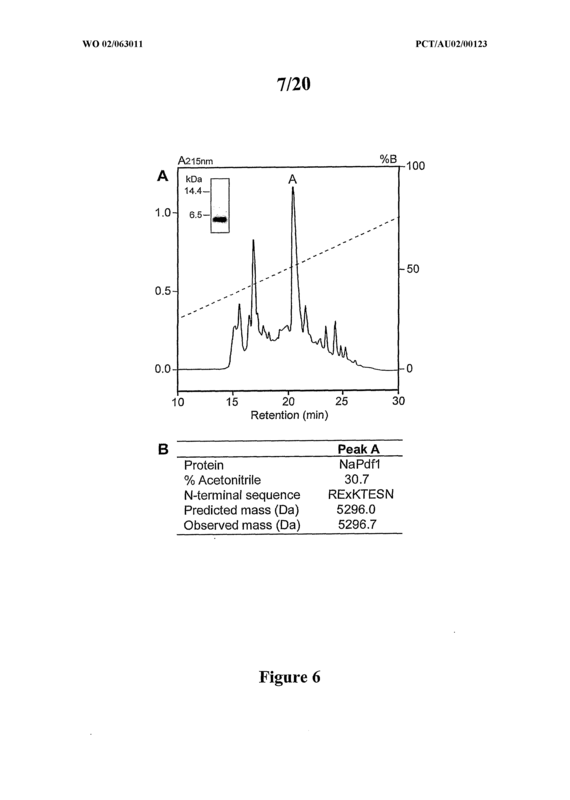 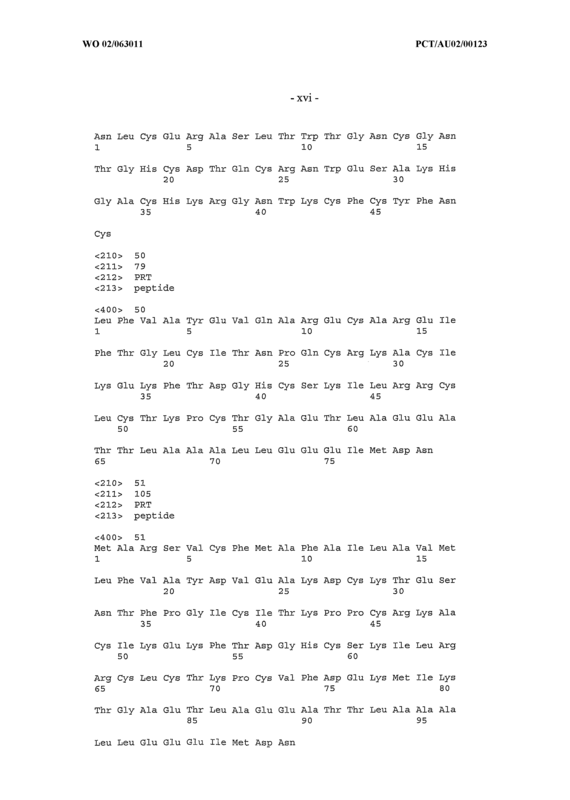 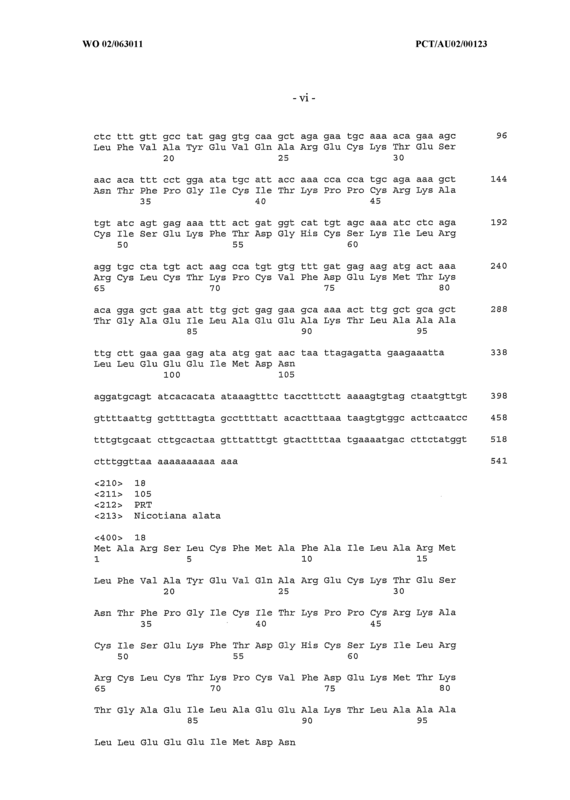 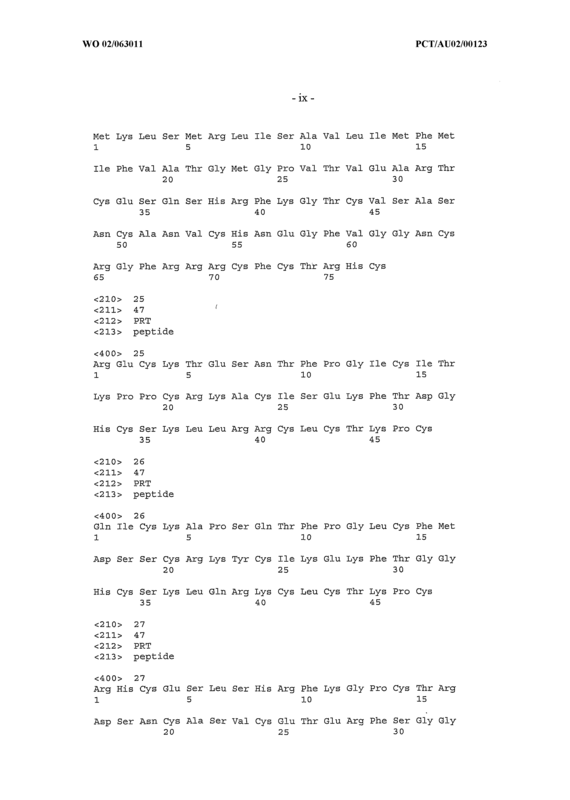 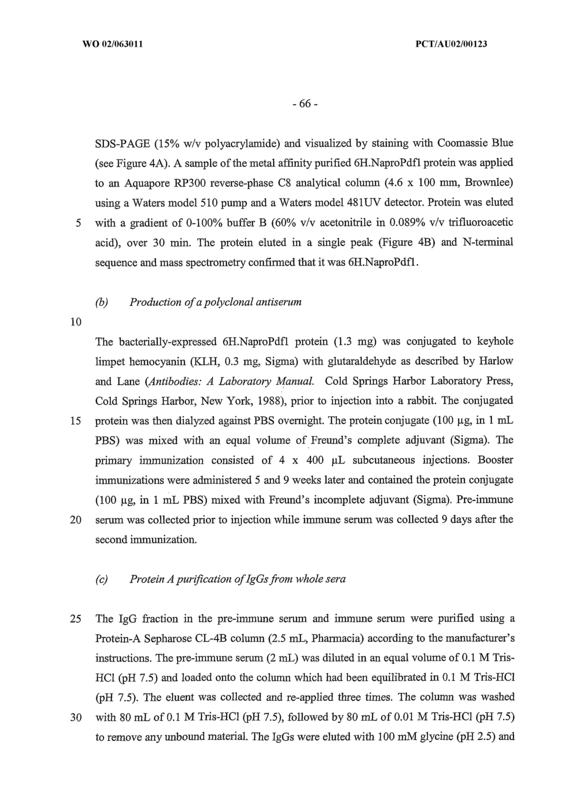 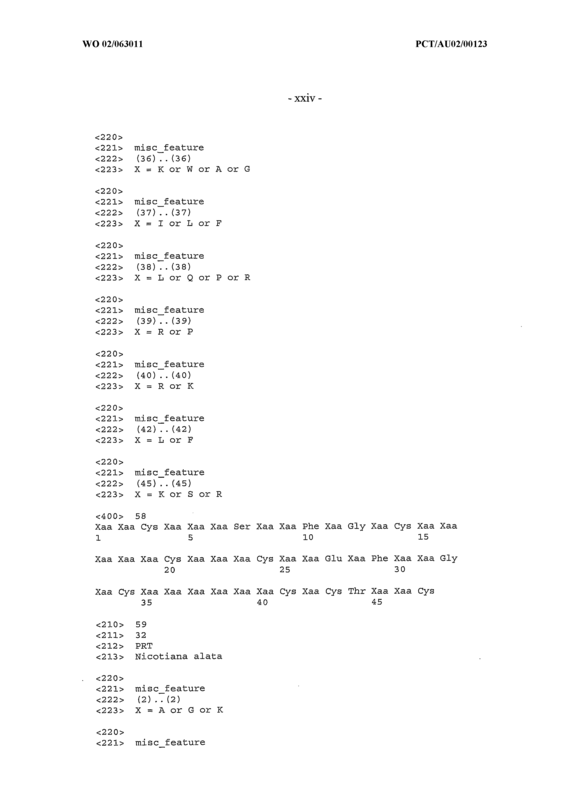 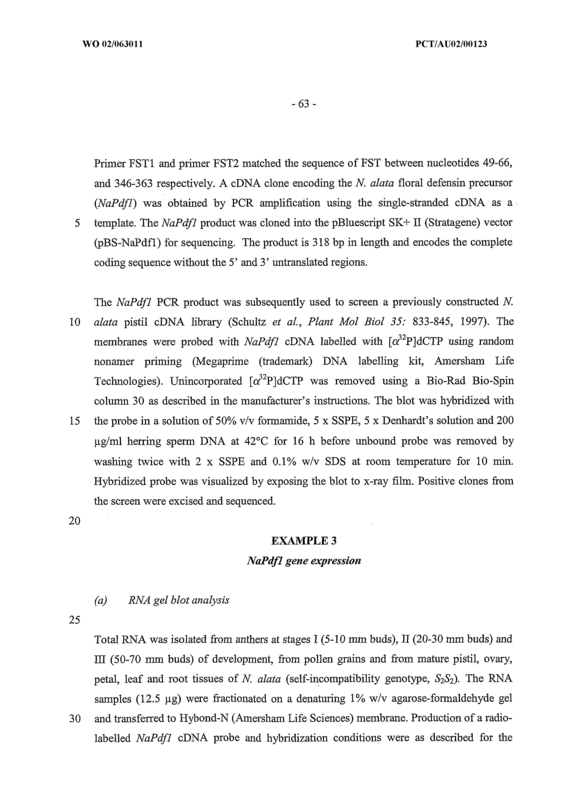 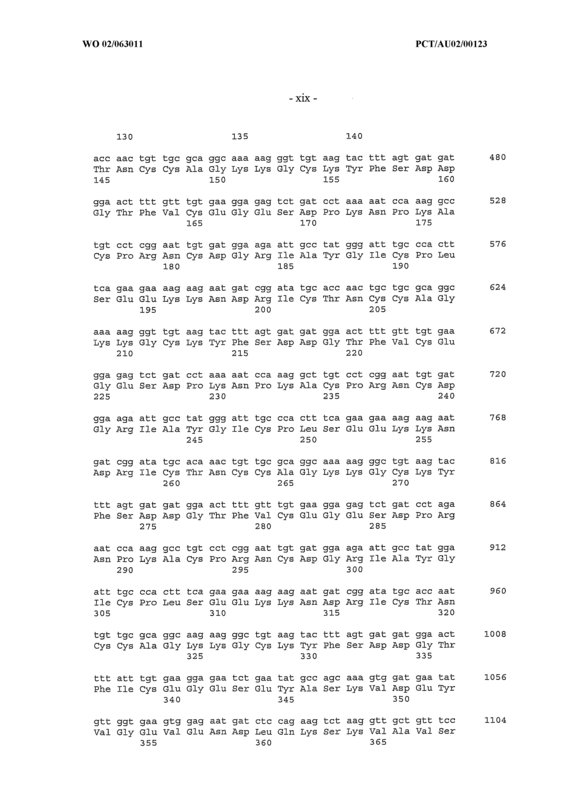 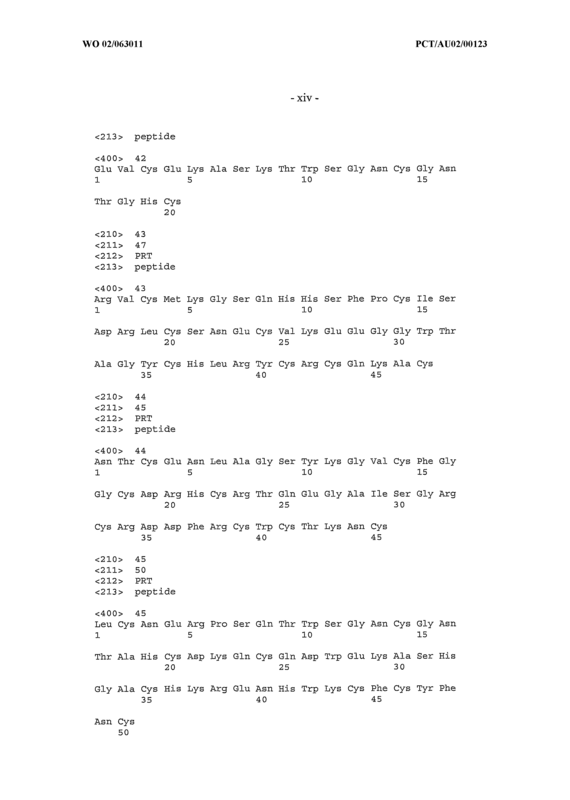 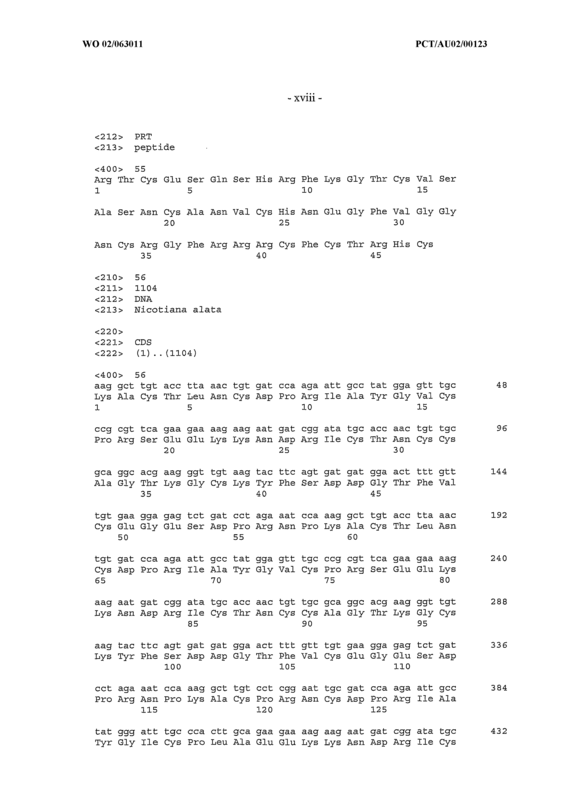 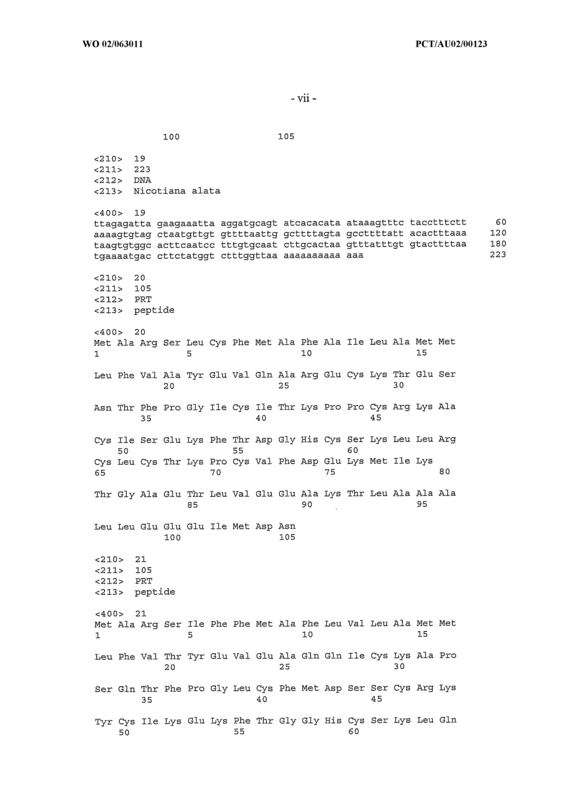 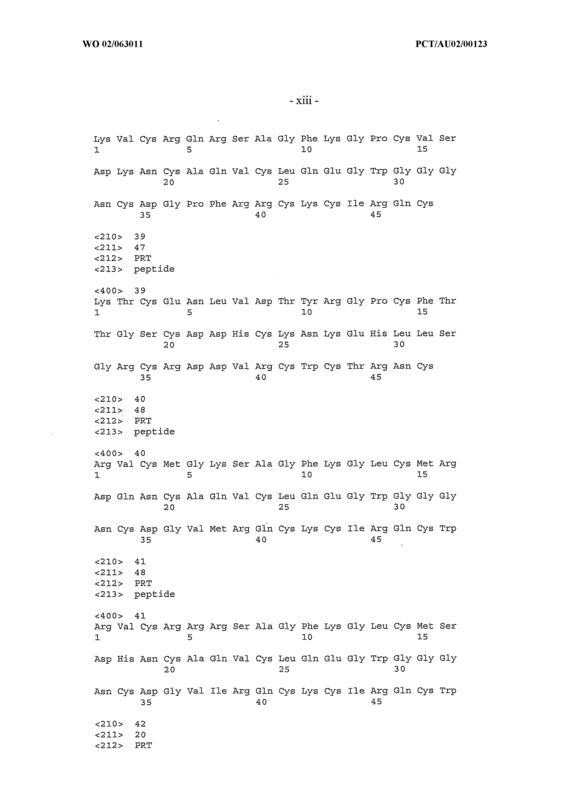 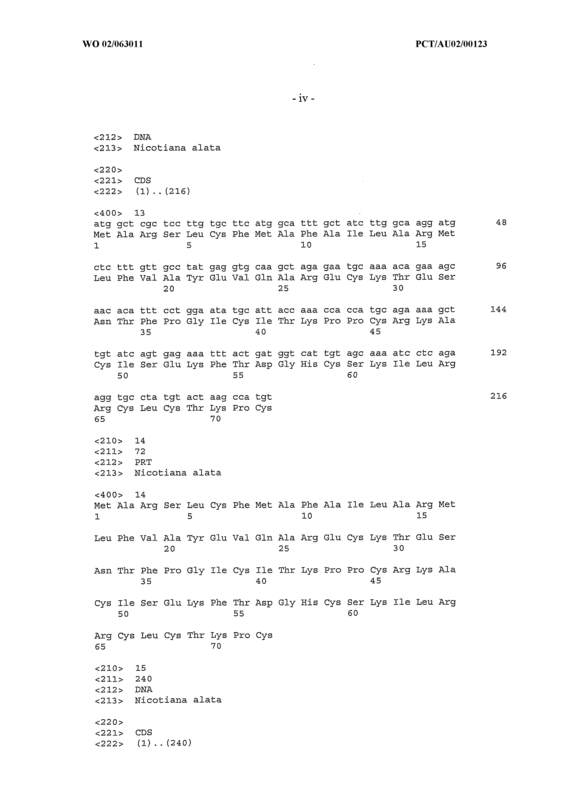 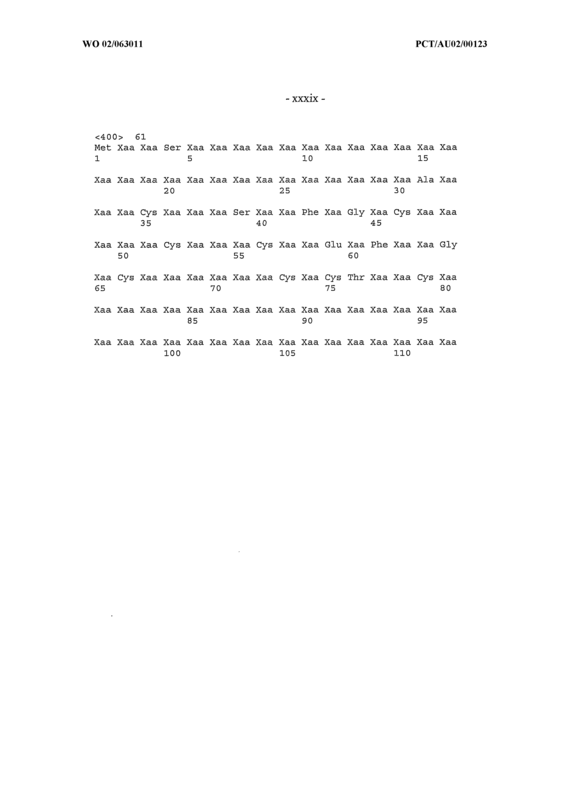 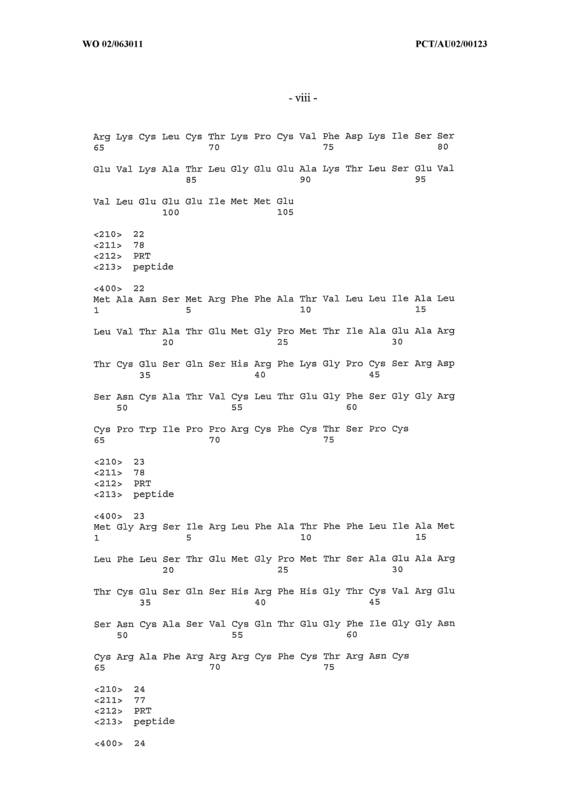 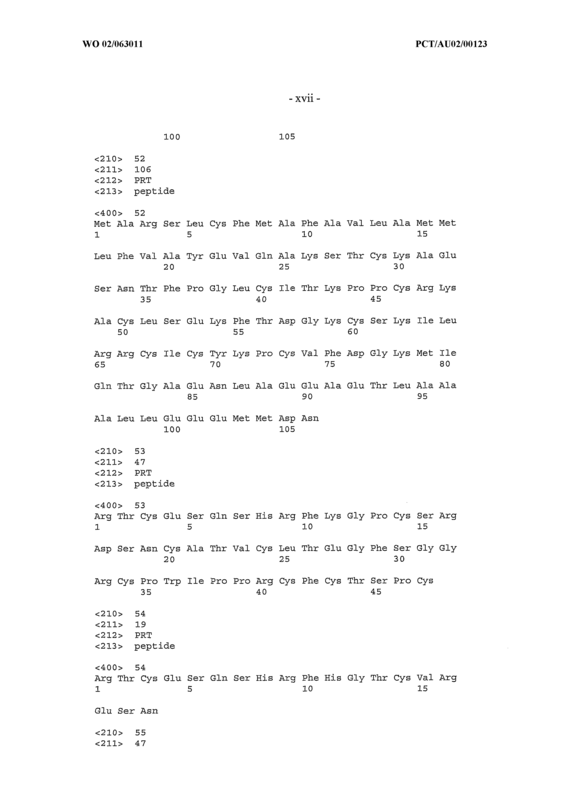 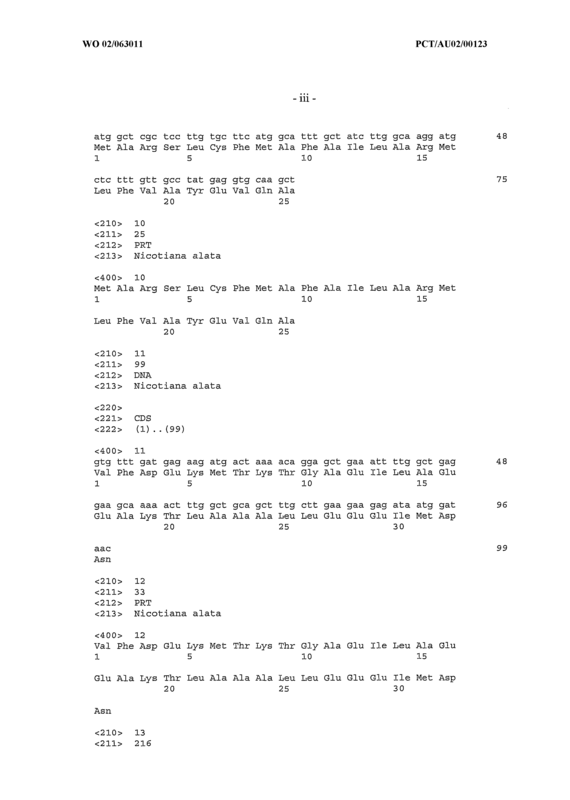 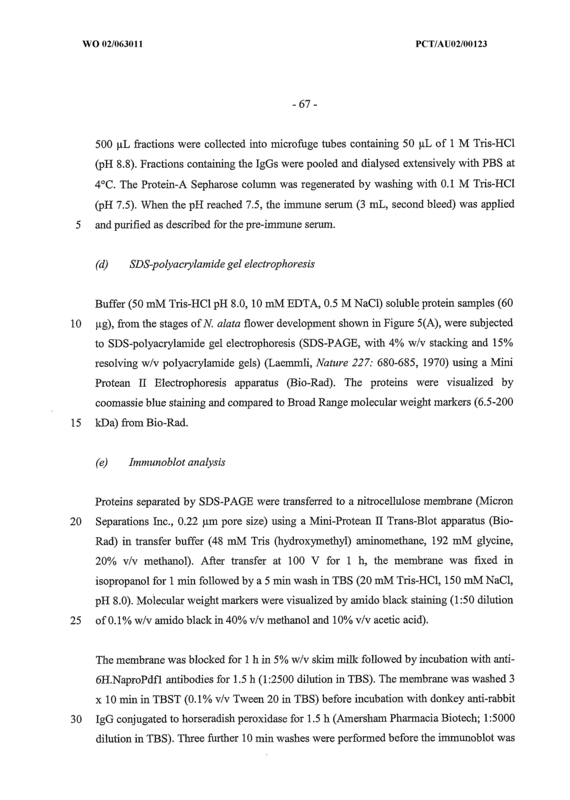 The isolated polypeptide of Claim 38 wherein the polypeptide comprises an amino acid sequence selected from SEQ ED NO:8, SEQ ED NO:14, SEQ ED NO:16 and SEQ ED NO: 18 or an amino acid sequence having at least about 70% similarity to any one of SEQ ED NO:8, SEQ ED NO:14, SEQ ED NO:16 and SEQ ED NO:18. 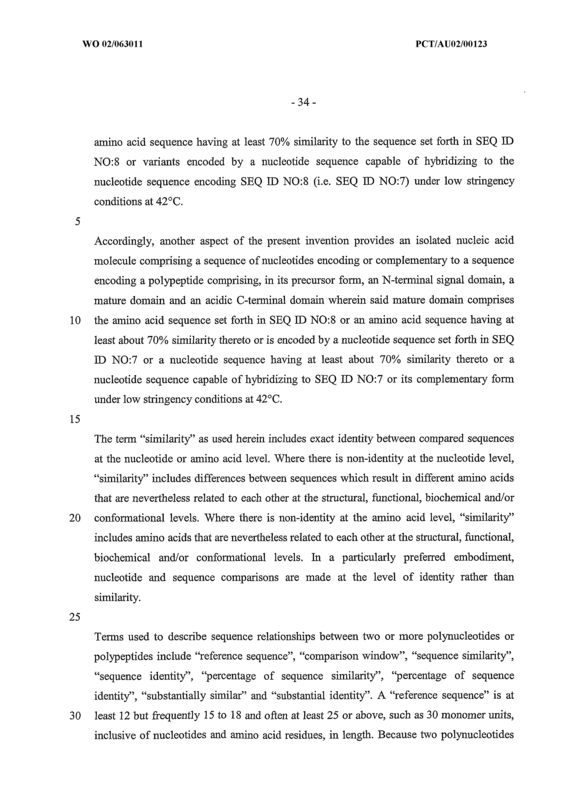 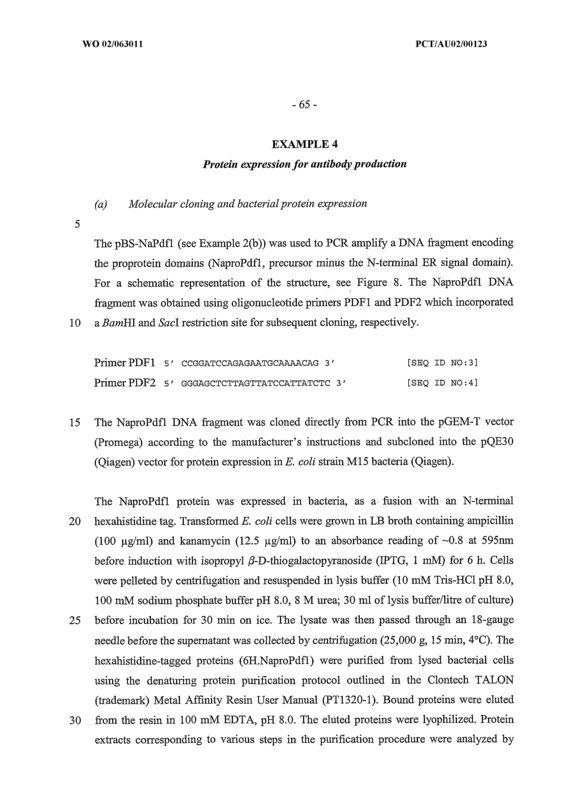 The isolated polypeptide of Claim 38 wherein the polypeptide is encoded by a nucleotide sequence selected from SEQ ED NO:7, SEQ ED NO: 13, SEQ ED NO: 15 and SEQ ED NO: 17 or a nucleotide sequence having at least about 70% similarity to one of SEQ JD NO:7, SEQ ED NO:13, SEQ ED NO:15 and SEQ ED NO:17 or a nucleotide sequence of a nucleic acid molecule capable of hybridizing to one of SEQ JD NO:7, SEQ ED NO:13, SEQ ED NO:15 and SEQ ED NO:17 or their complementeary forms under low stringency conditions.